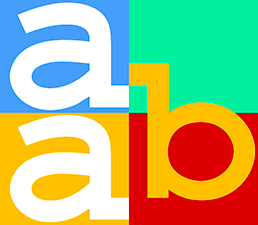 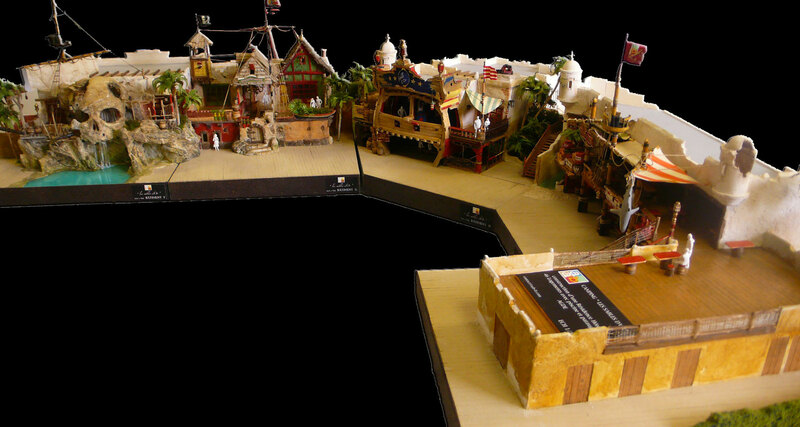 AAB designs and builds thematic decors to thoroughly immerse your customers in your universe. 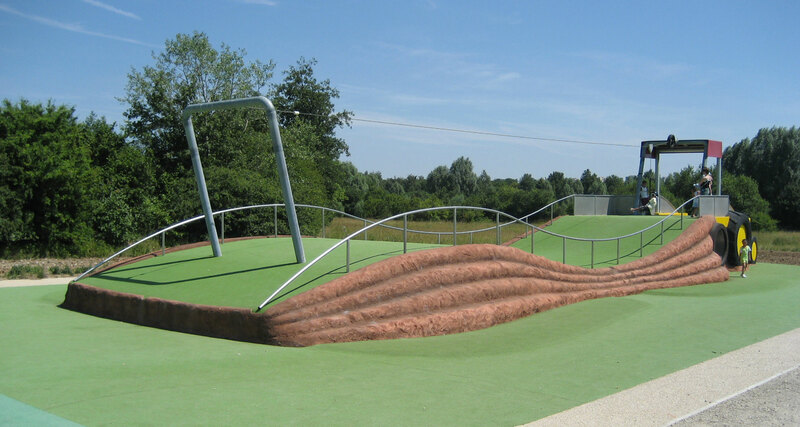 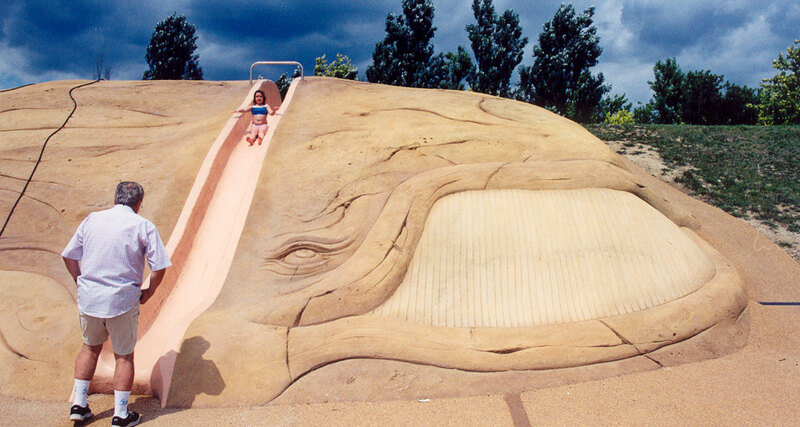 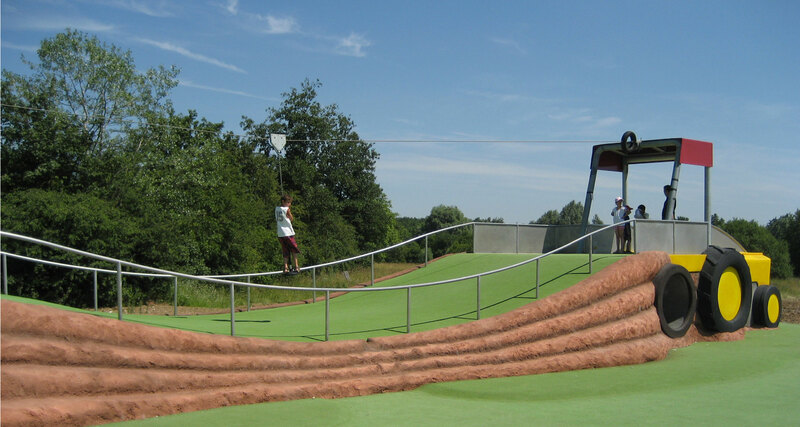 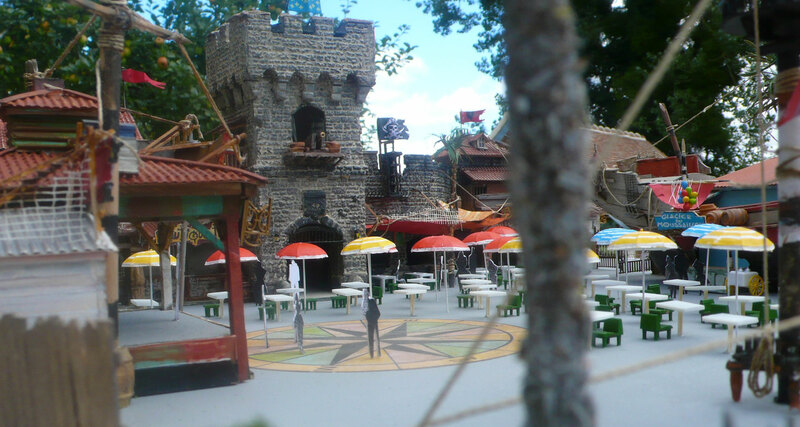 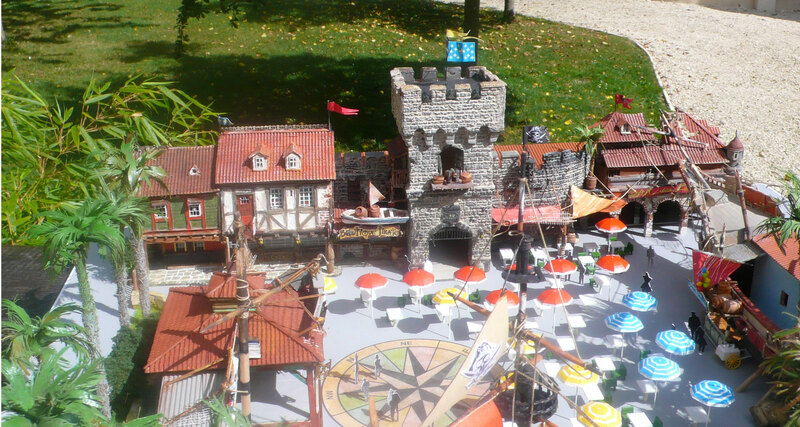 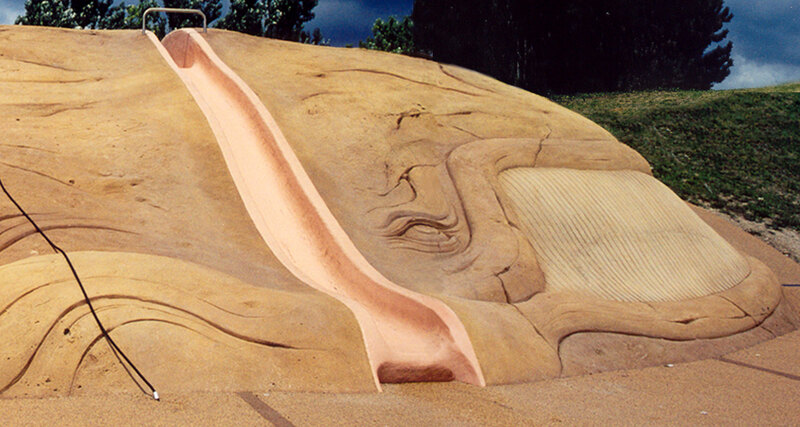 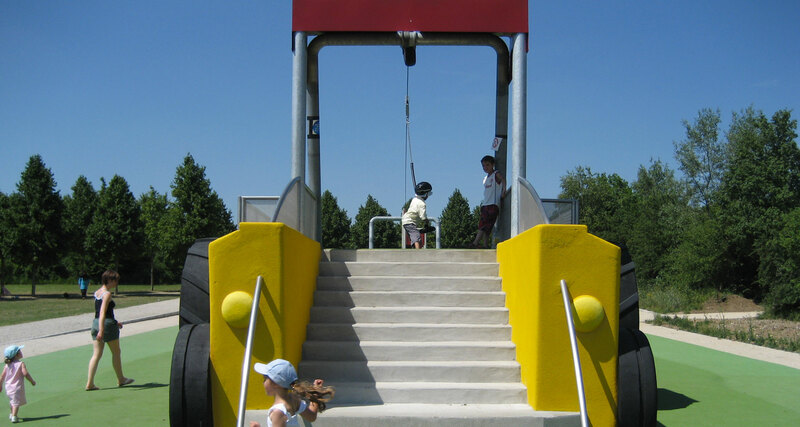 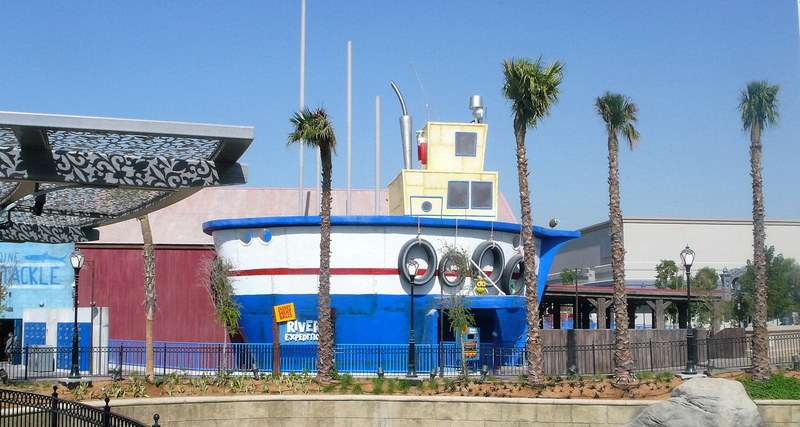 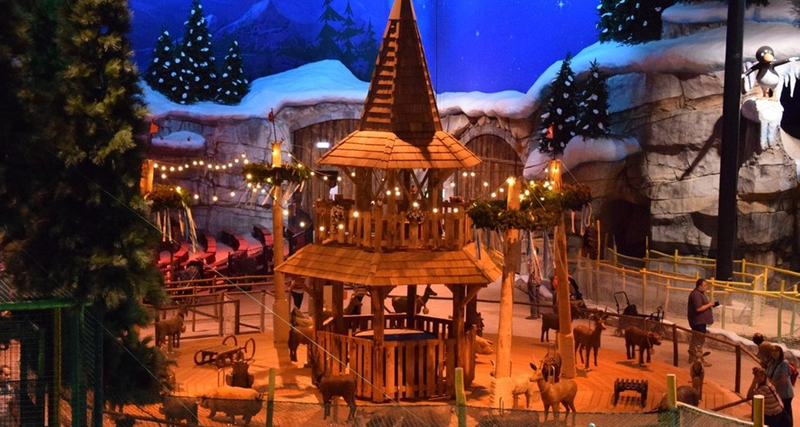 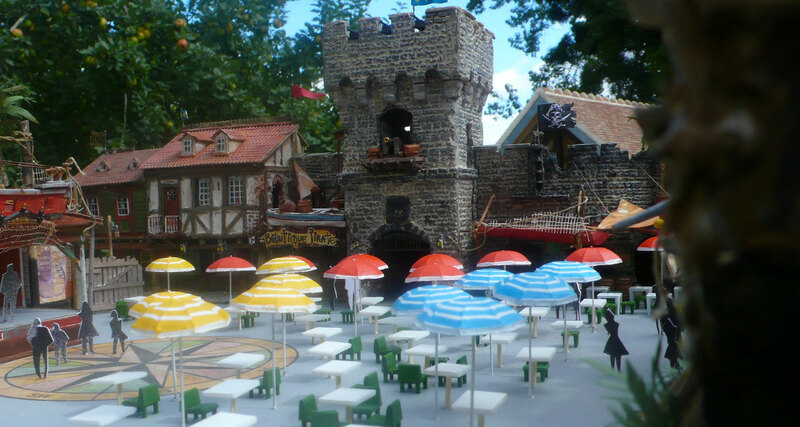 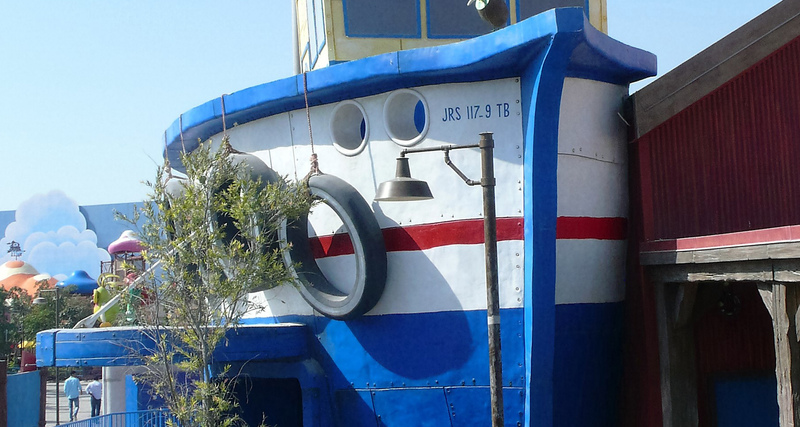 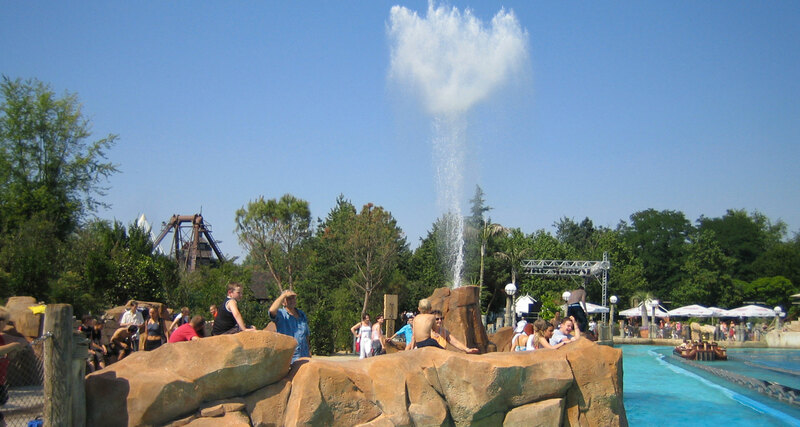 For example, AAB produces merry-go-round decors for theme parks, rockfills in aquatic parks, and play area theming for municipalities and restaurants. 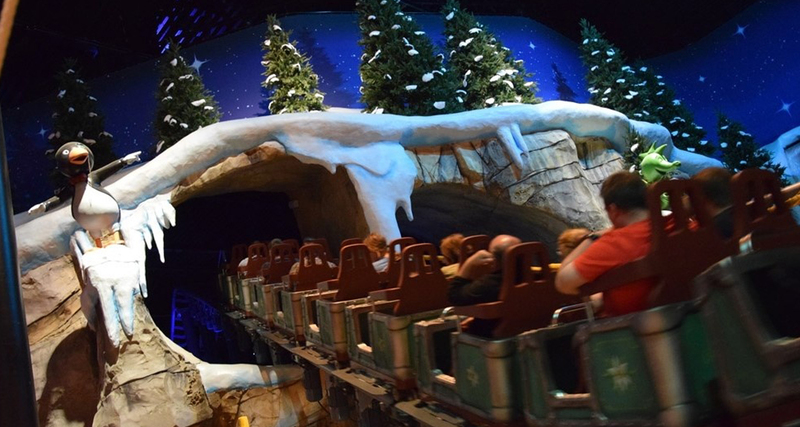 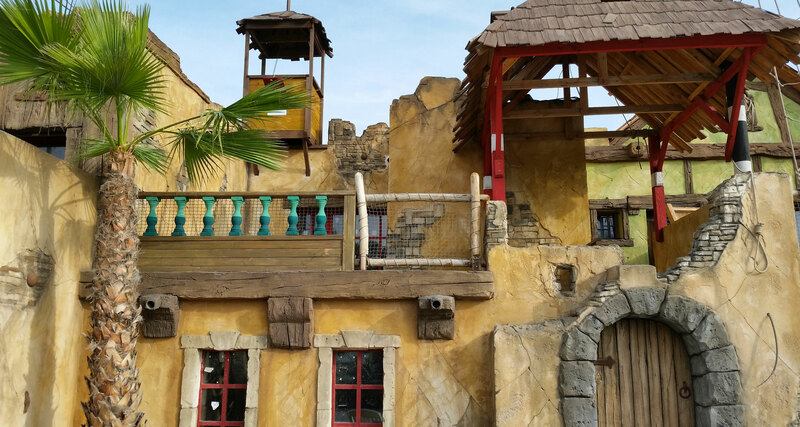 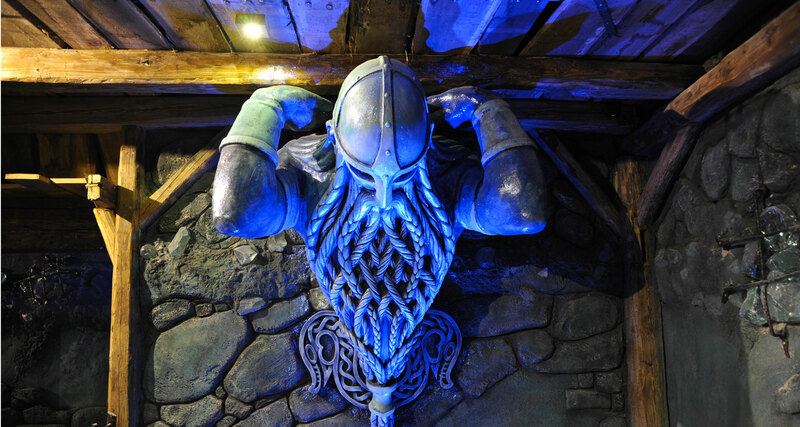 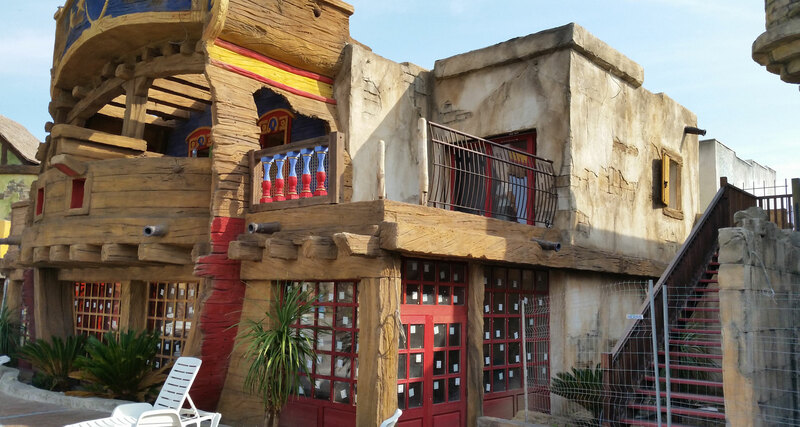 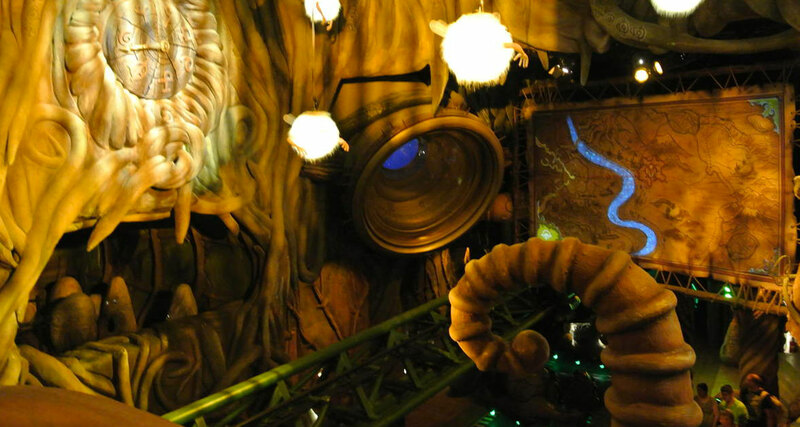 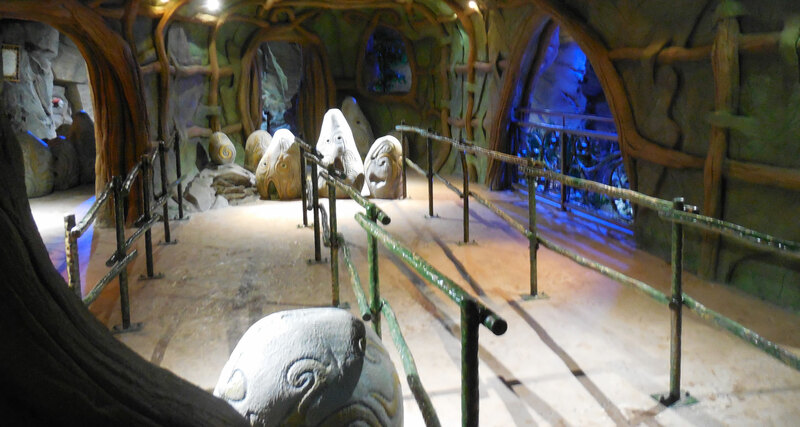 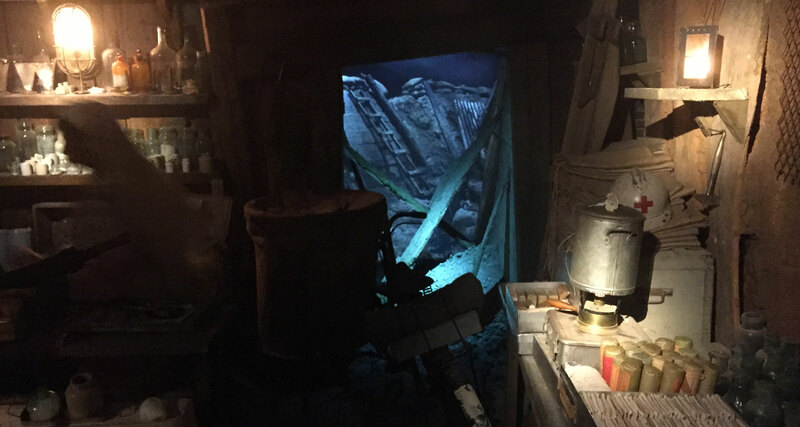 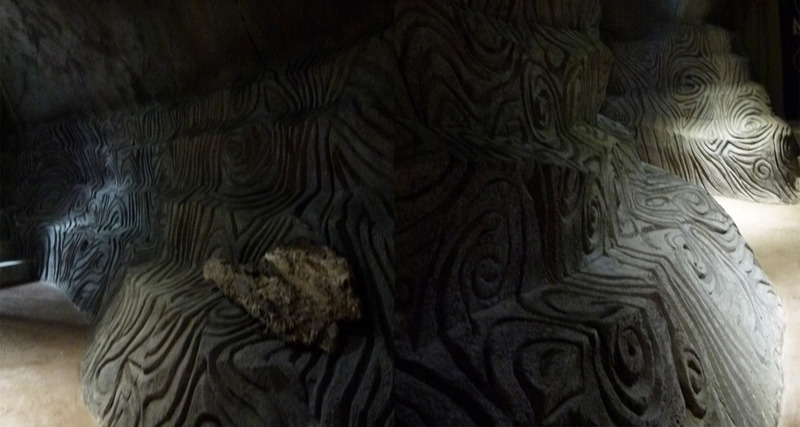 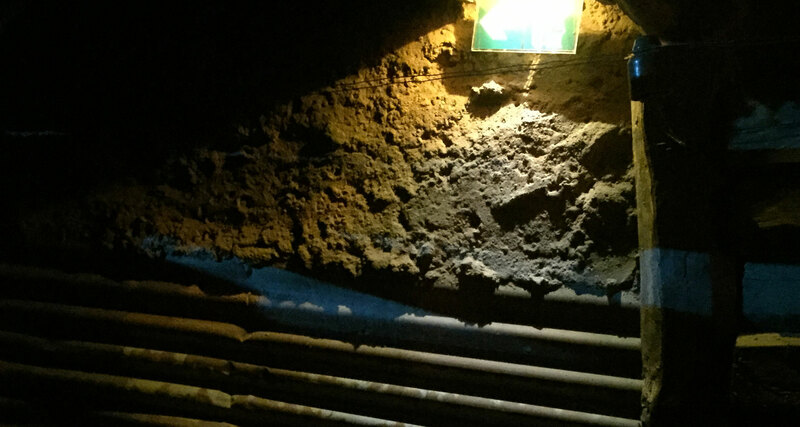 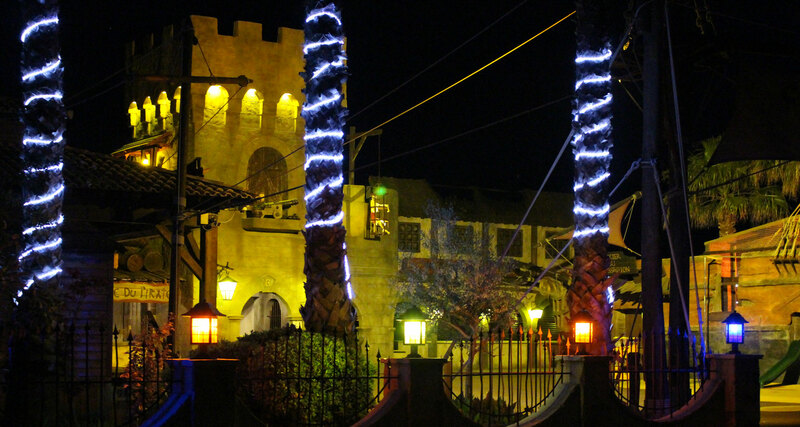 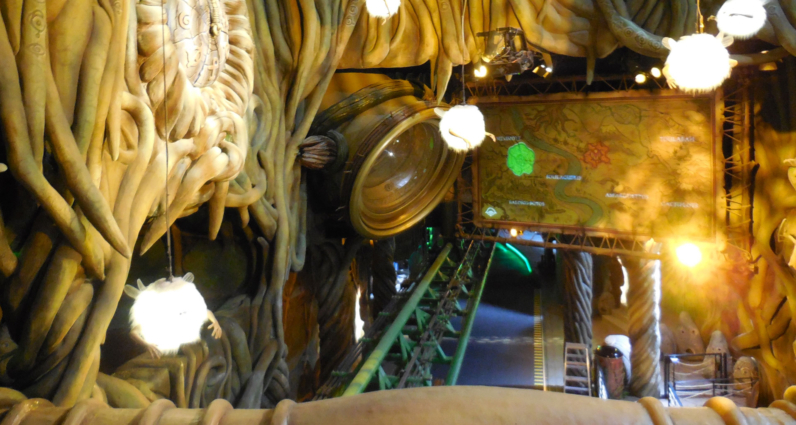 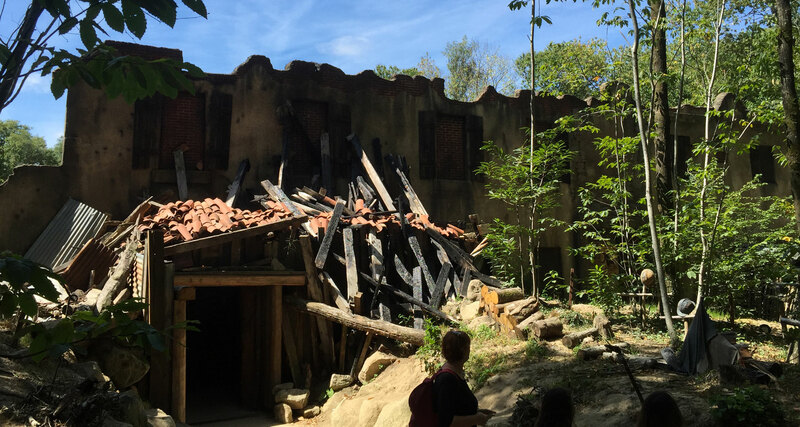 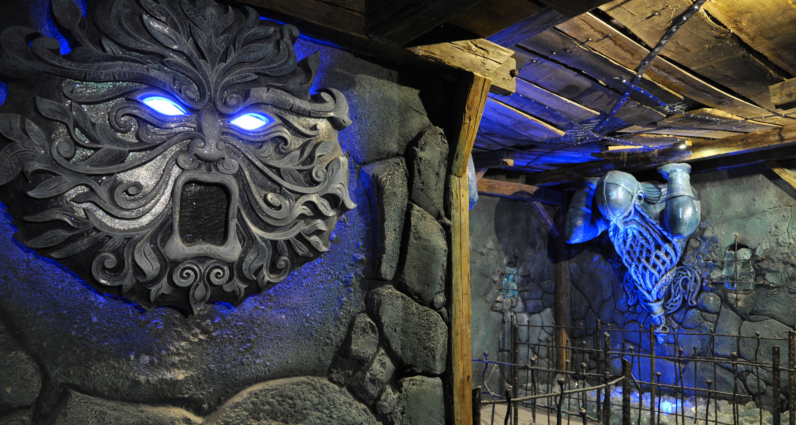 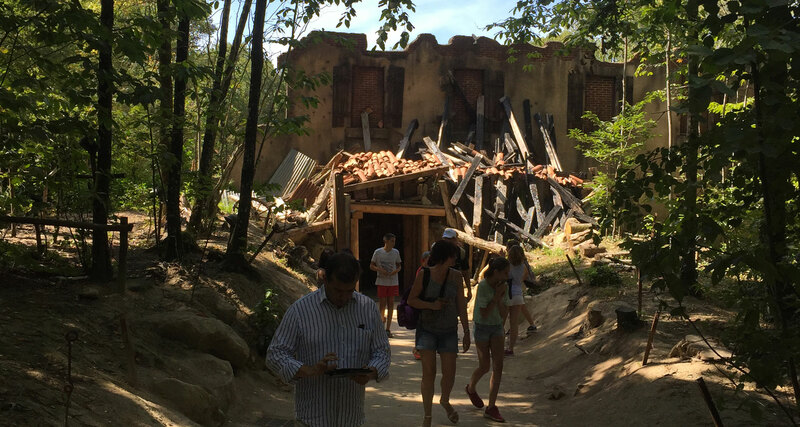 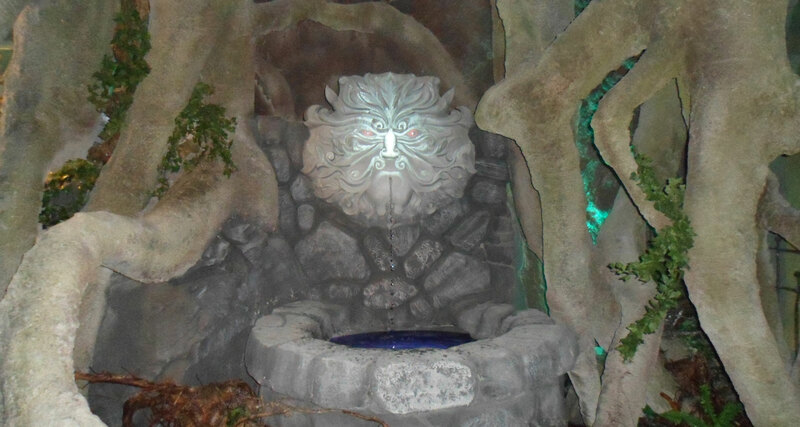 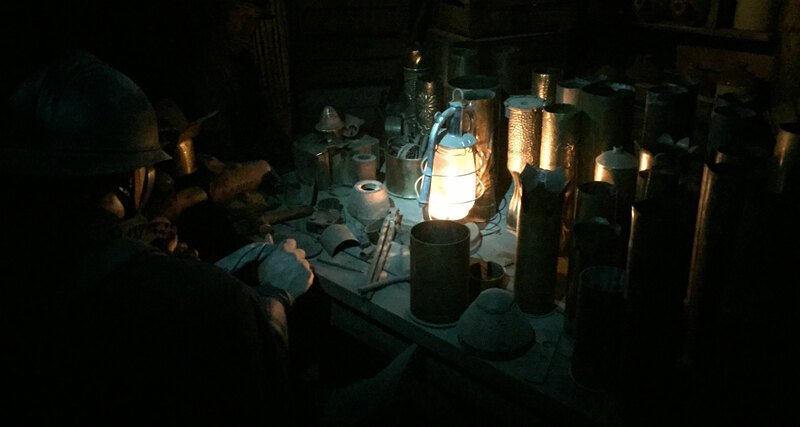 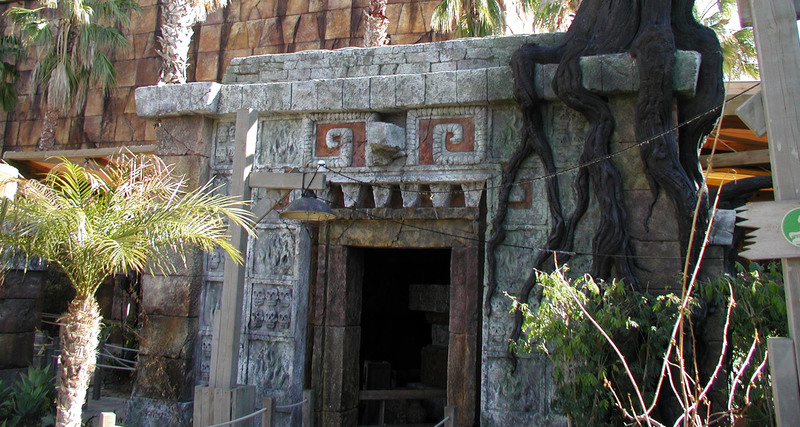 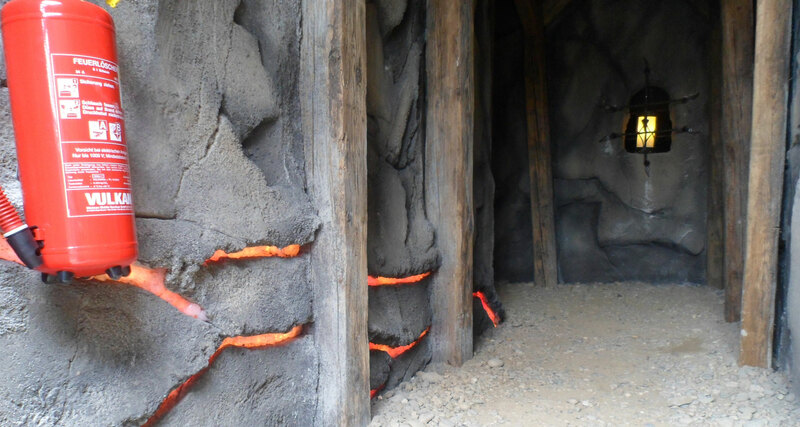 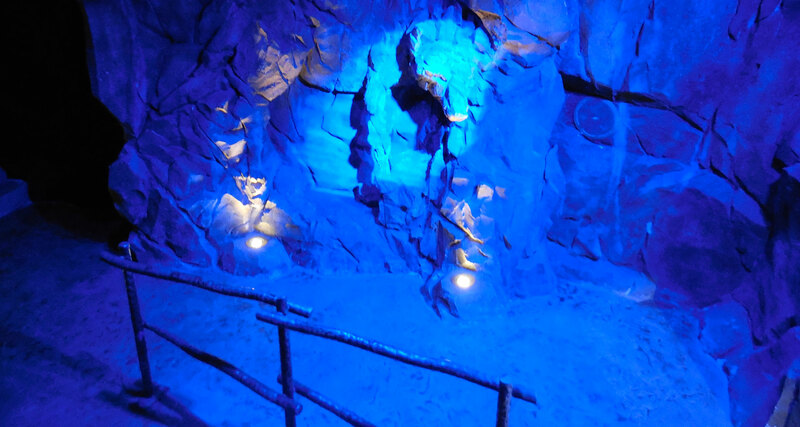 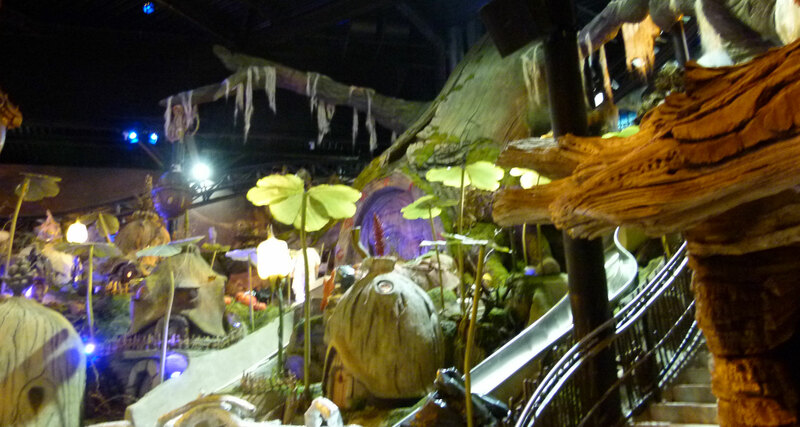 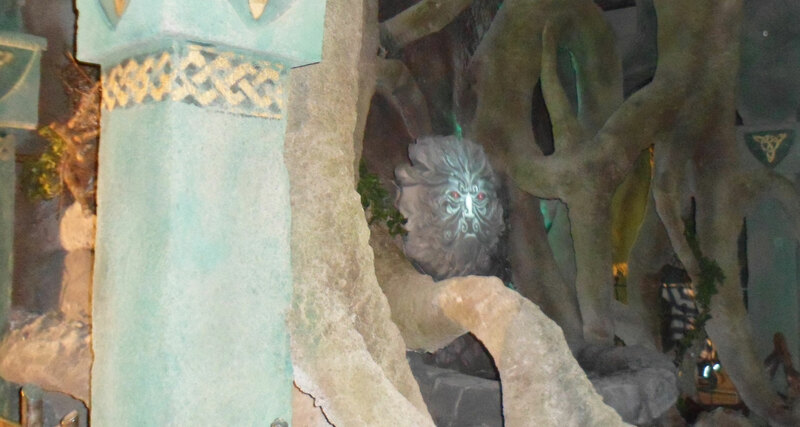 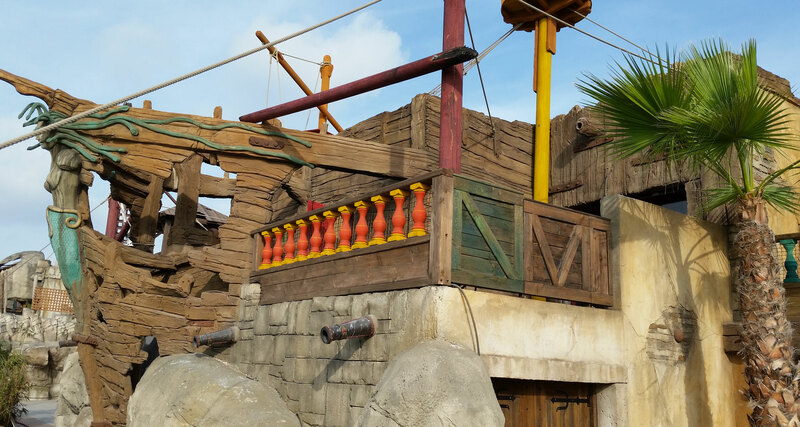 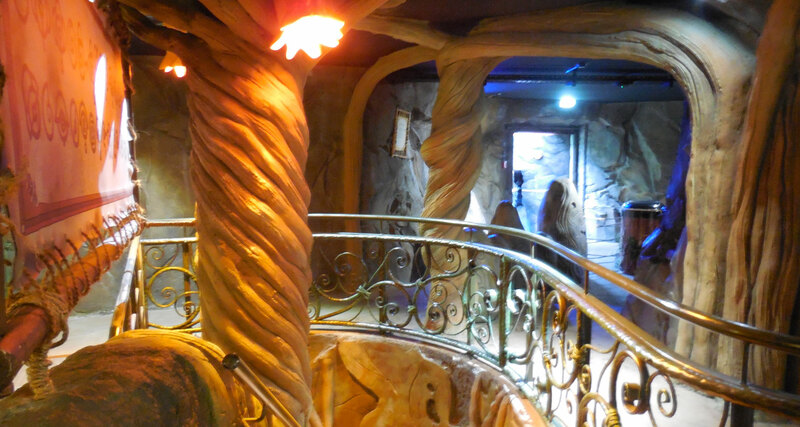 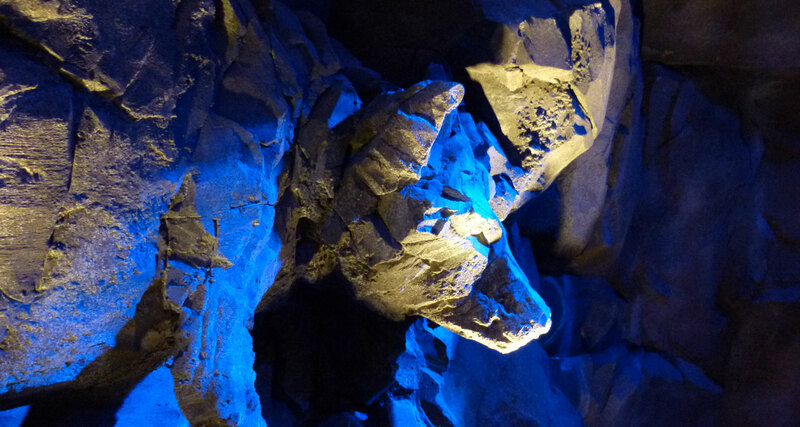 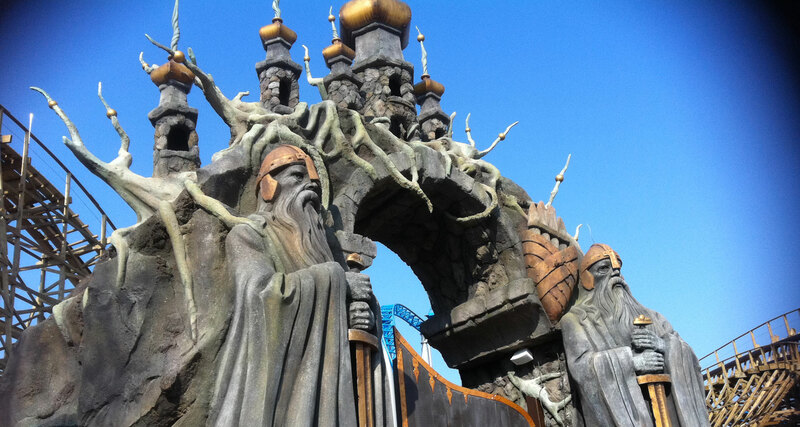 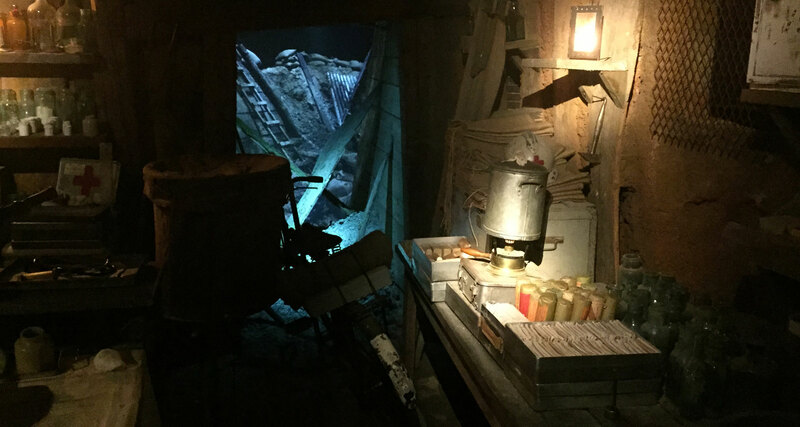 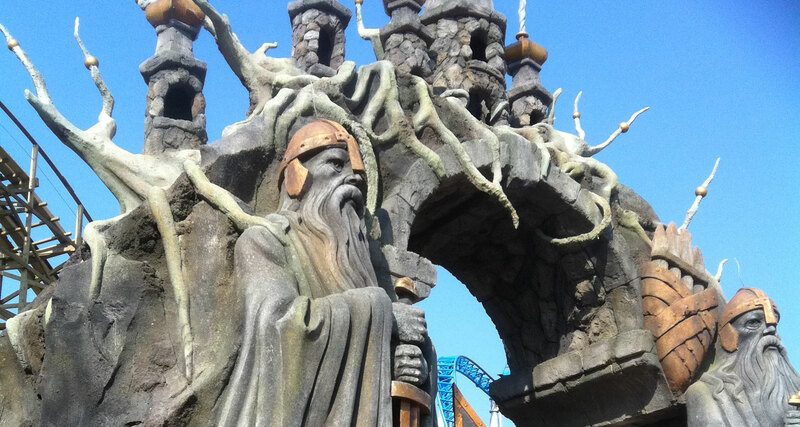 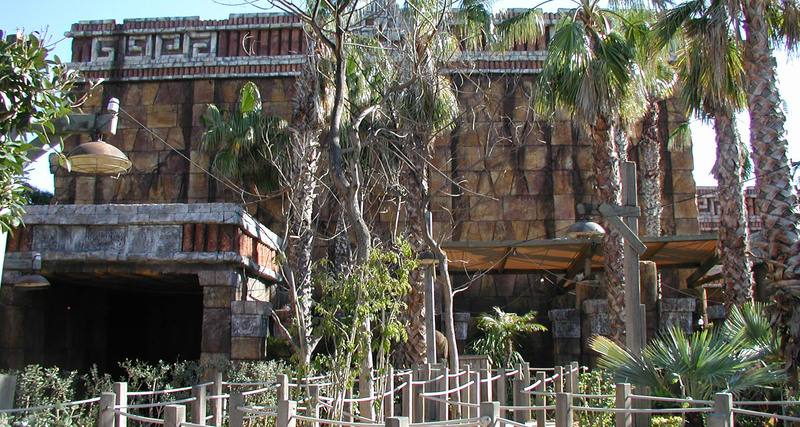 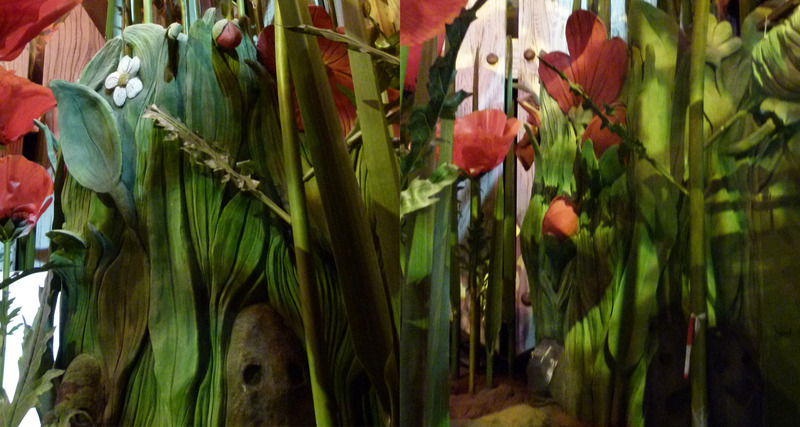 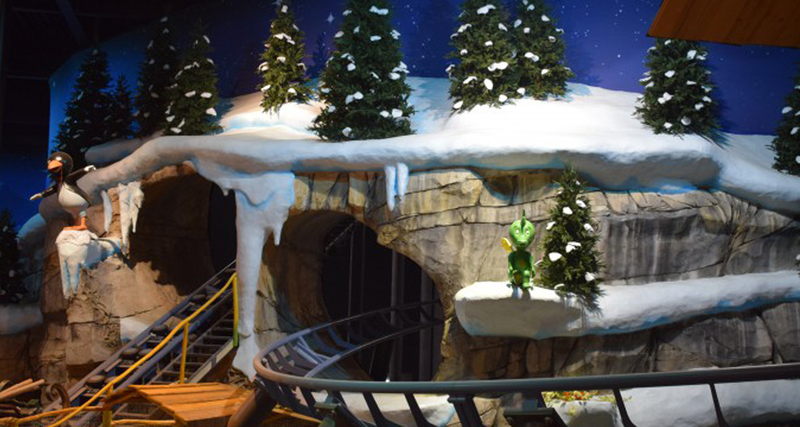 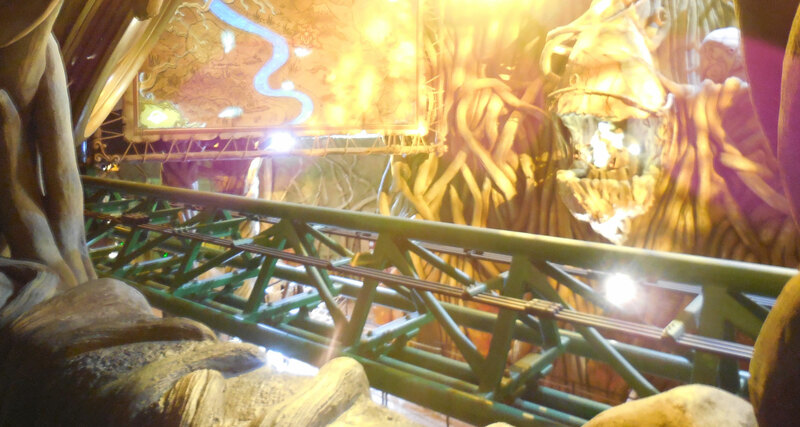 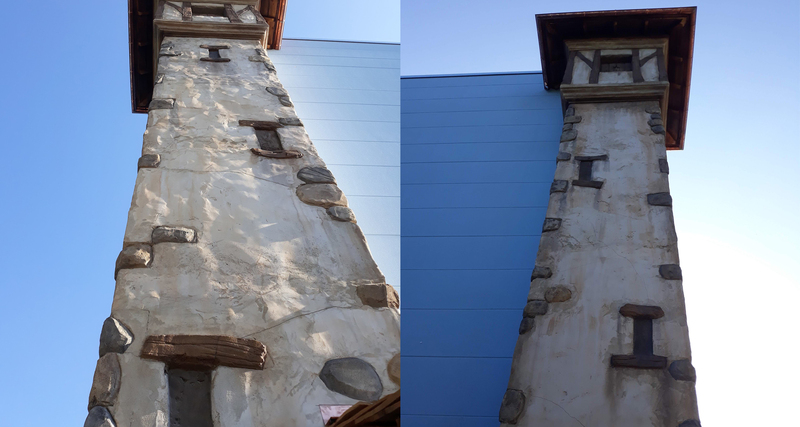 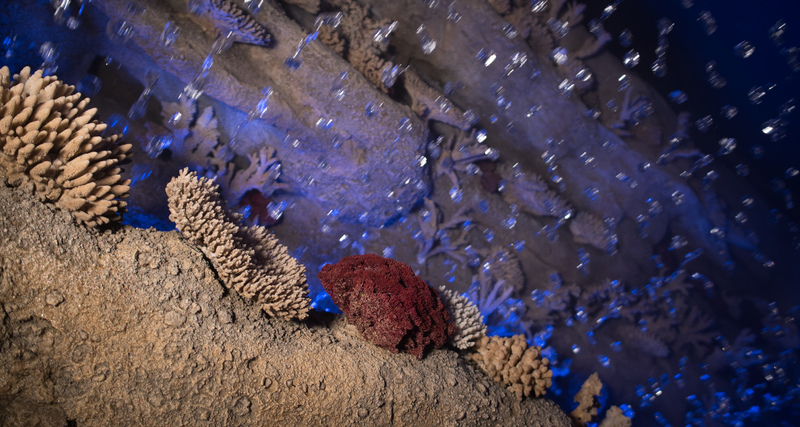 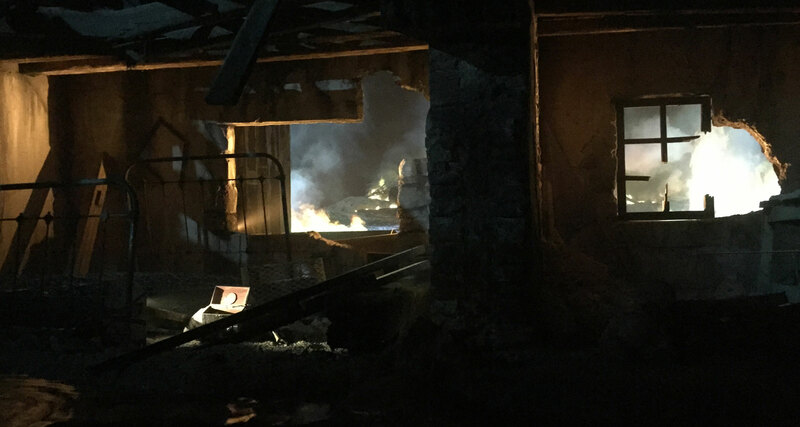 AAB realized the themed decors for the new roller coaster ; cave, rockworks and themed facades. 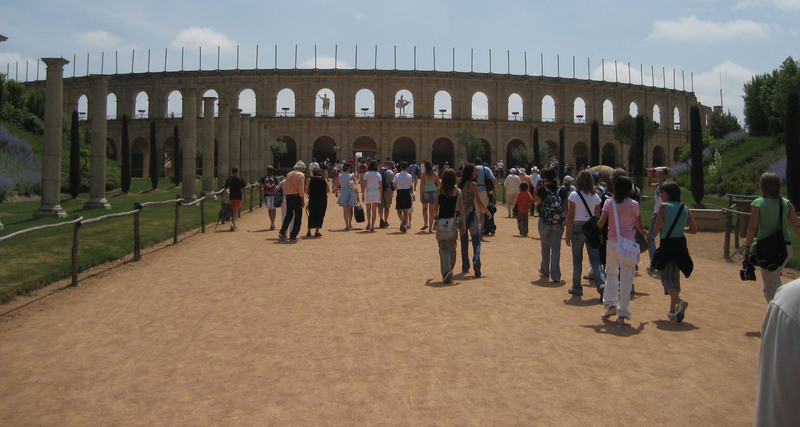 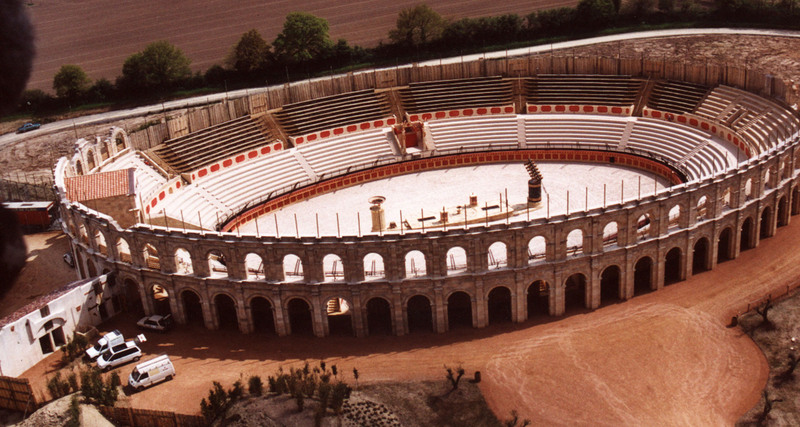 The AAB company built the Colosseum inspired by the arena of Nîmes. 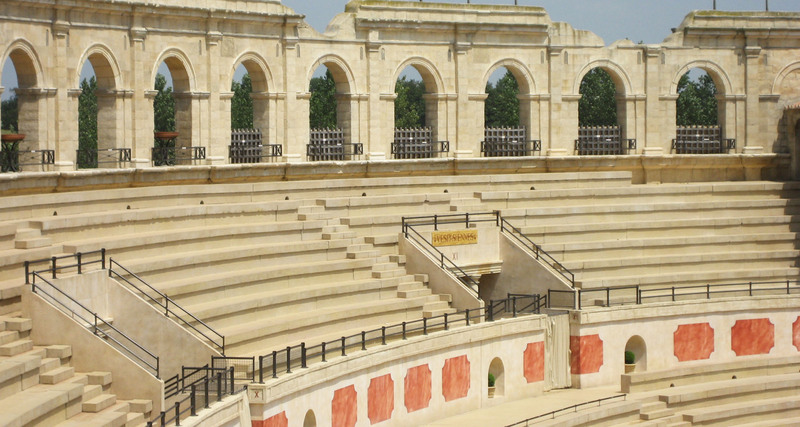 Gallo-Roman arena reconstruction on scale 1. 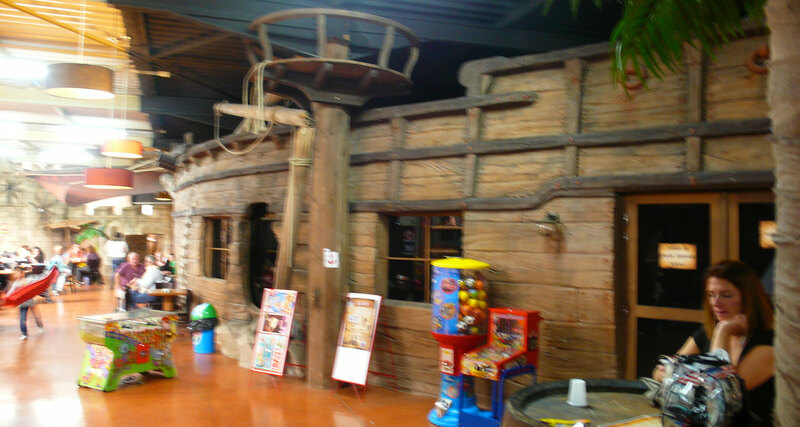 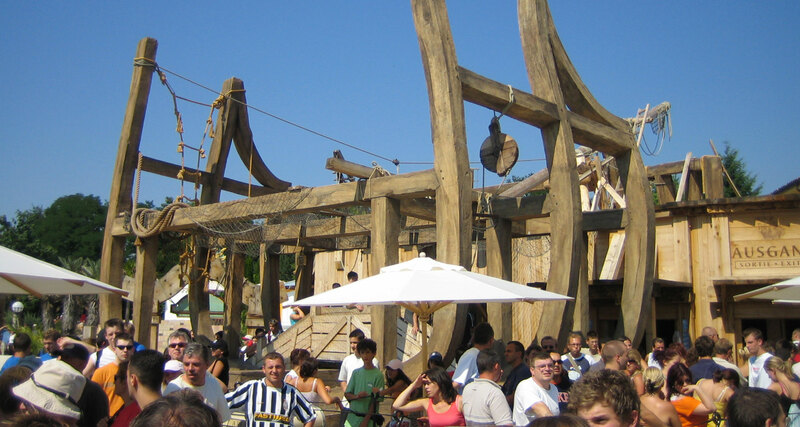 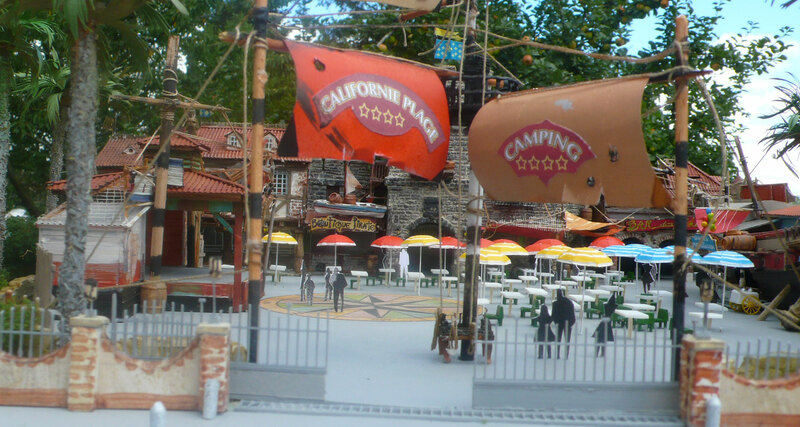 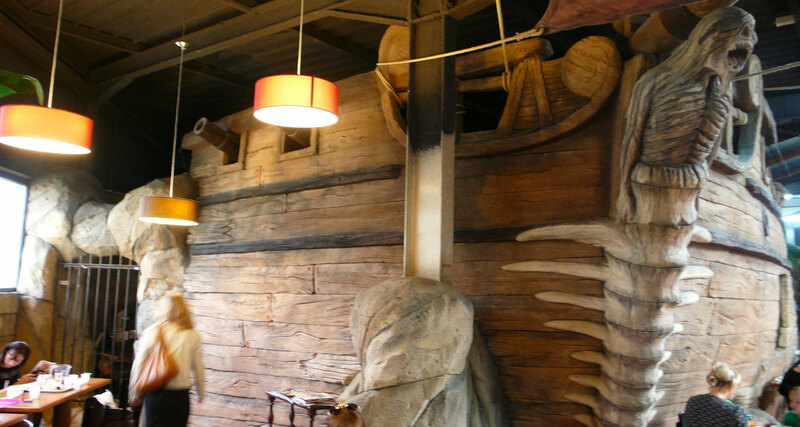 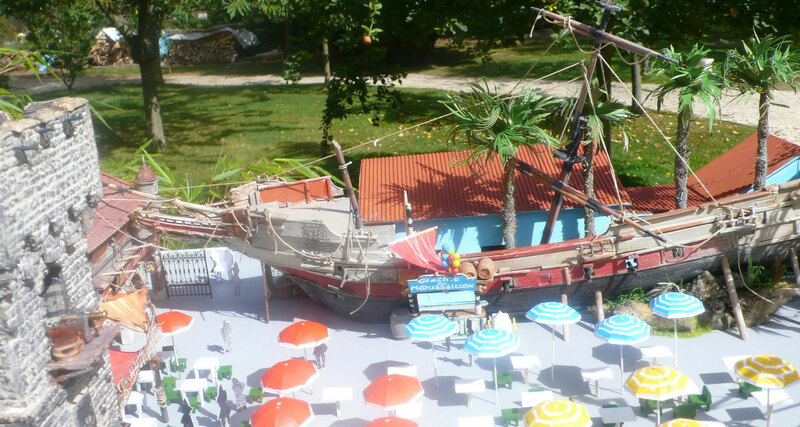 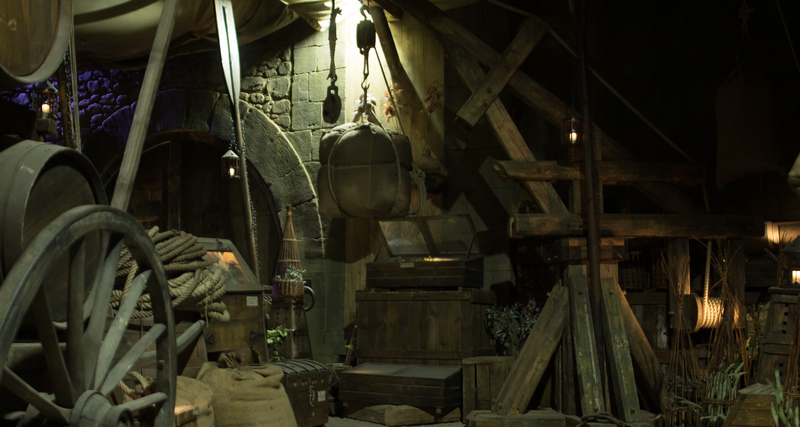 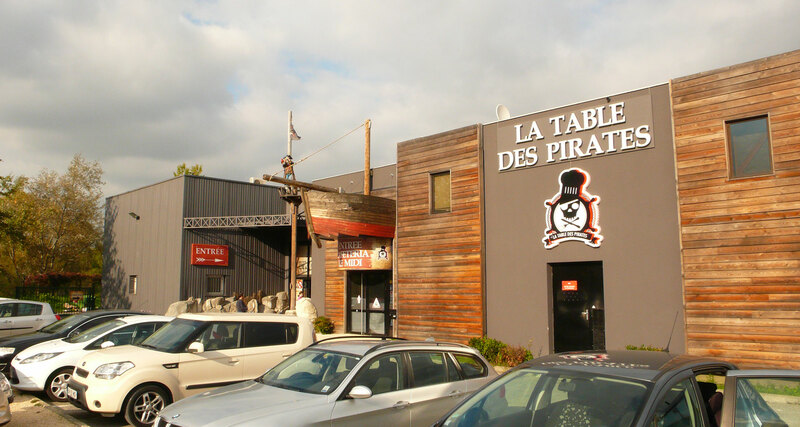 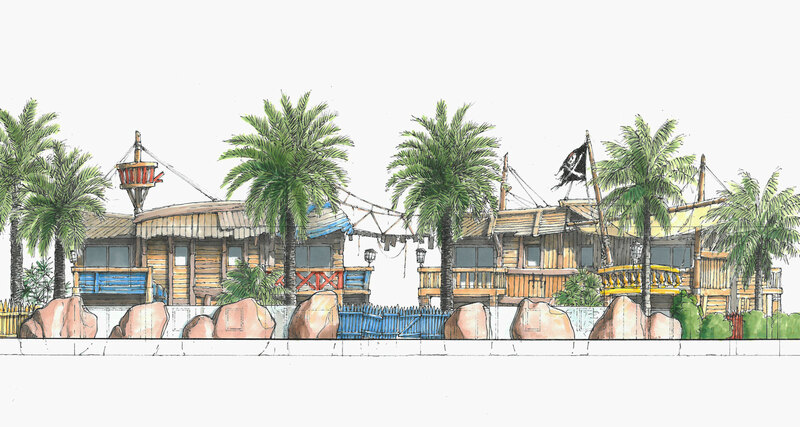 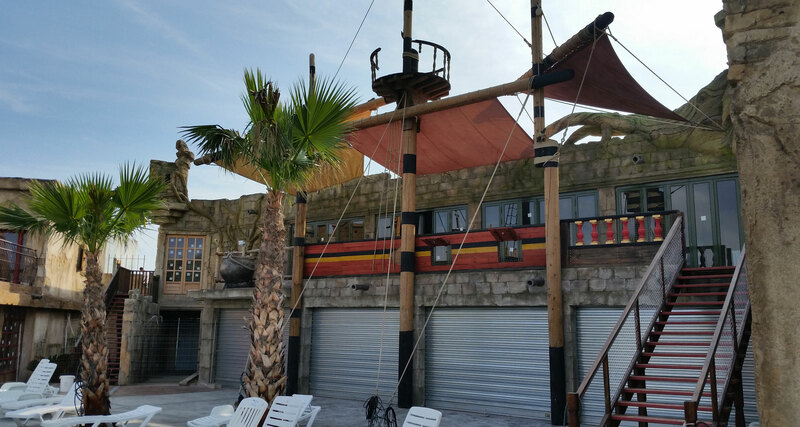 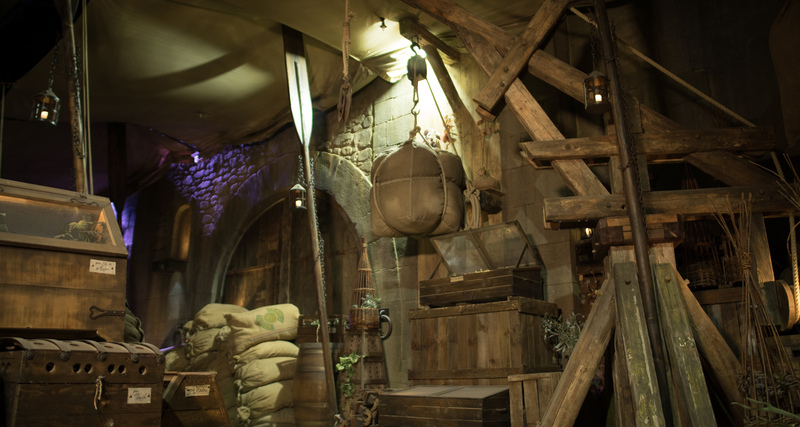 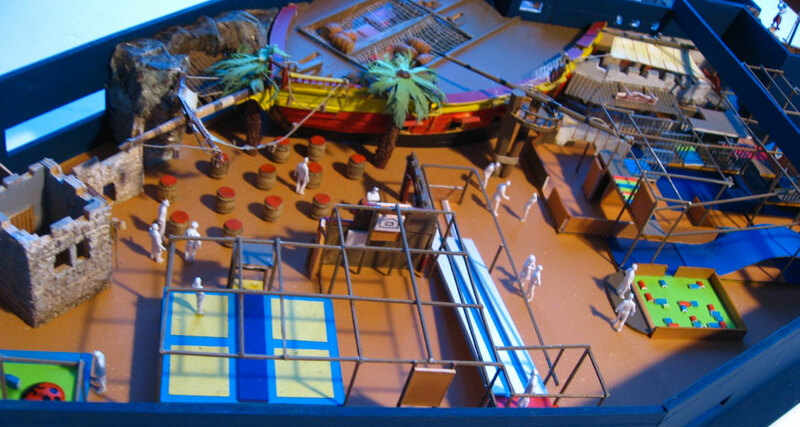 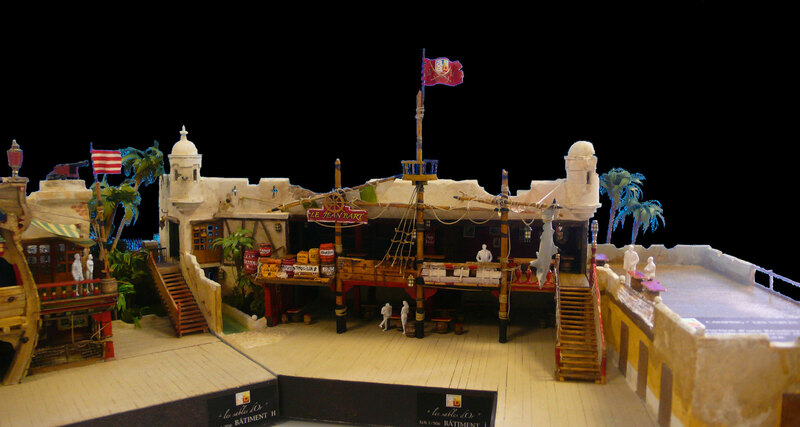 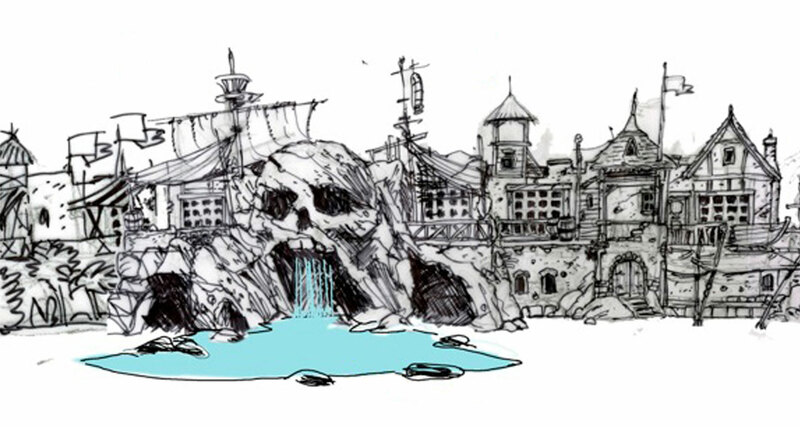 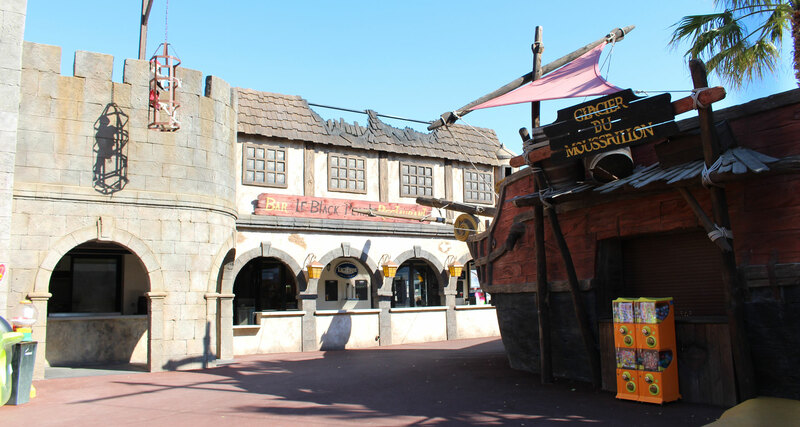 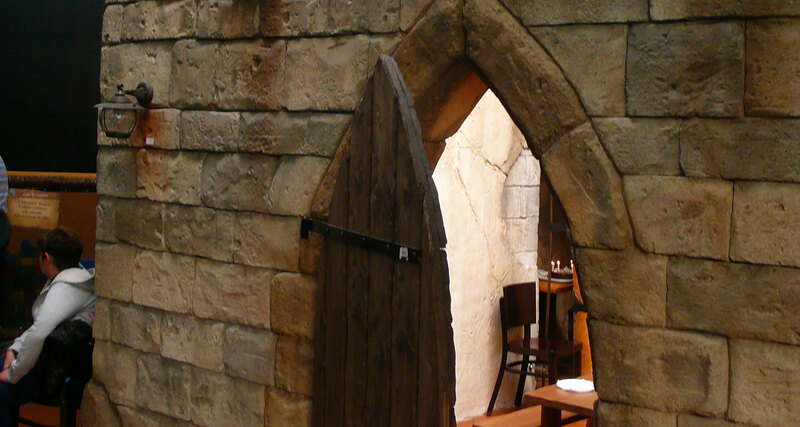 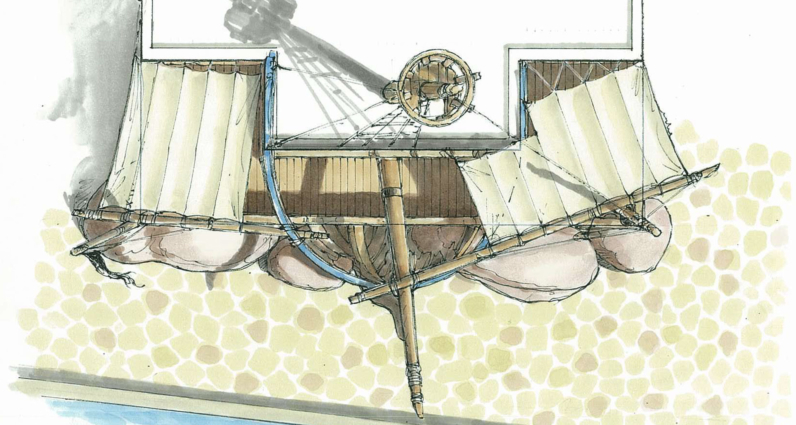 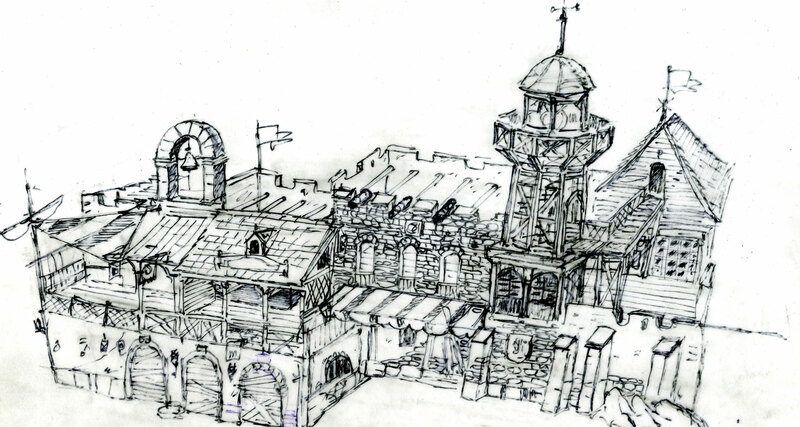 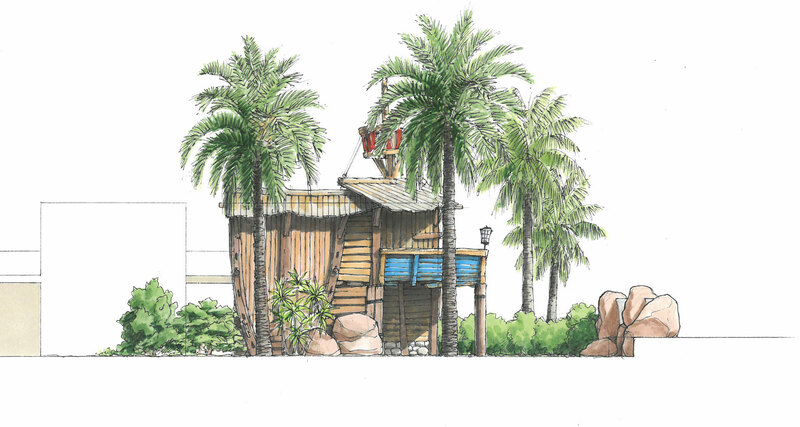 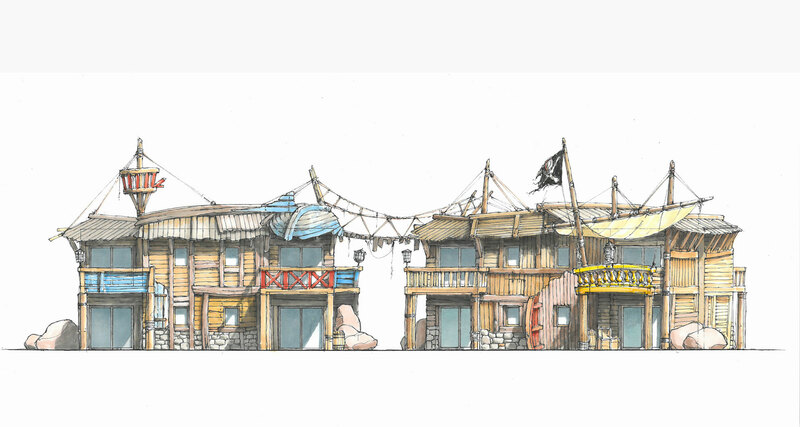 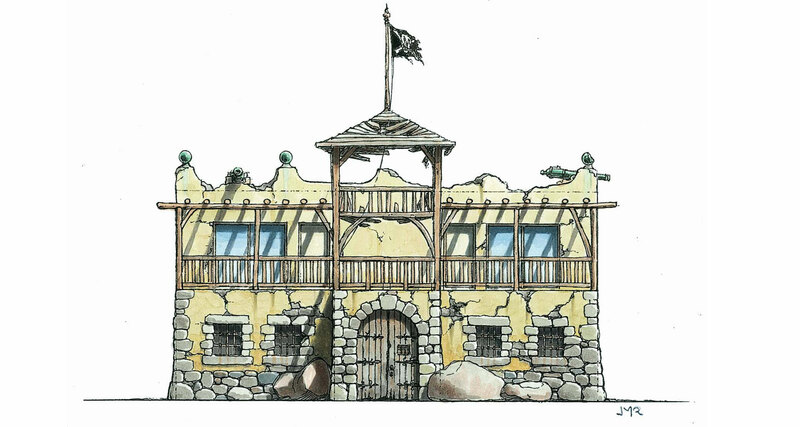 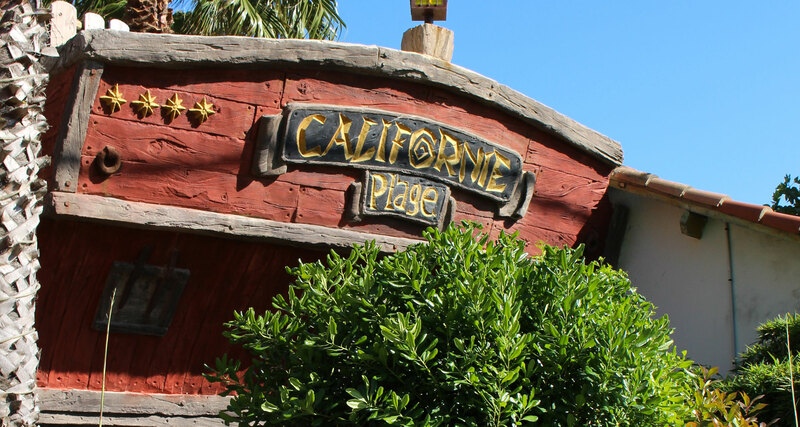 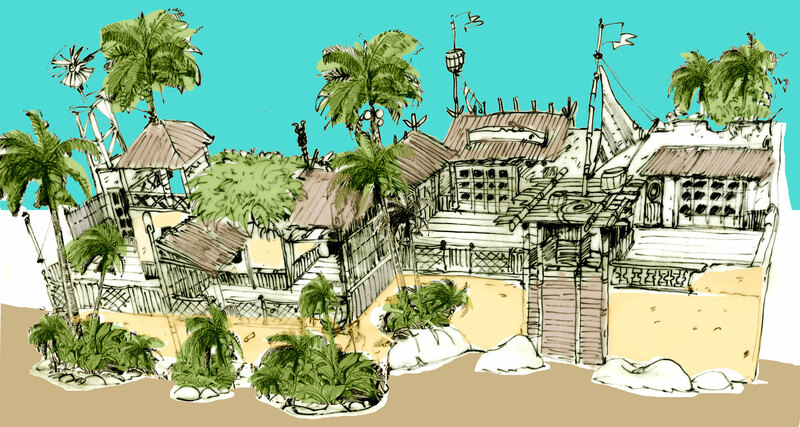 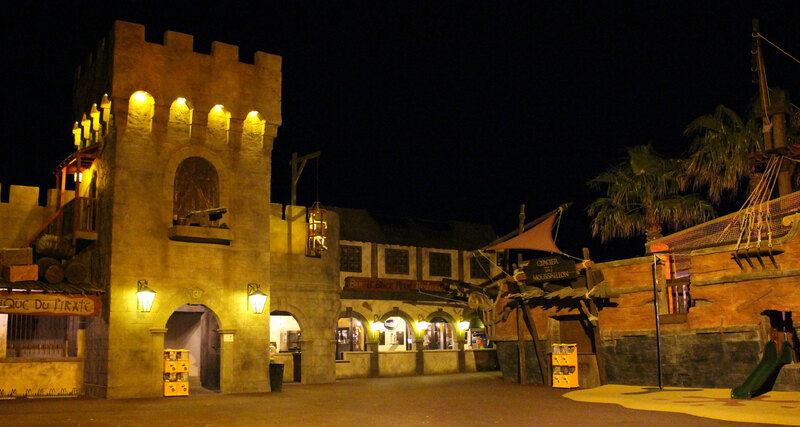 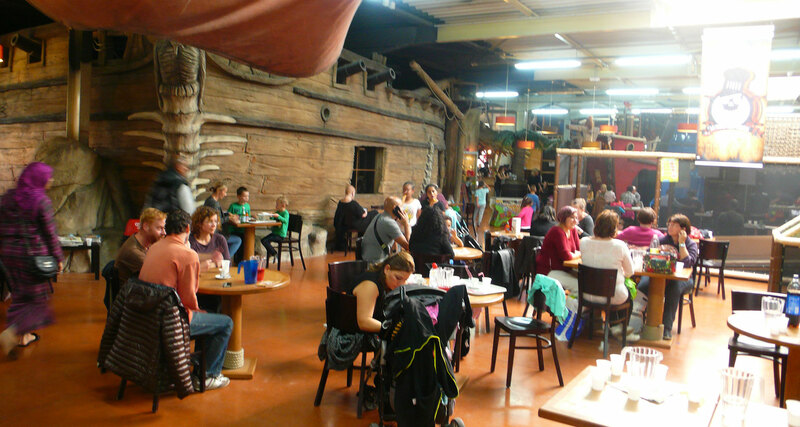 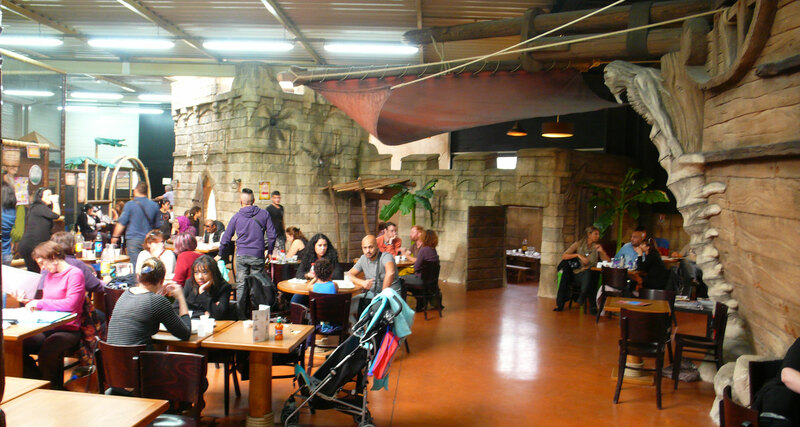 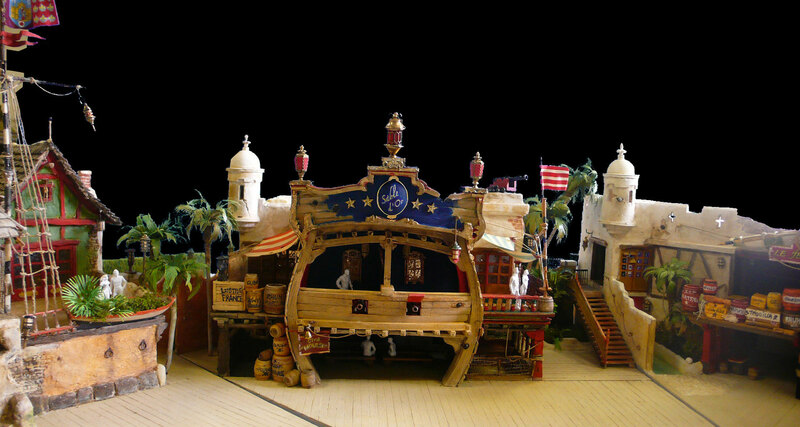 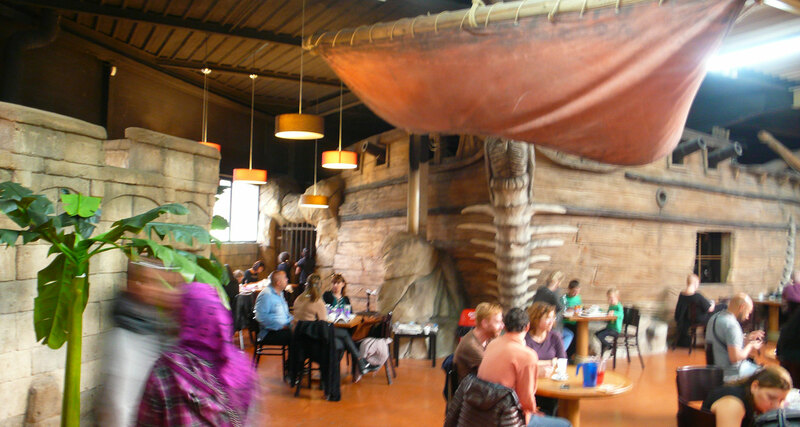 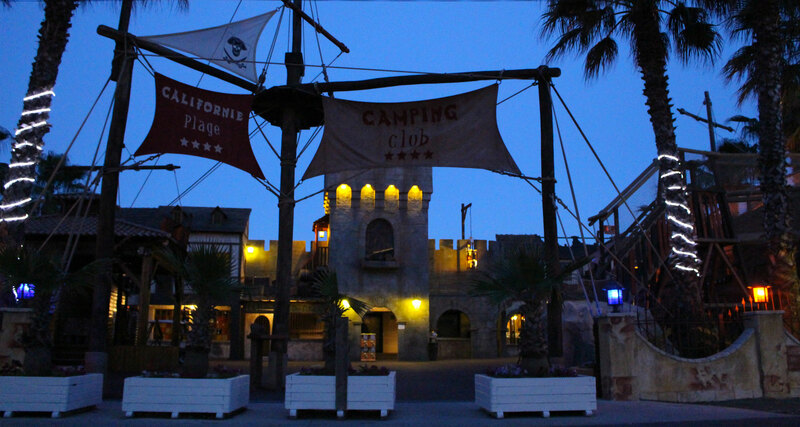 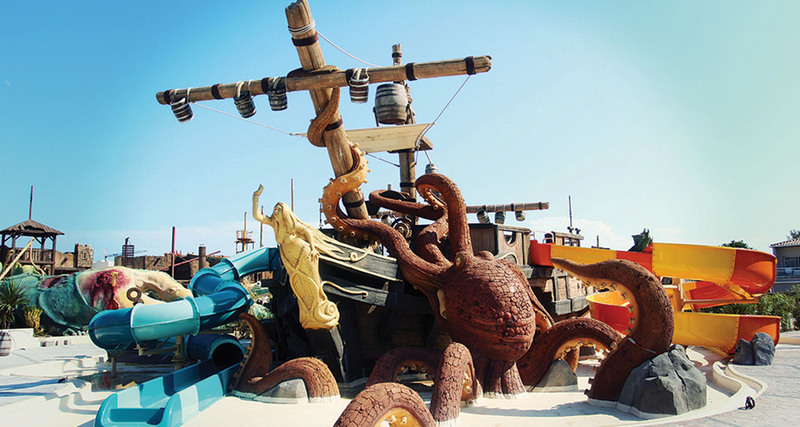 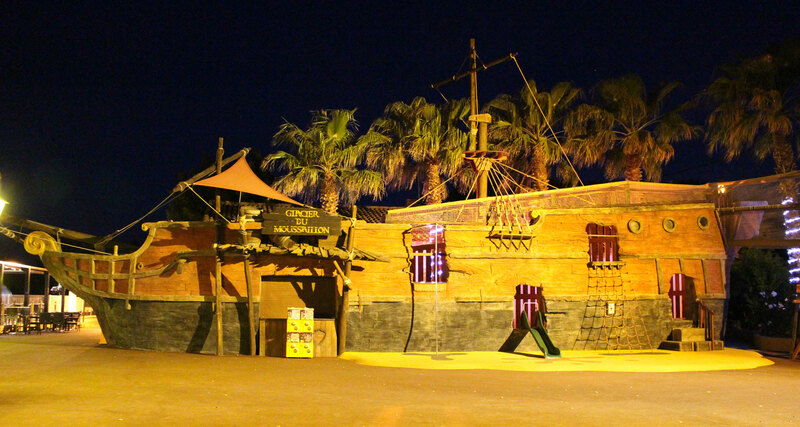 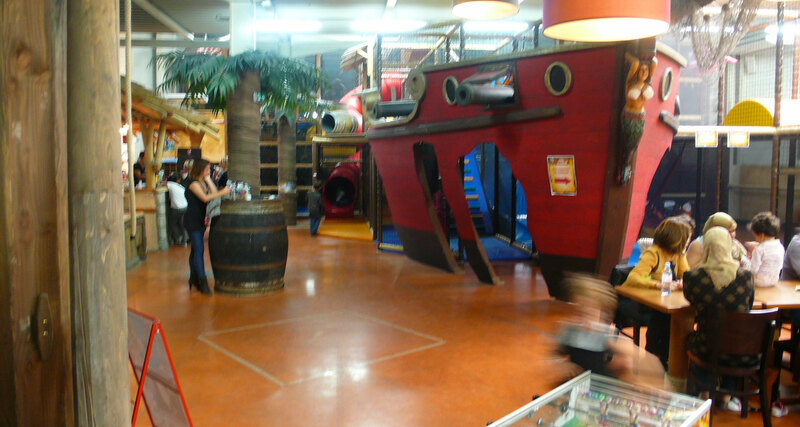 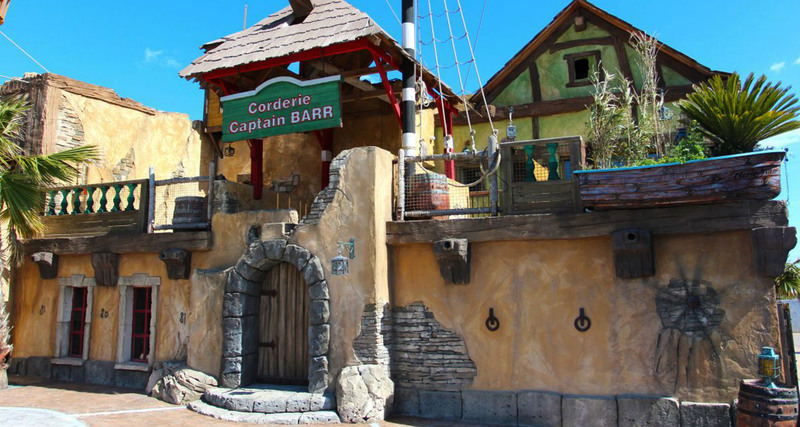 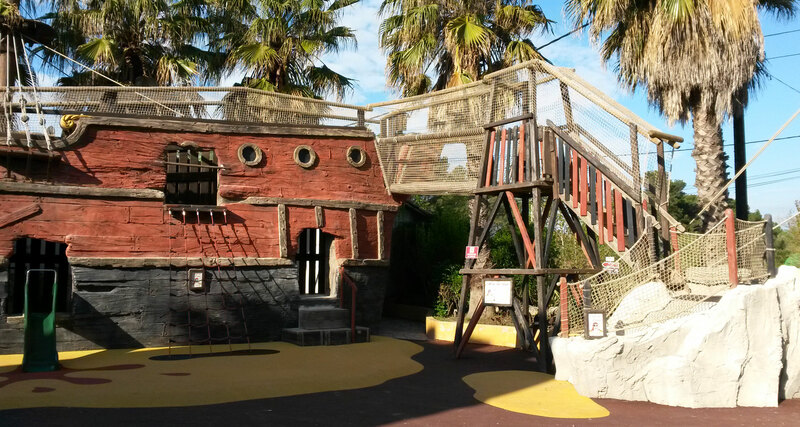 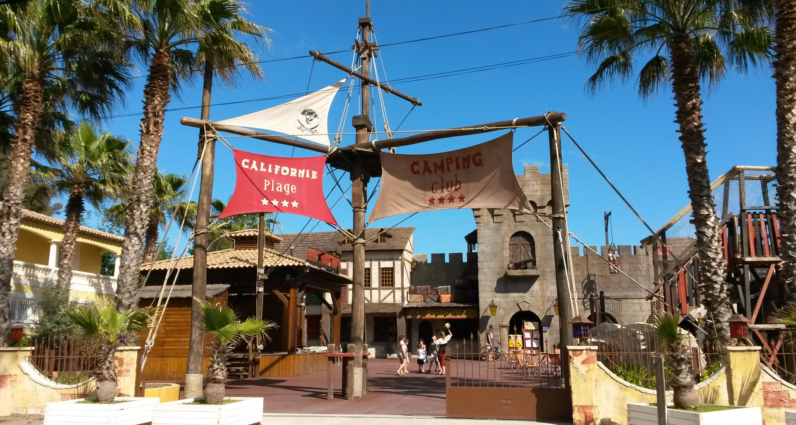 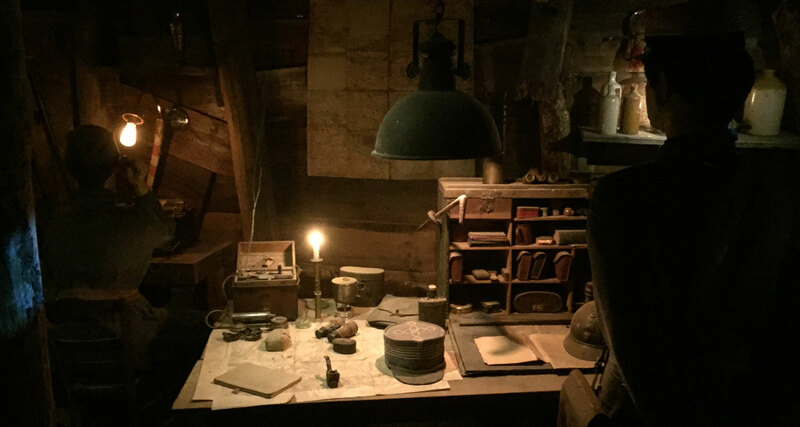 Design and construction of a restaurant on the theme of pirates. 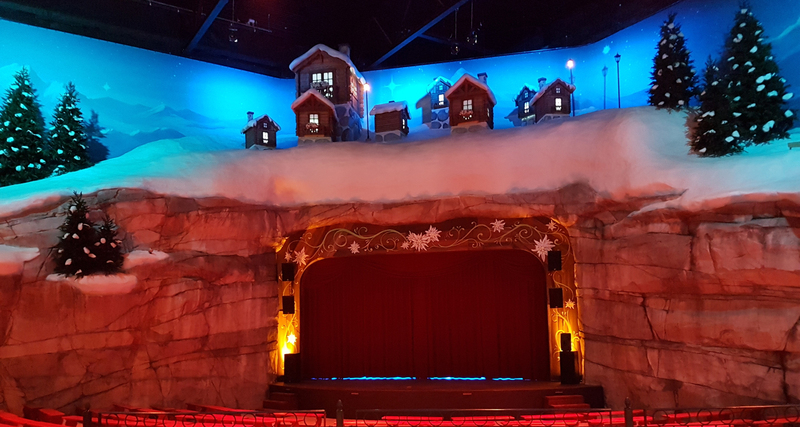 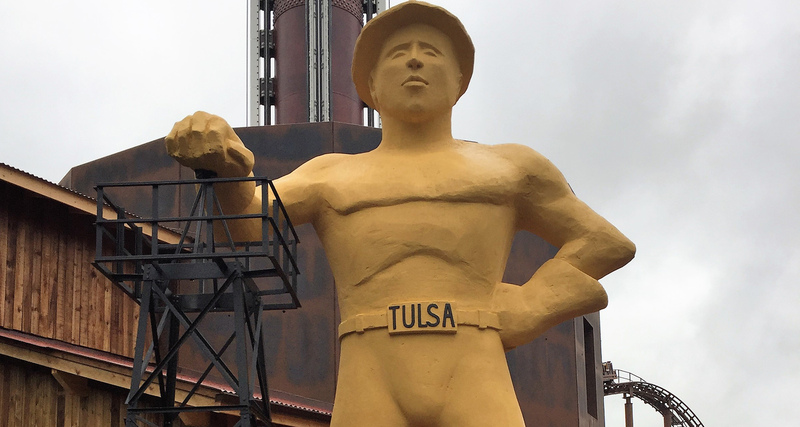 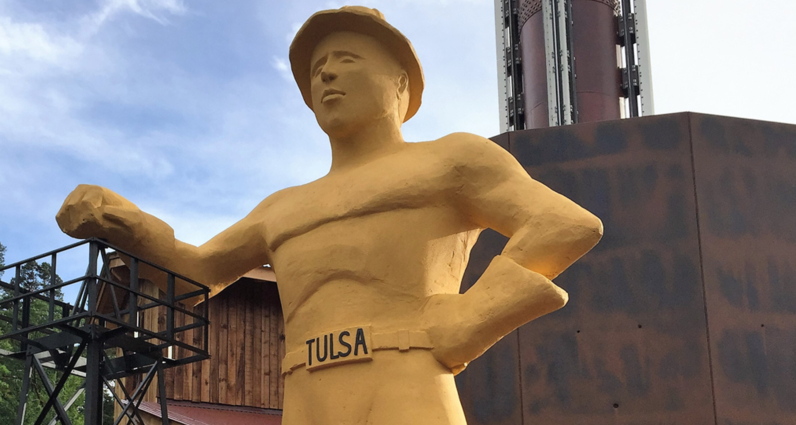 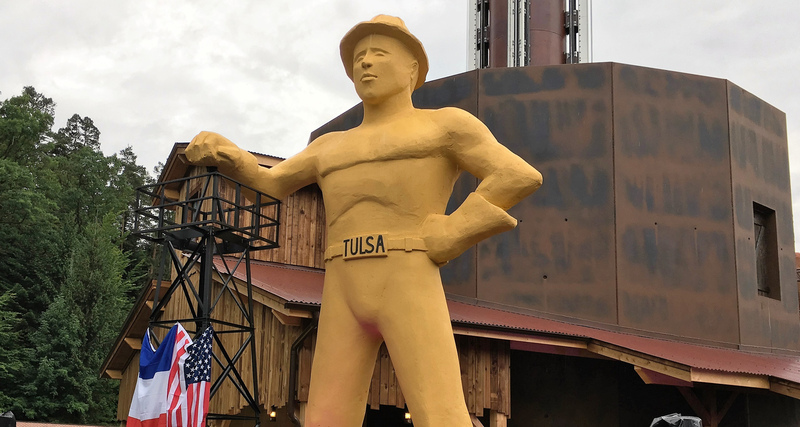 Amusement show: show punctuated by special effects. 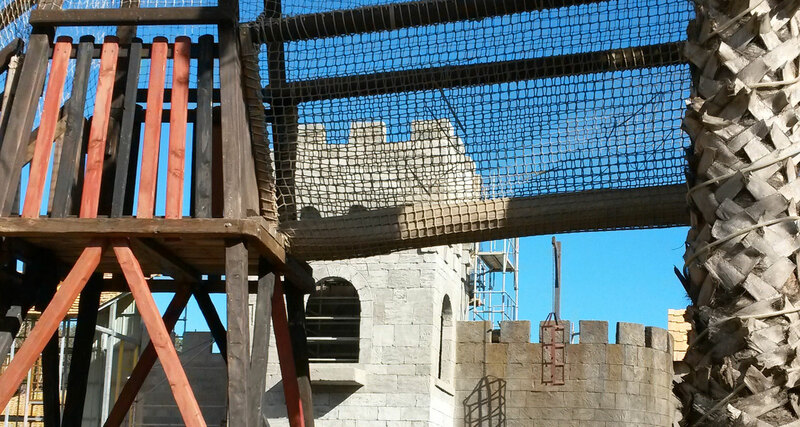 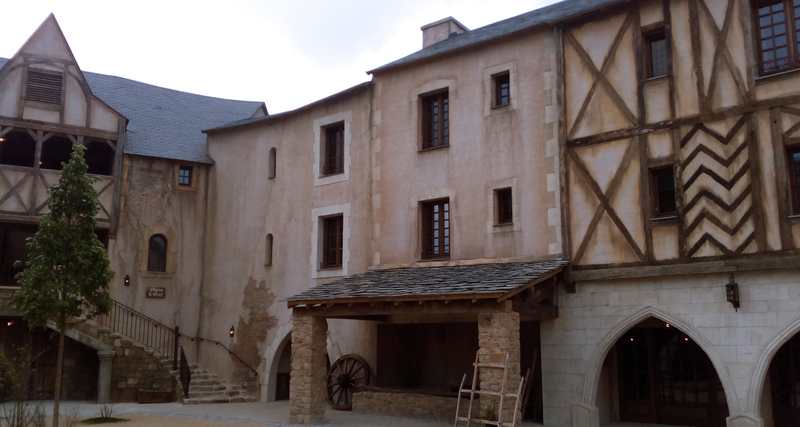 Construction of a semi-Mediaeval, semi-Renaissance castle in M1 PU resin + sprayed mortar. 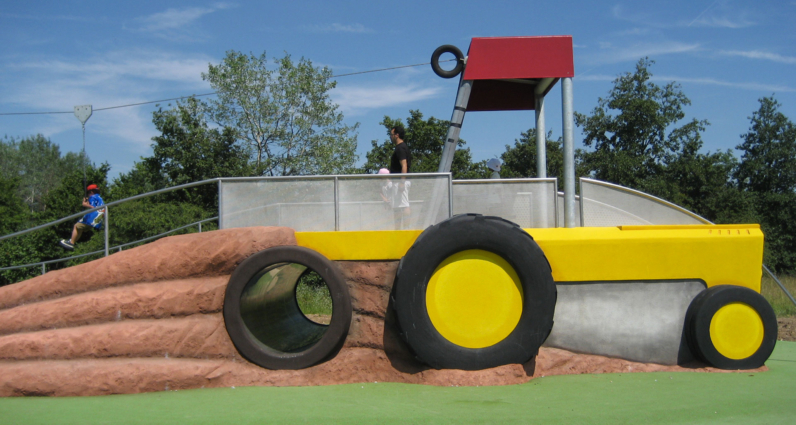 The unit is movable and weighs more than 70 tonnes; 1000m². 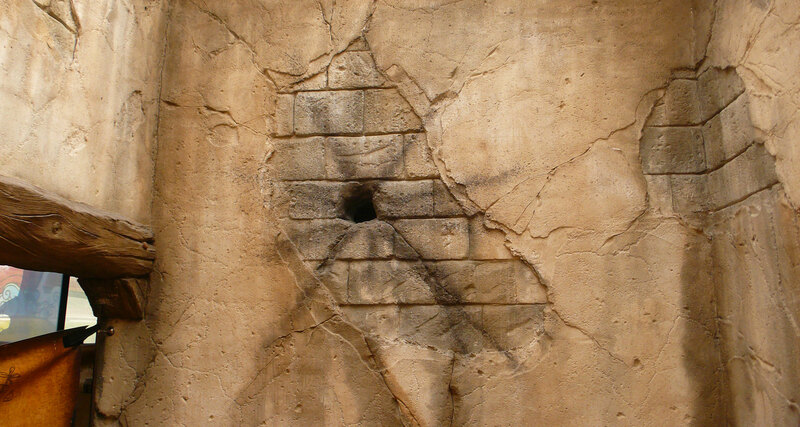 Coating of a rampart which completely disappears. 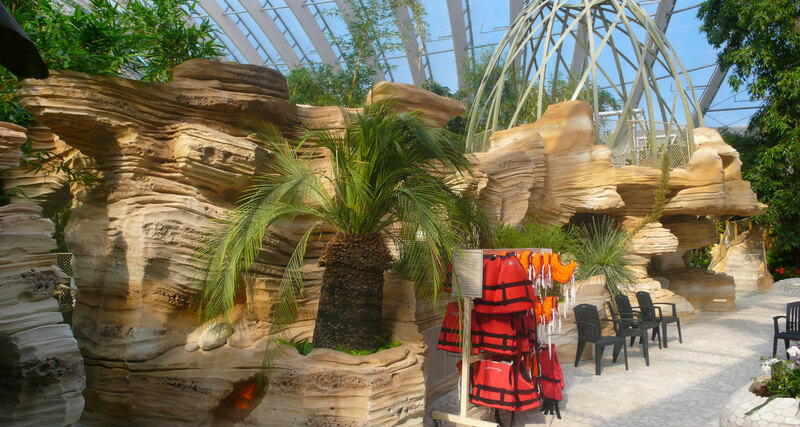 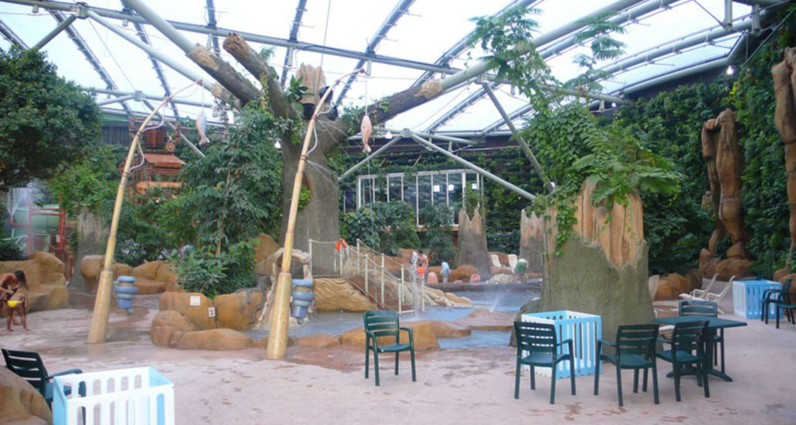 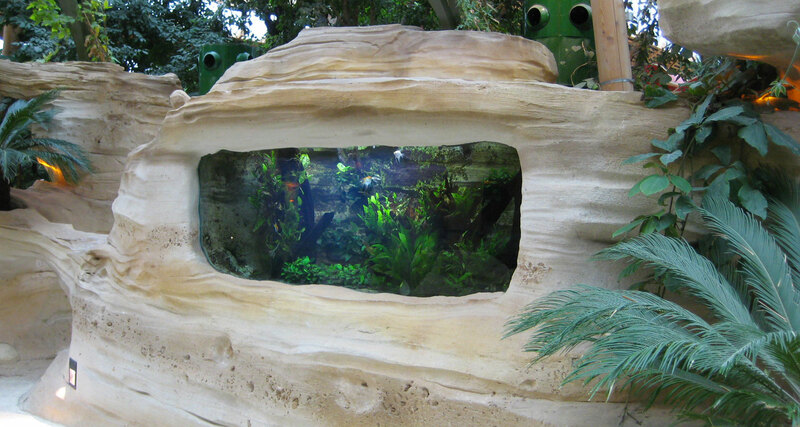 AAB produced the themed decors in the Aquamundo and the greenhouse: cladding of rapid river outlet basin, climbing wall, artificial rocks. 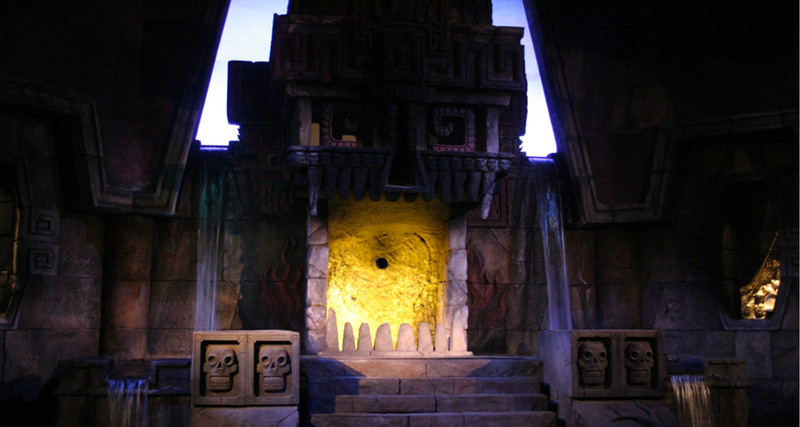 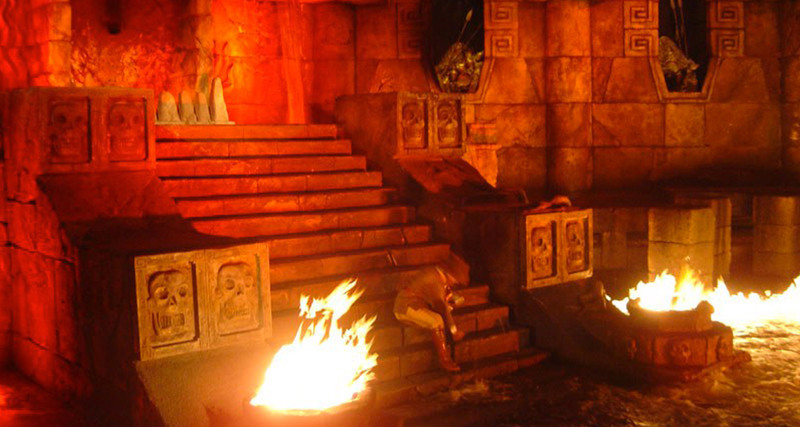 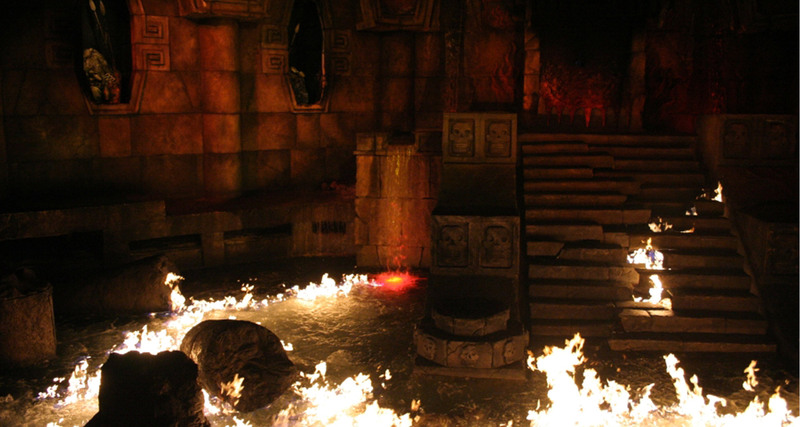 Phase 3 – Mexico area: “Templo del Fuego” Amusement show, a visit inside an old temple with special effects and pyrotechnics – Reconstitution, inside and outside, of more than 3,000m² of Aztec architecture. 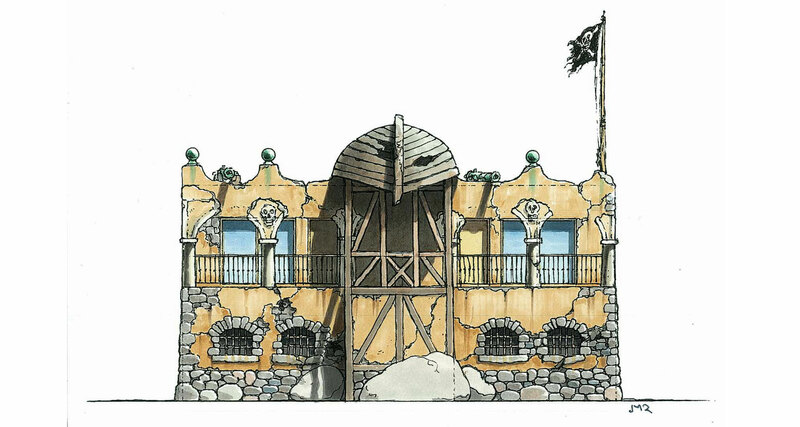 Phase 2: “Sea Odyssey”: Amusement show – Reproduction of more than 1,700m² of artificial rocks for an underwater adventure based on simulators. 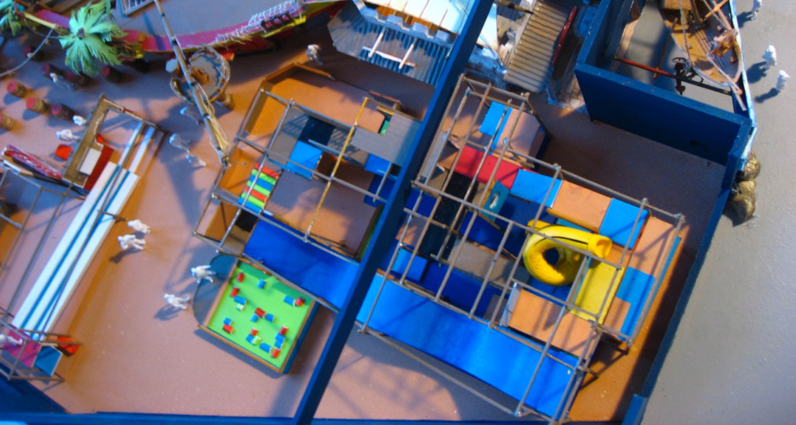 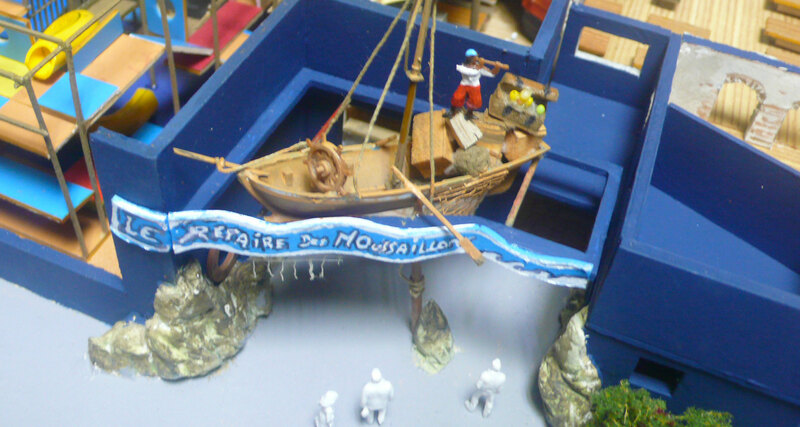 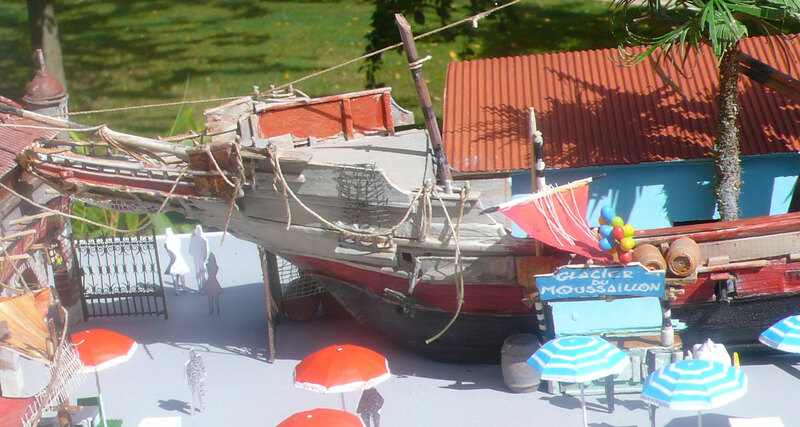 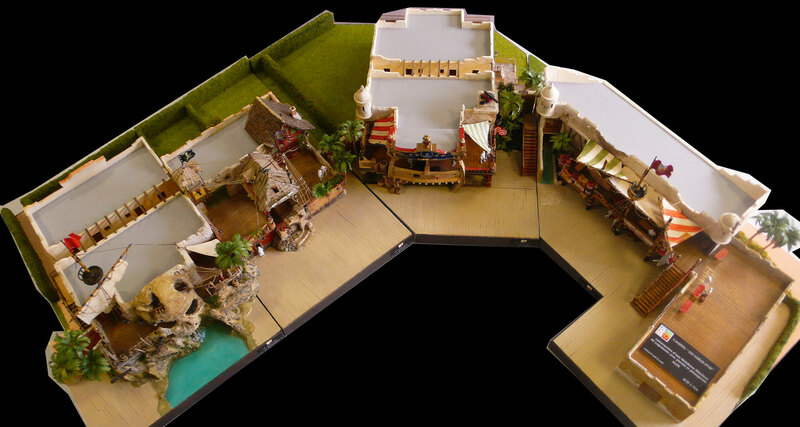 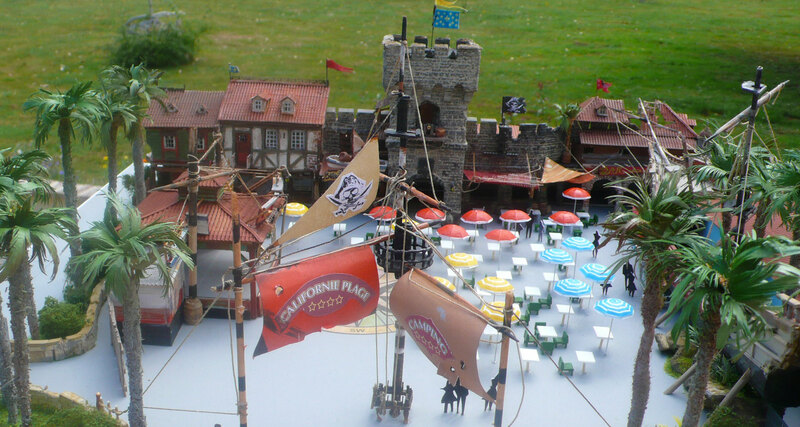 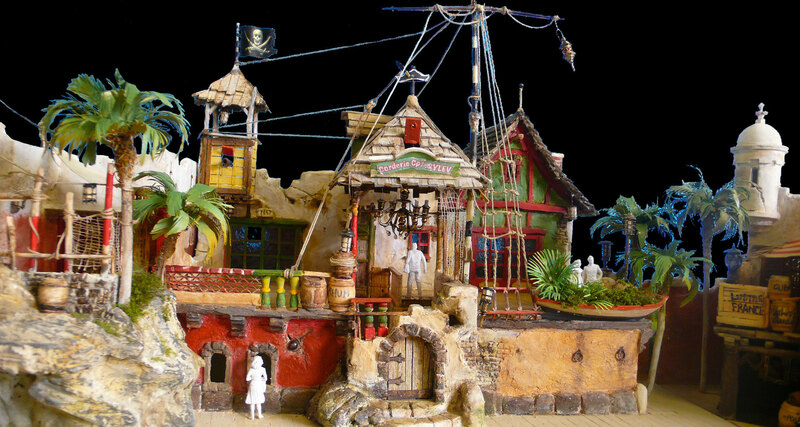 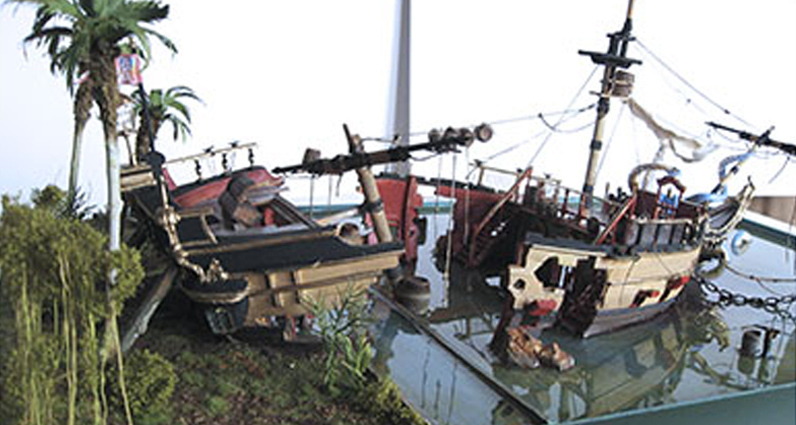 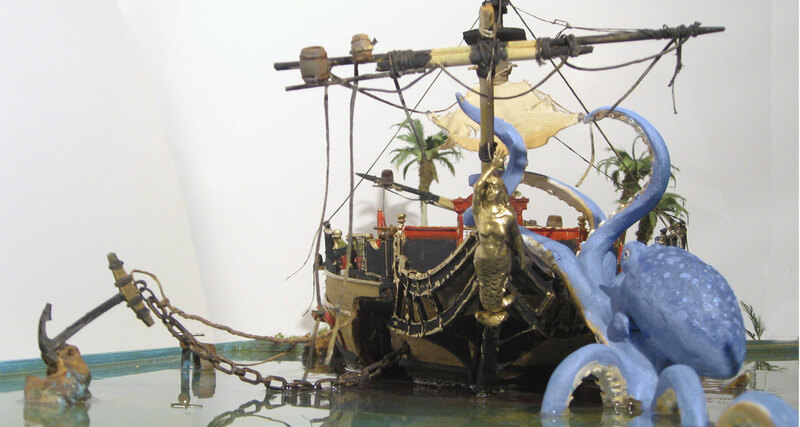 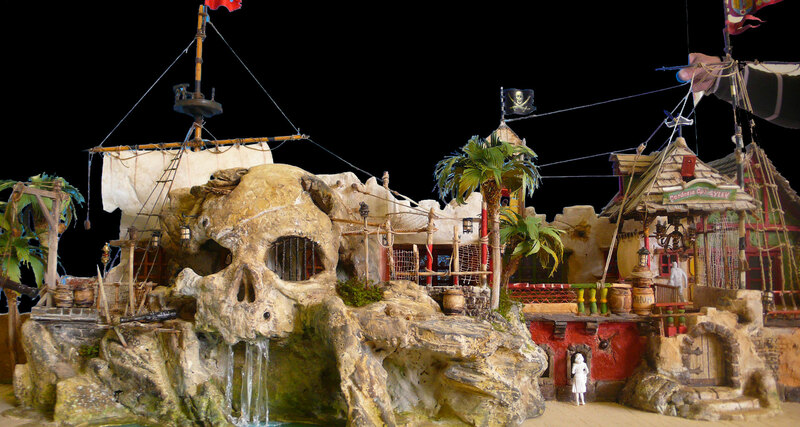 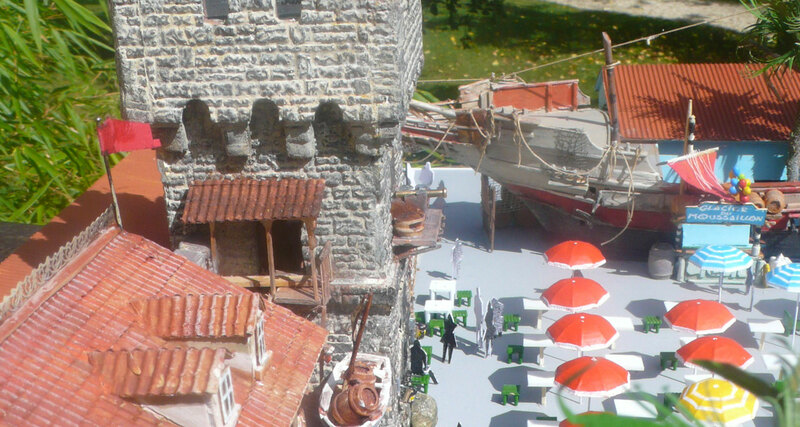 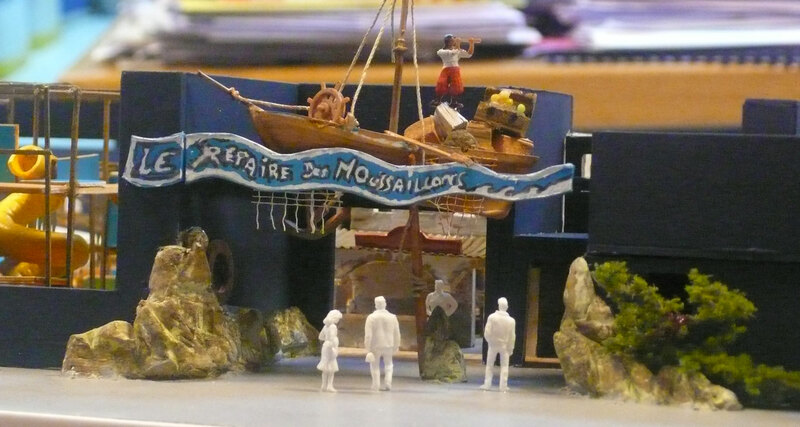 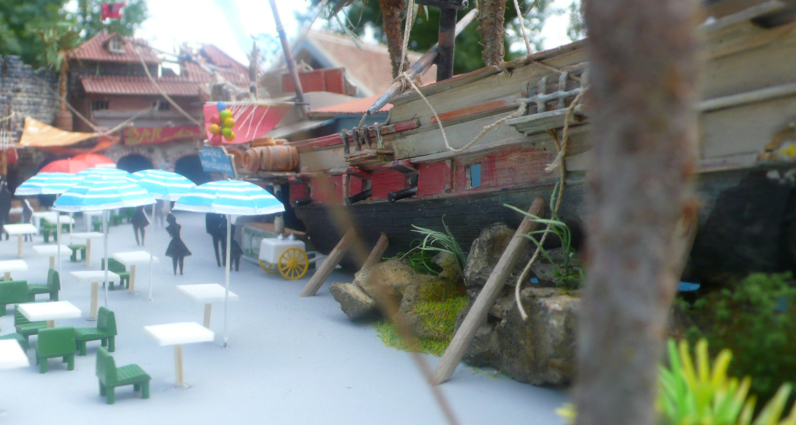 The models Design and construction of a restaurant on the theme of pirates. 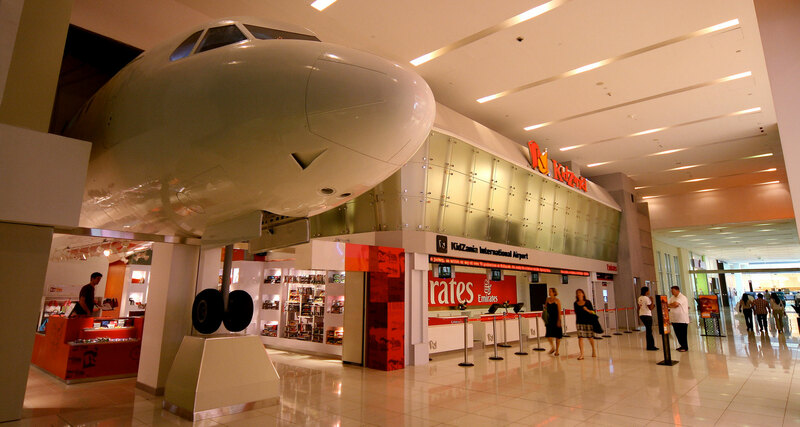 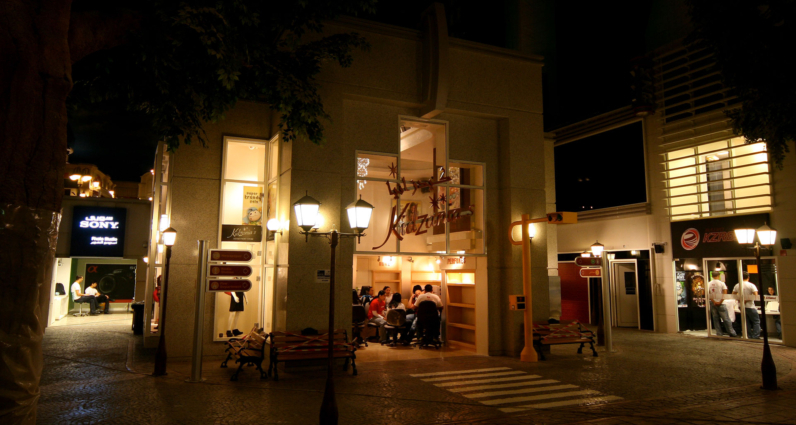 KidZania is a Mexican private company. 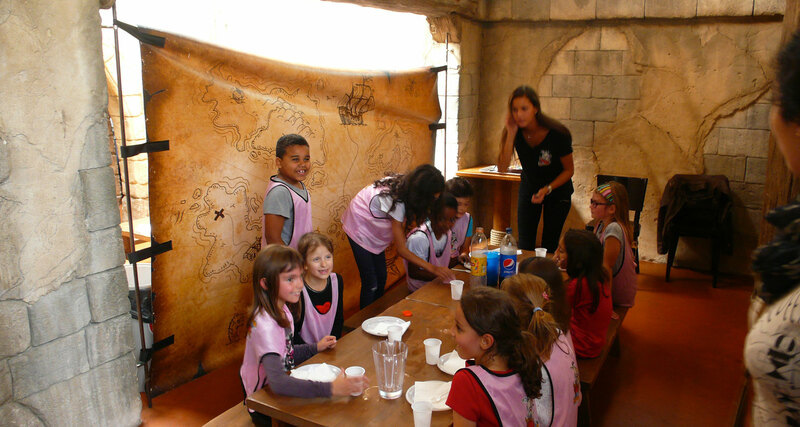 KidZania is a Mexican chain of family entertainment centres currently operating at 16 locations, allowing children to work in jobs like adults. 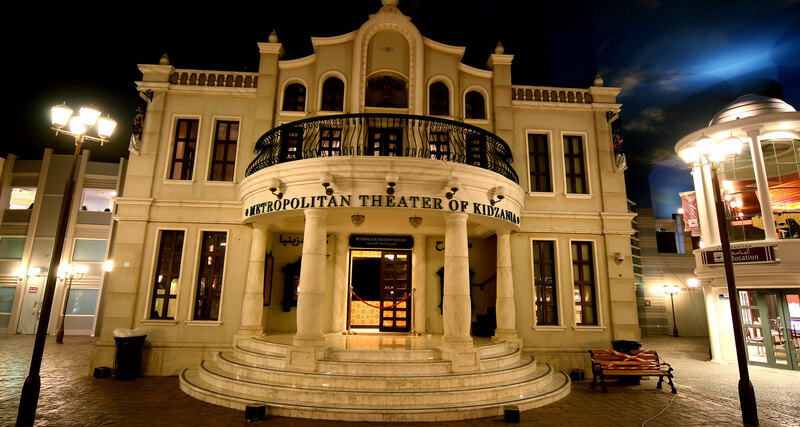 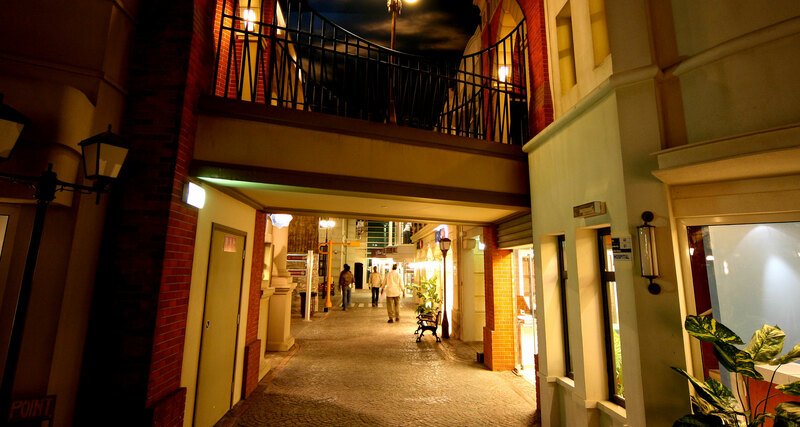 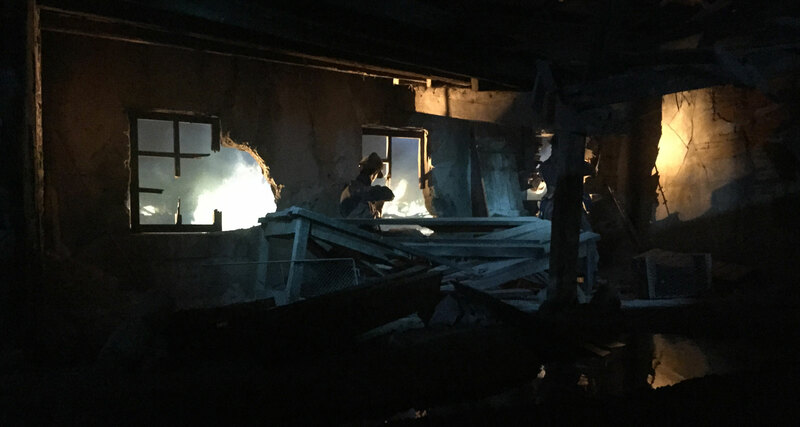 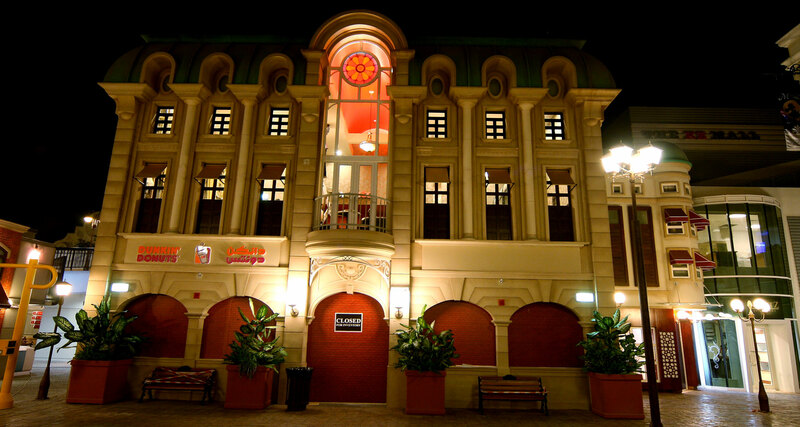 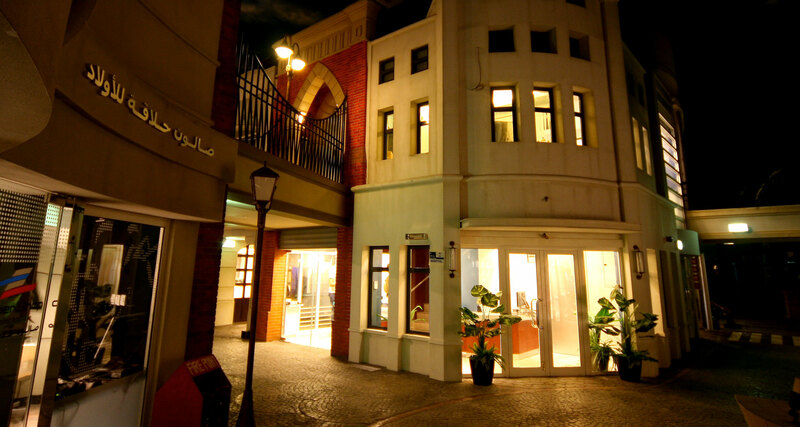 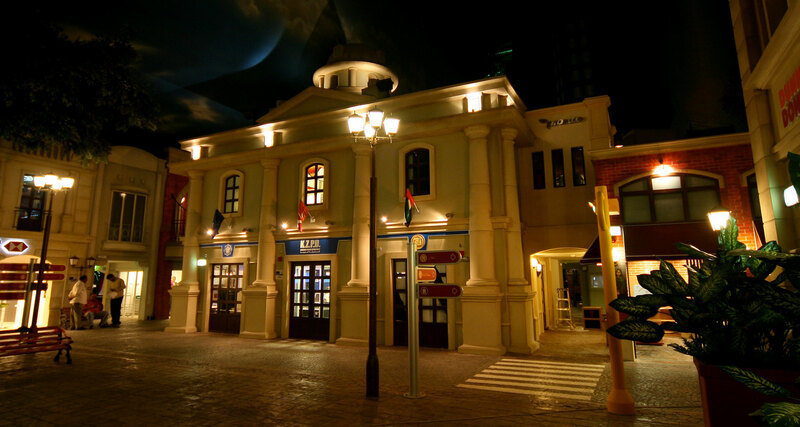 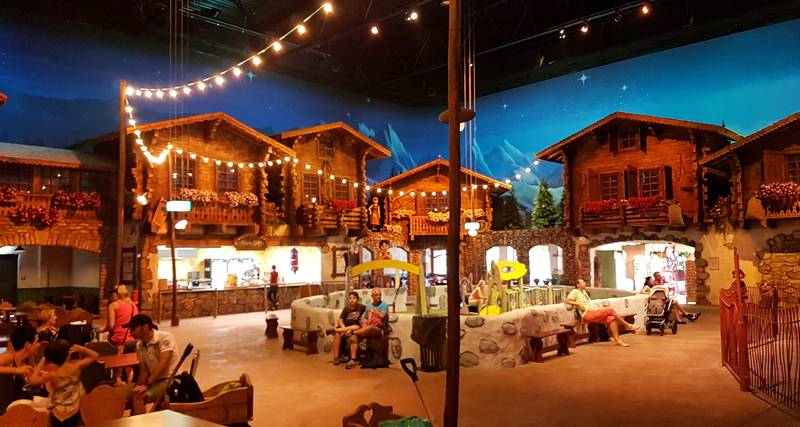 Each KidZania is a replica of a real city on a child’s scale, containing buildings, stores and theatres, as well as vehicles and pedestrians which move along its streets. 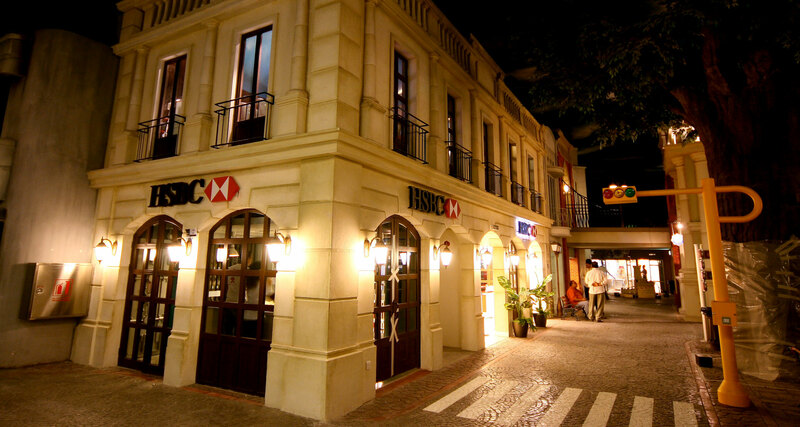 In this city, children aged 4 to 12 work in various businesses for brands such as Coca-Cola, McDonalds, etc. 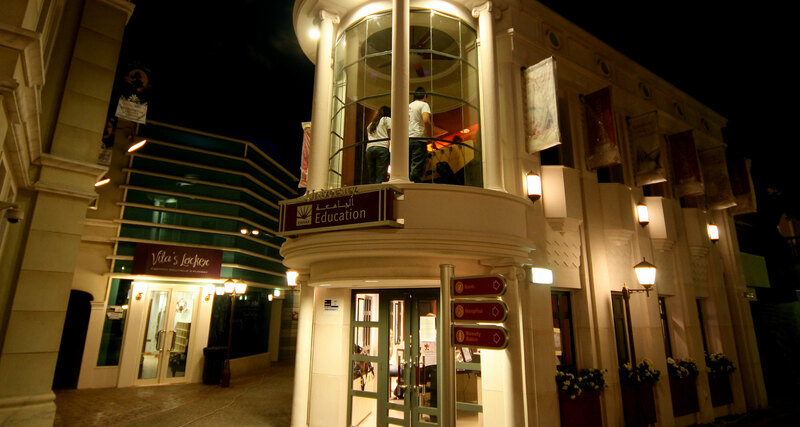 The children earn kidZos (KidZania currency) by performing the work, and the money is kept in the KidZania bank for the children. 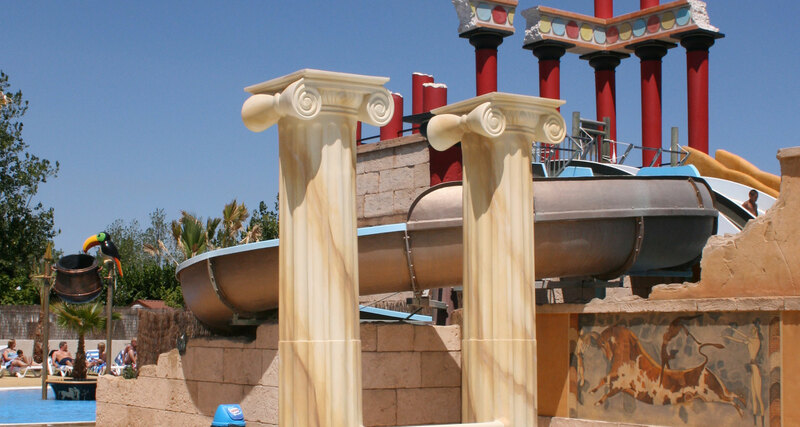 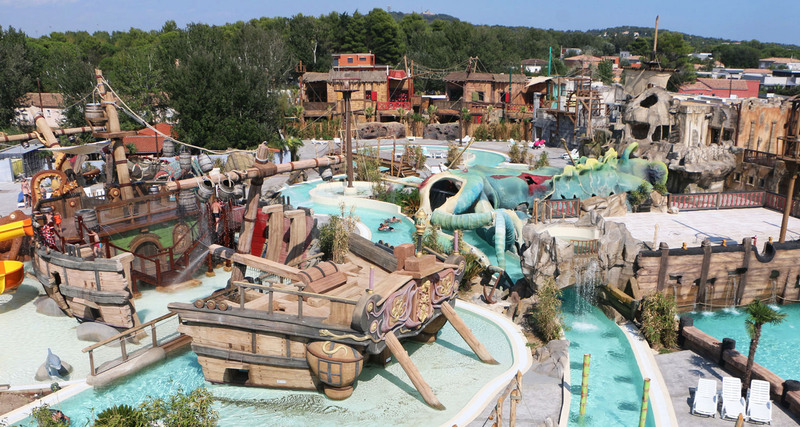 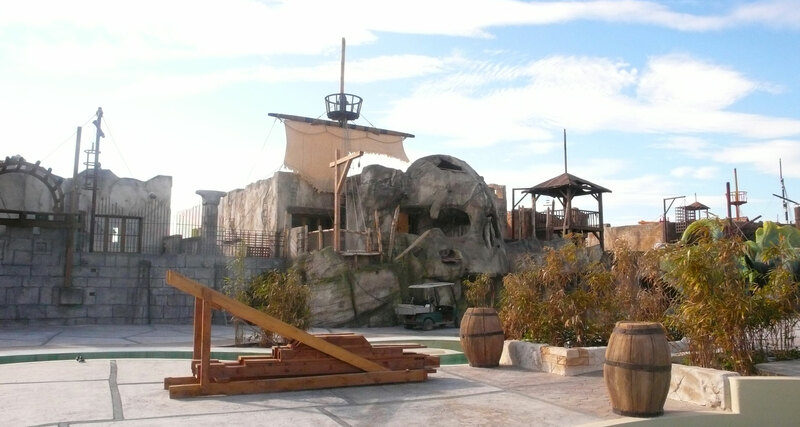 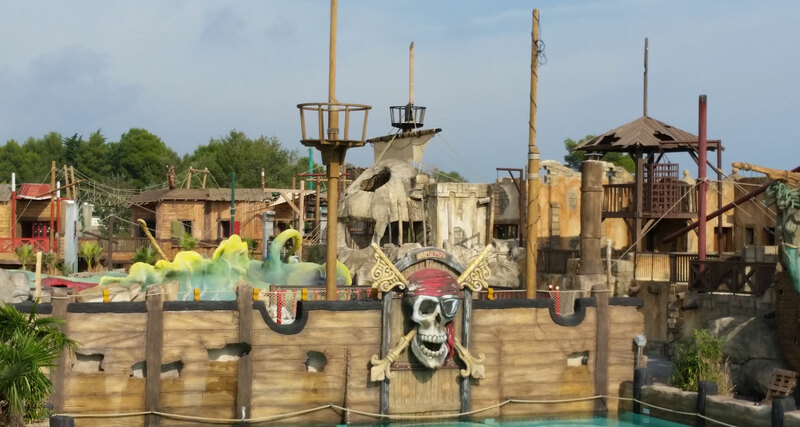 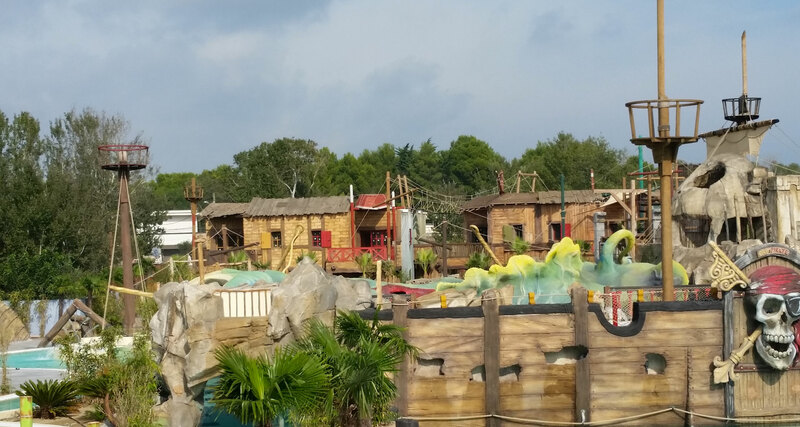 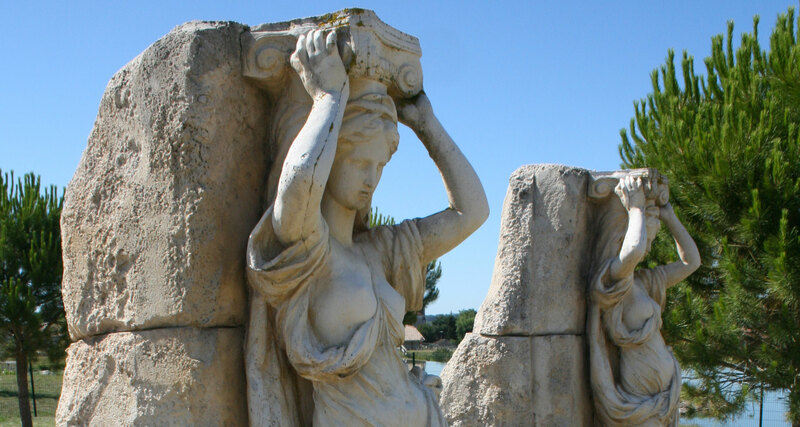 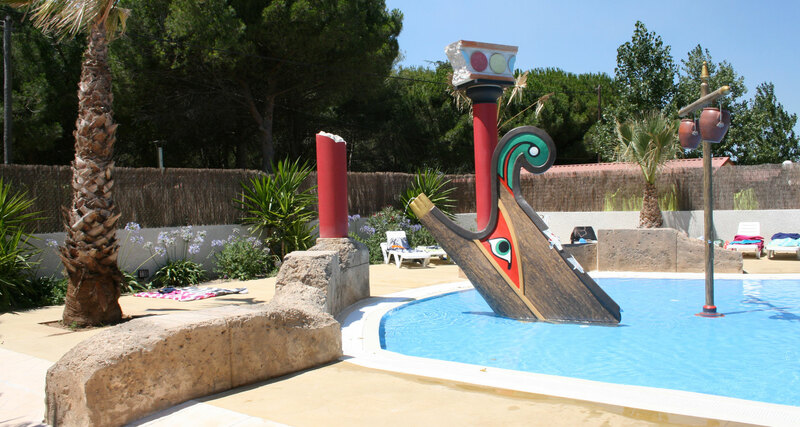 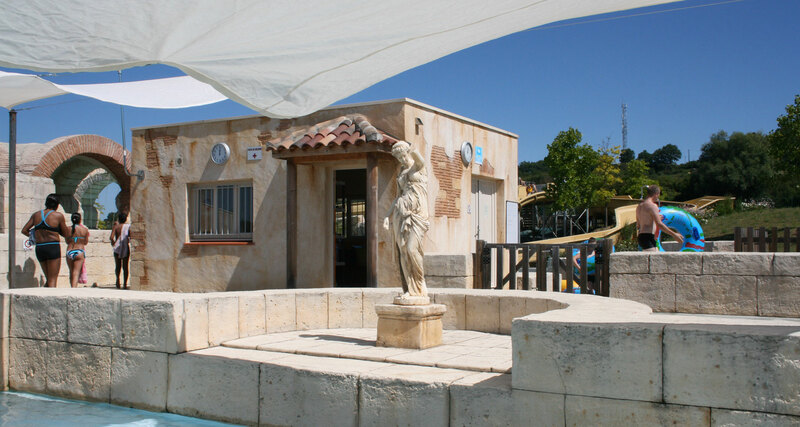 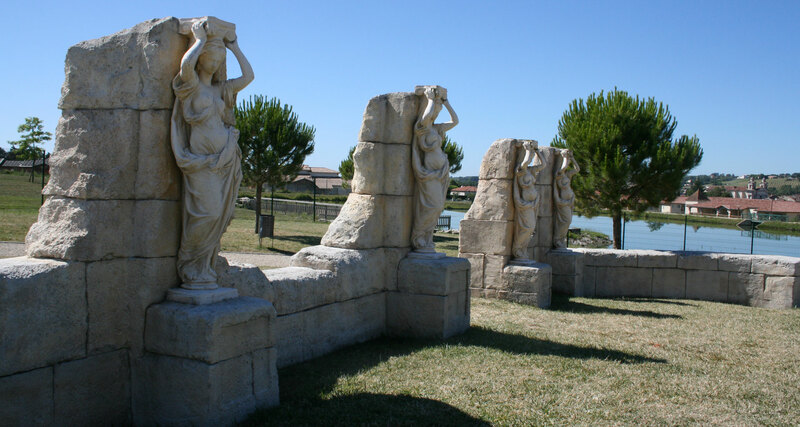 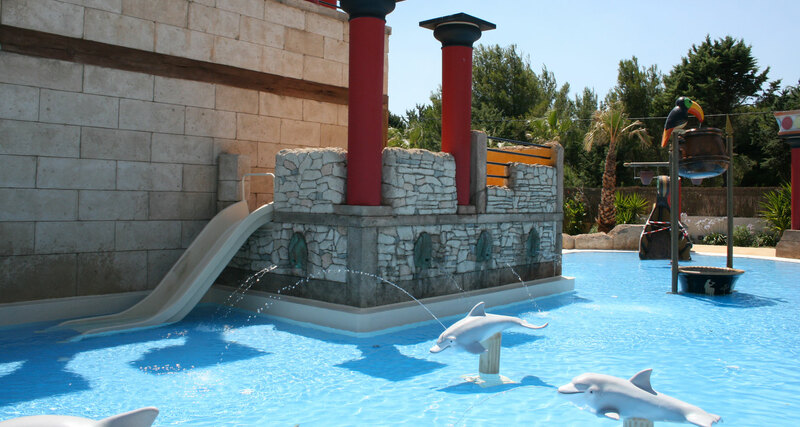 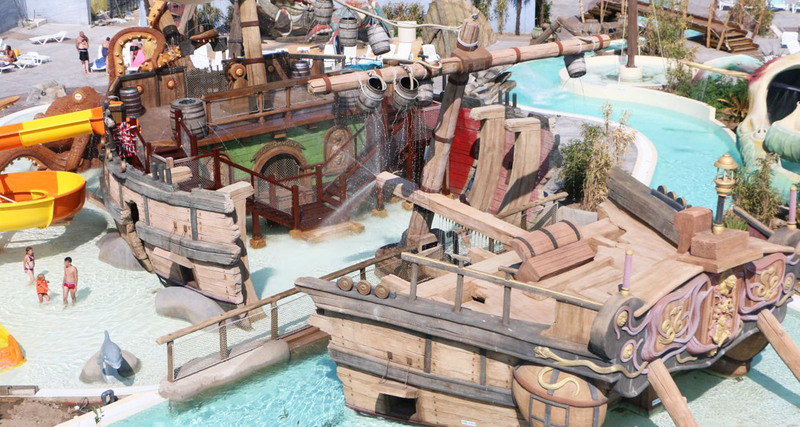 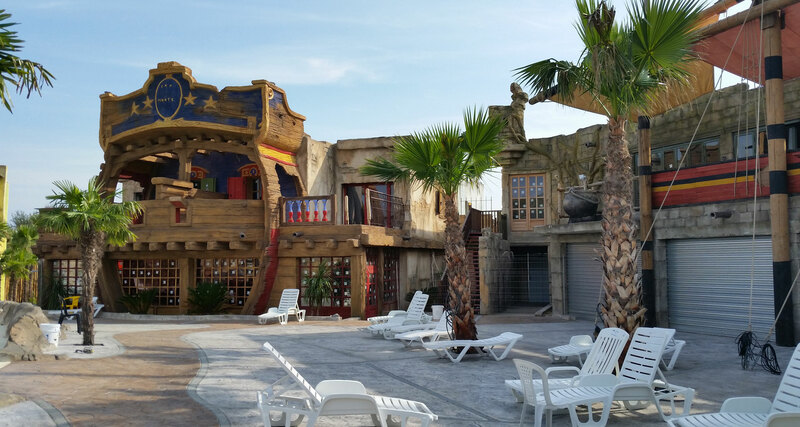 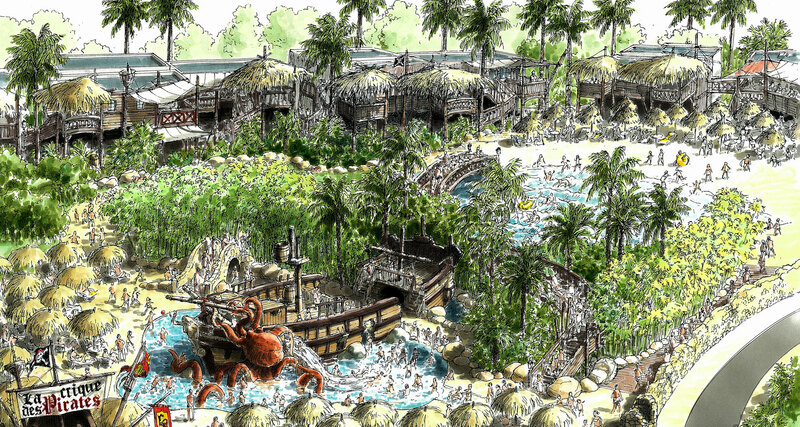 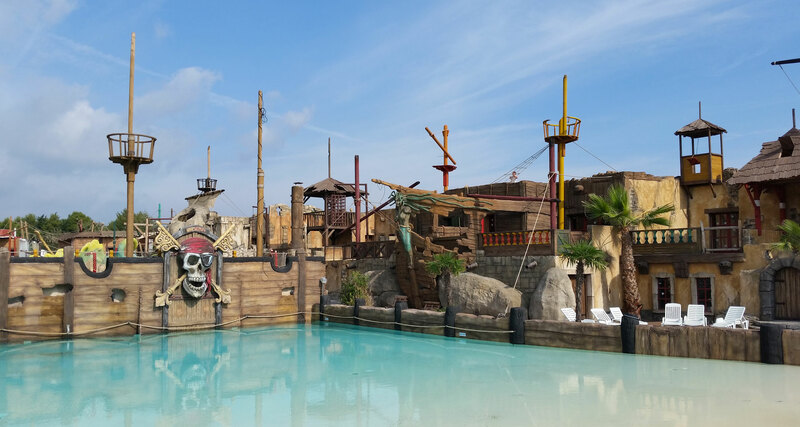 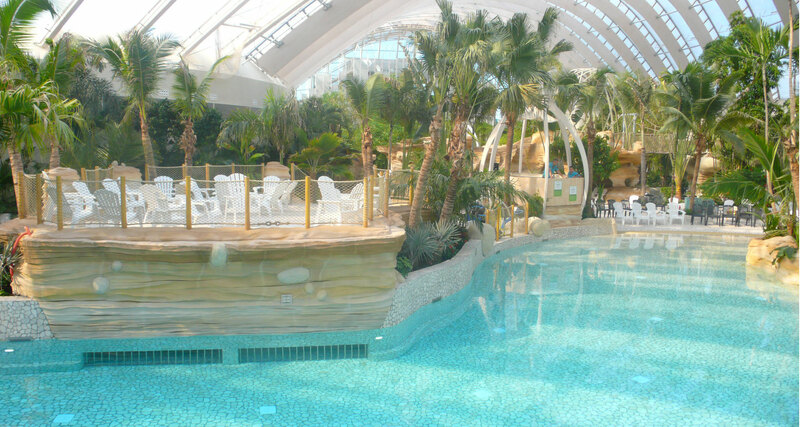 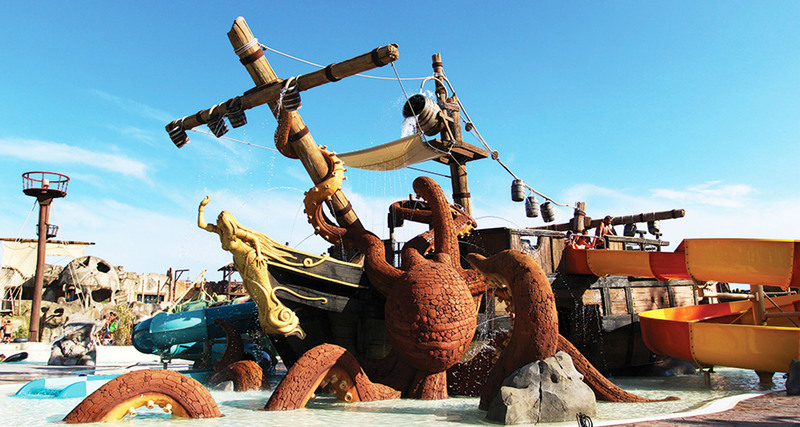 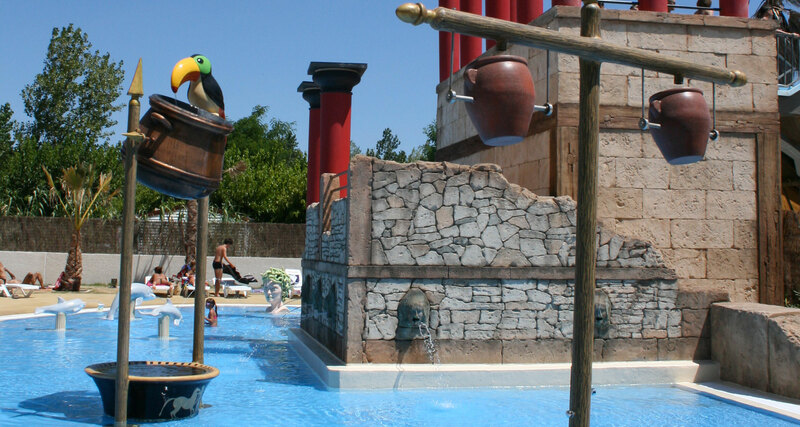 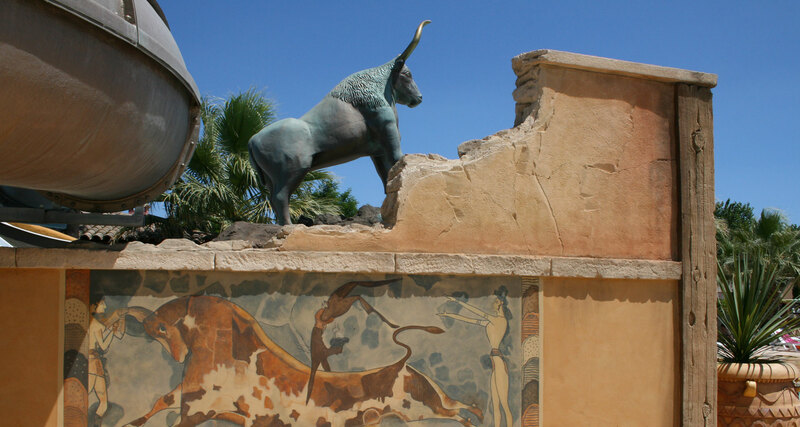 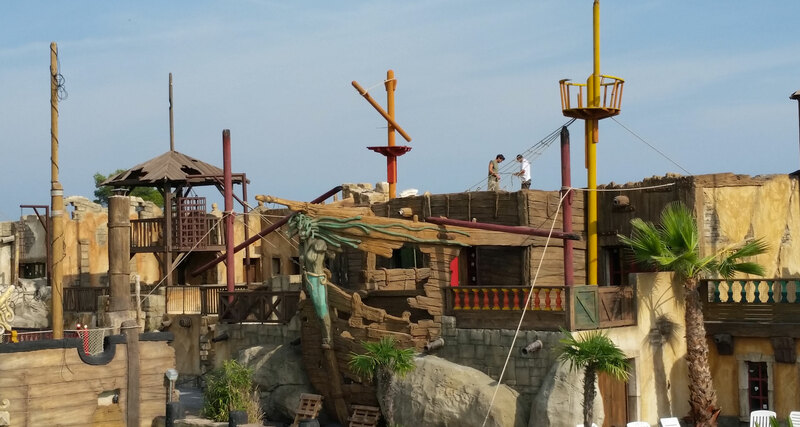 Turnkey execution of all the decors for the Aquatic Park – Old temples and artificial rocks (25,000m² of themed decors). 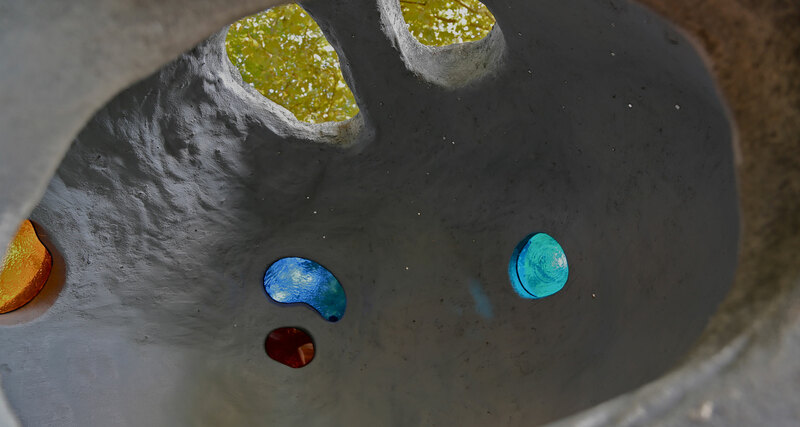 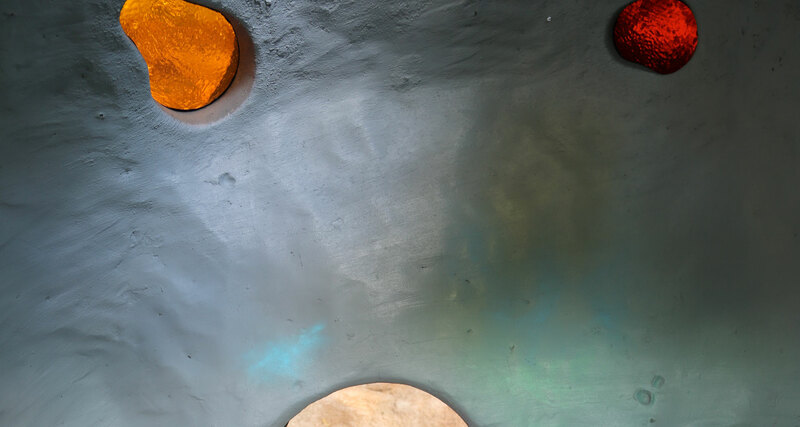 – Phase 1: development of retention basins (themed coatings and imitation stones). 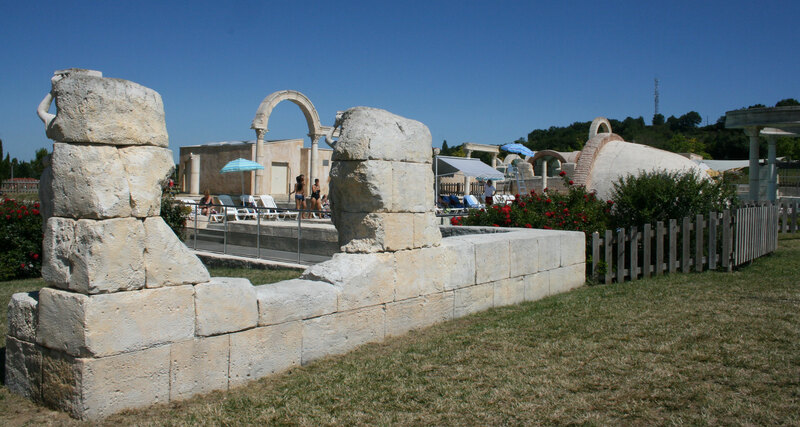 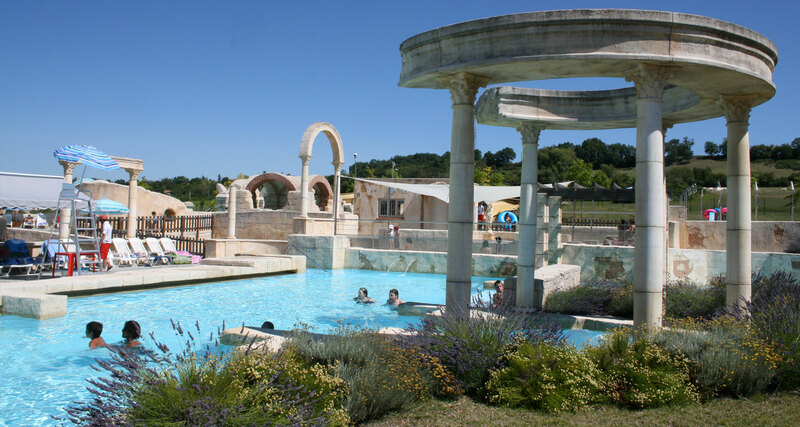 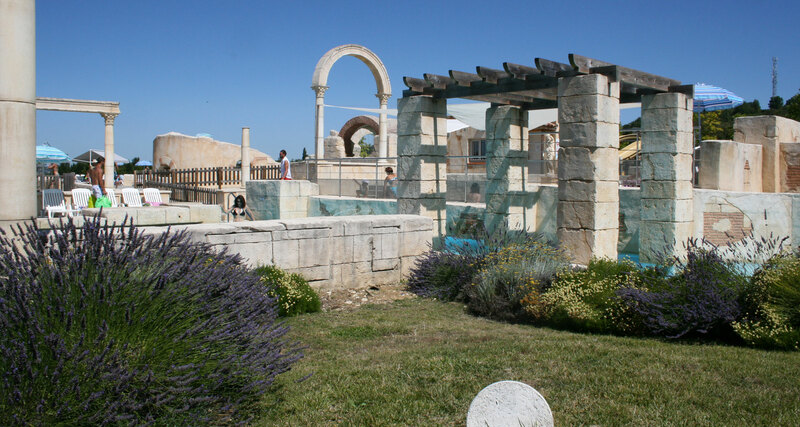 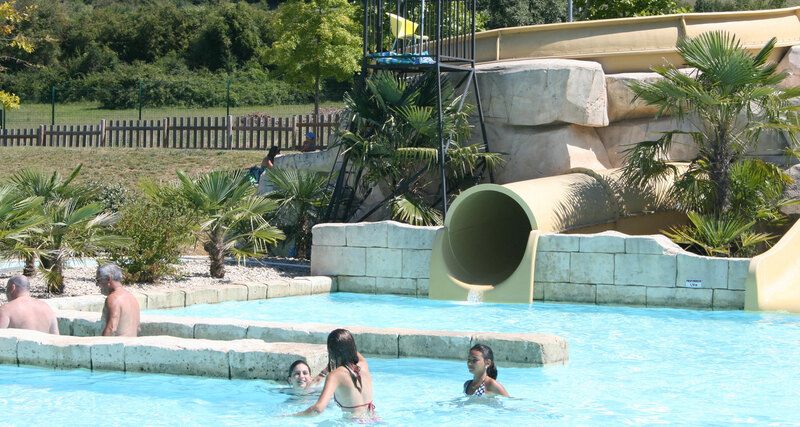 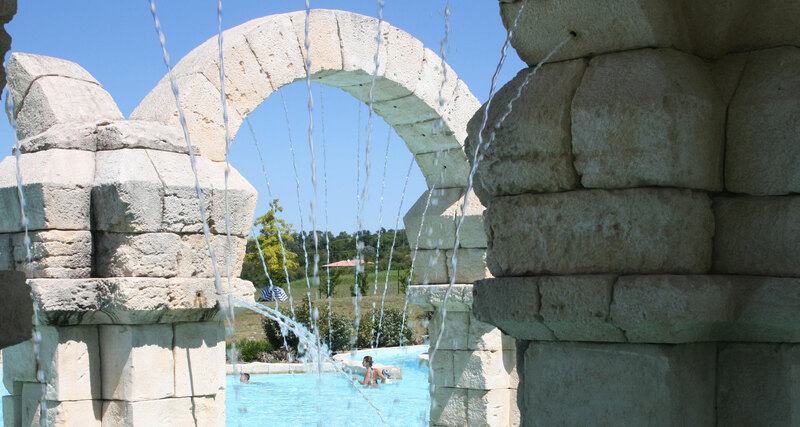 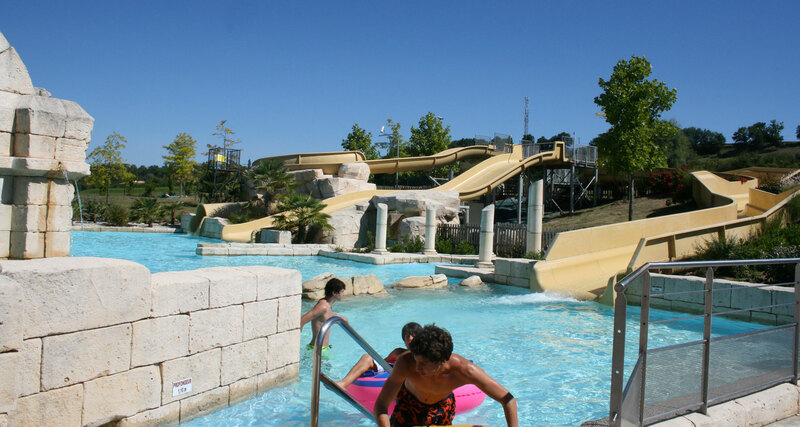 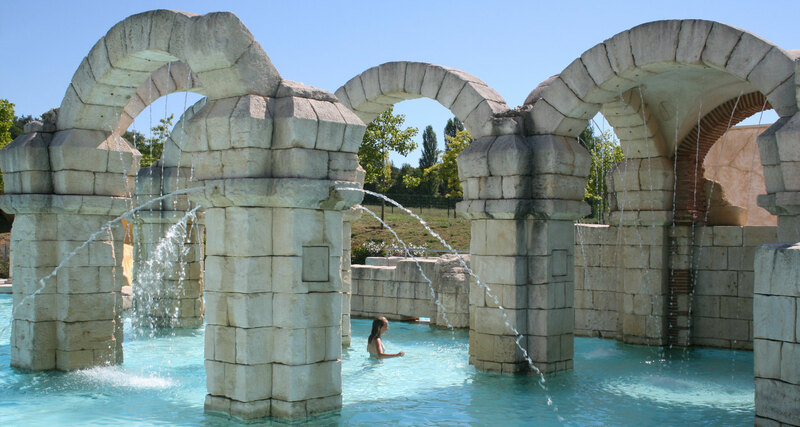 – Phase 2: design and development of an aquatic park: rock + creation of a replica of a Gallo-Roman villa – 1,700m². 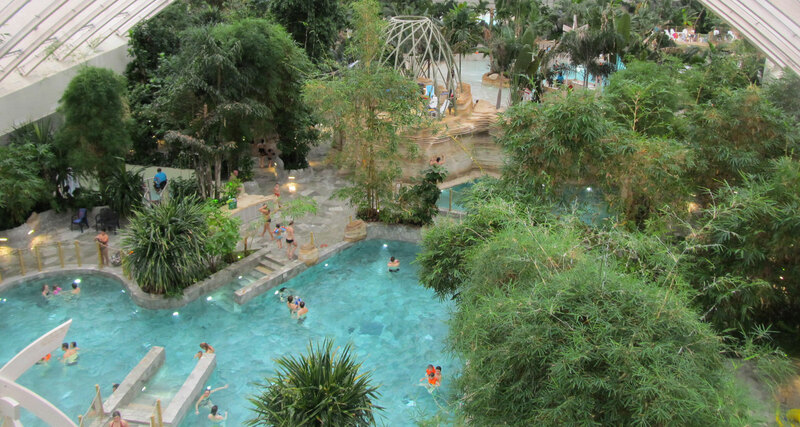 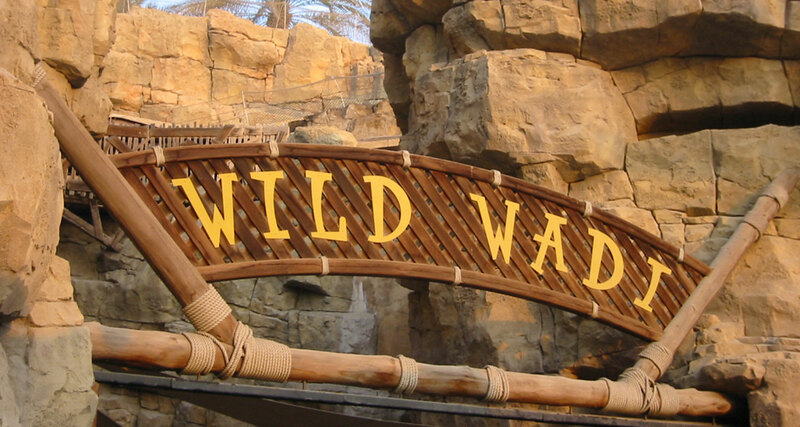 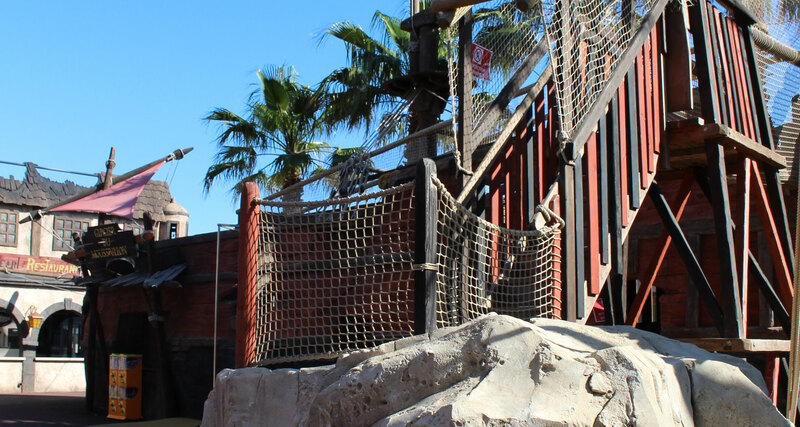 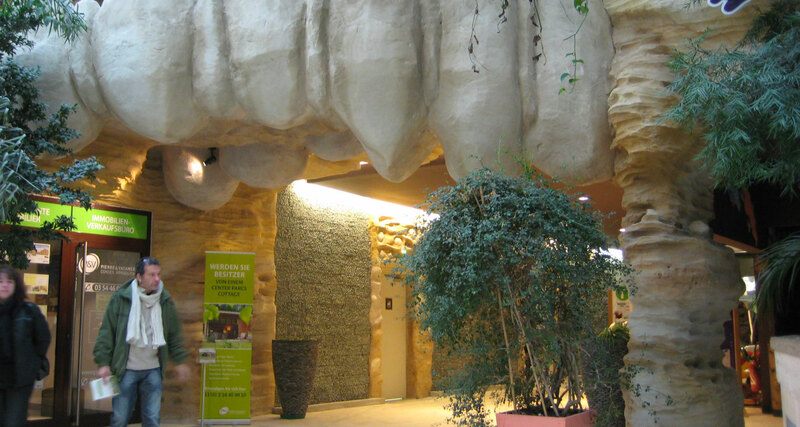 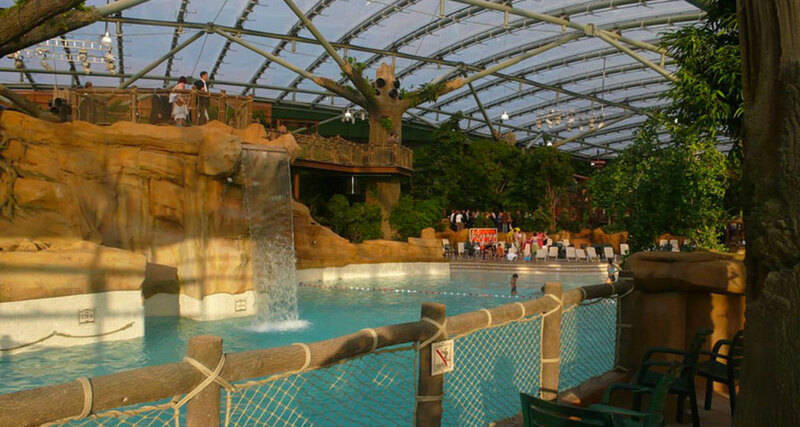 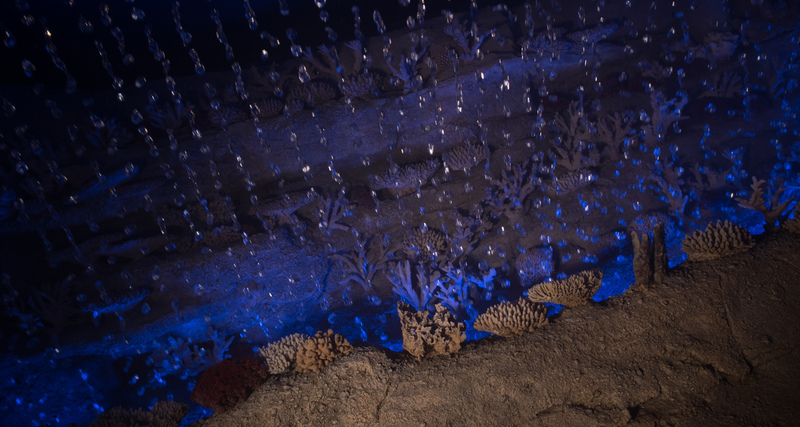 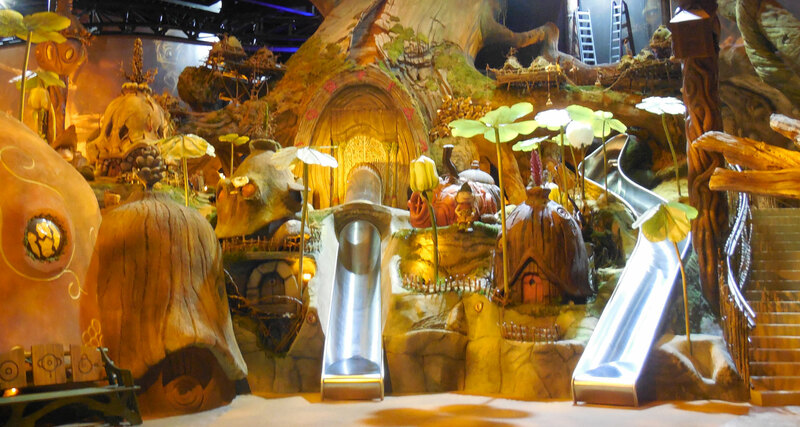 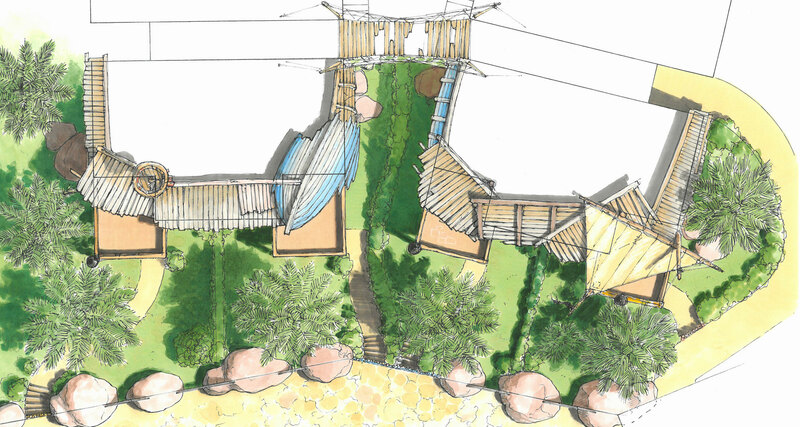 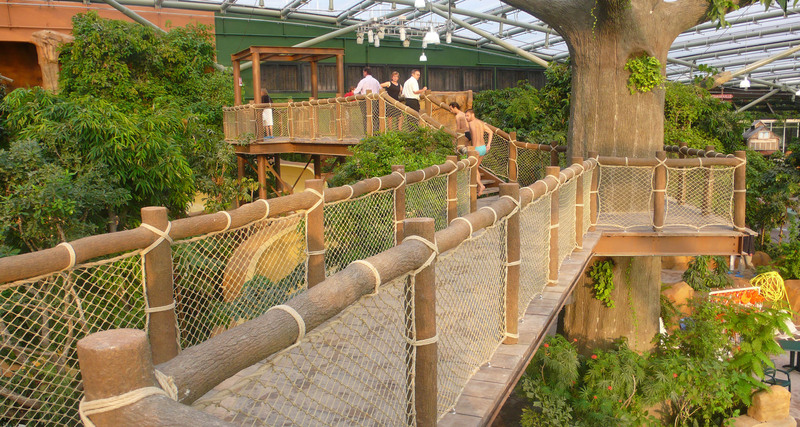 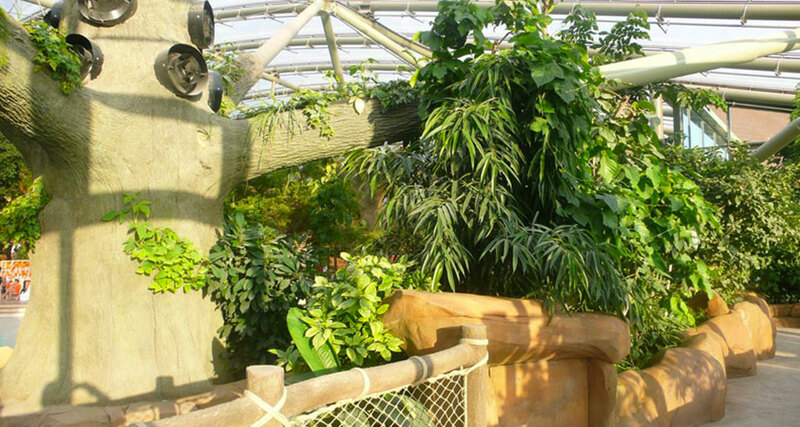 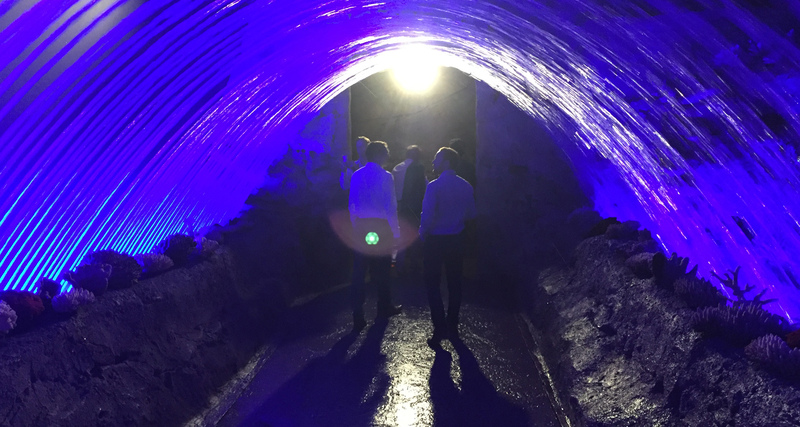 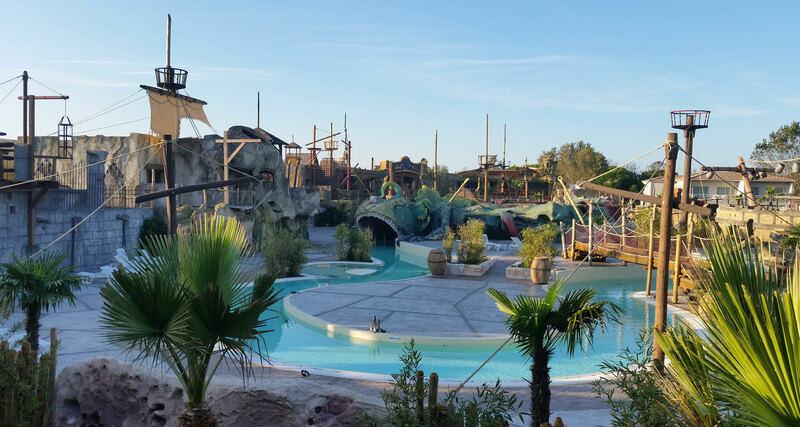 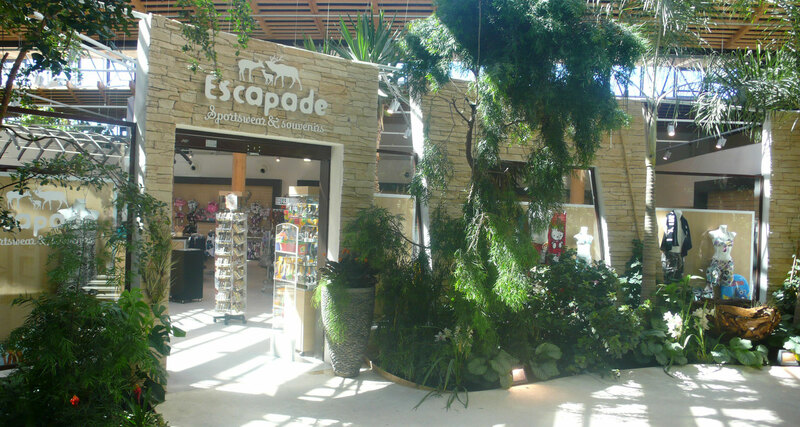 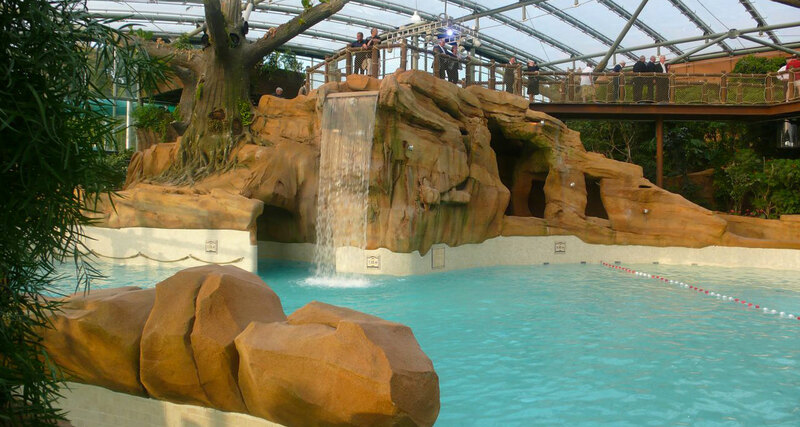 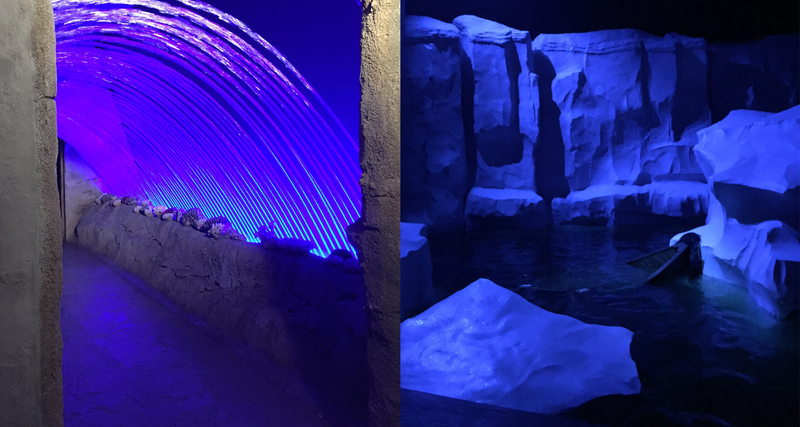 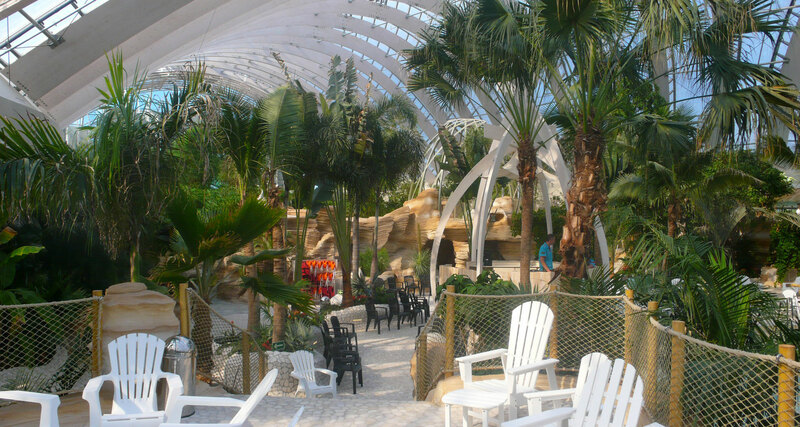 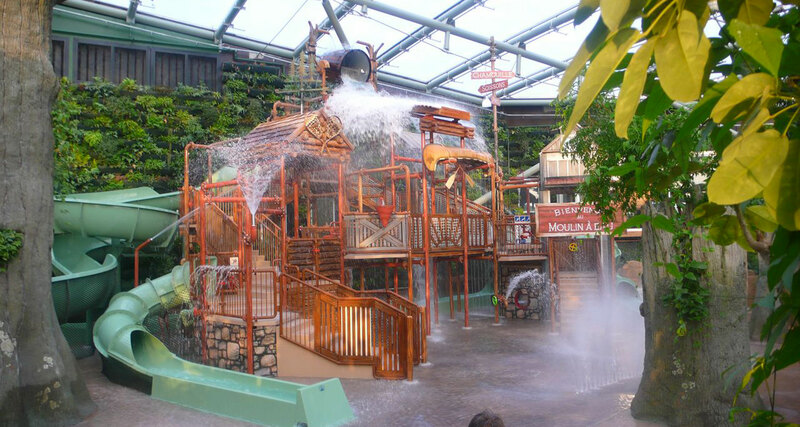 Production of more than 5,000m² of themed decor in the Aquamundo: artificial rocks, printed floors, artificial trees, waterfall, banks, flower boxes, cave, suspension bridge, walkways, execution of wooden stamped plates – monkey bridge. 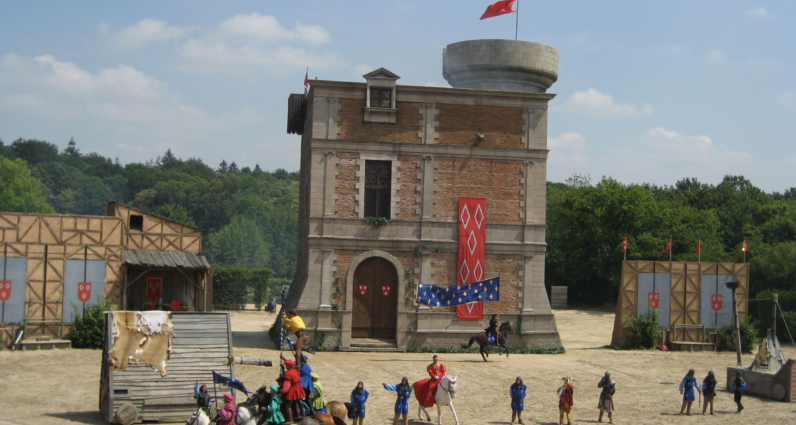 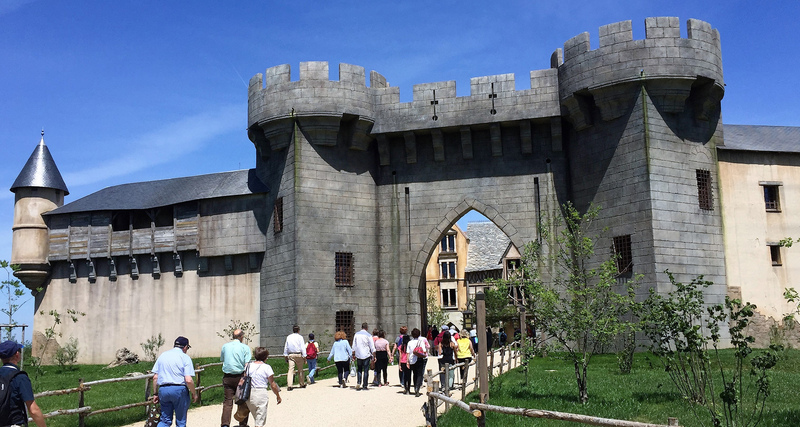 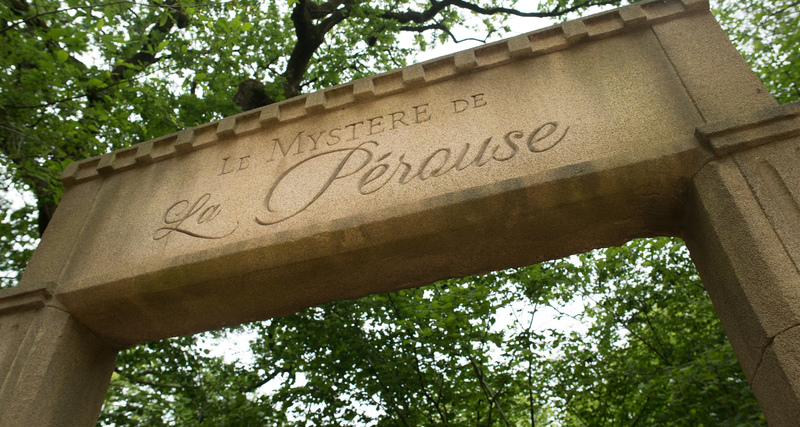 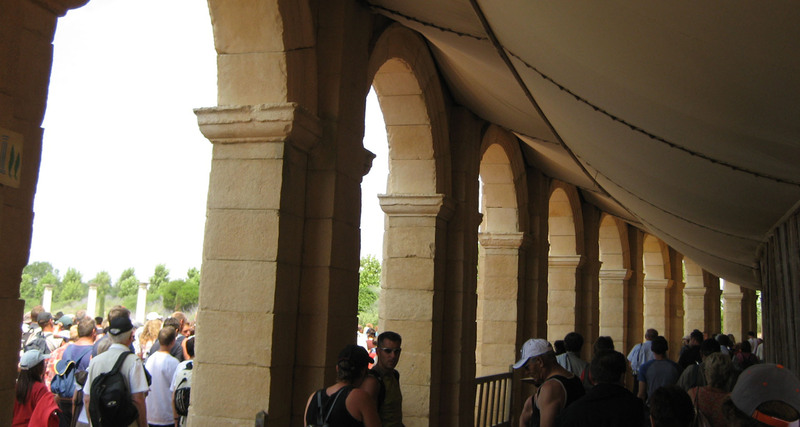 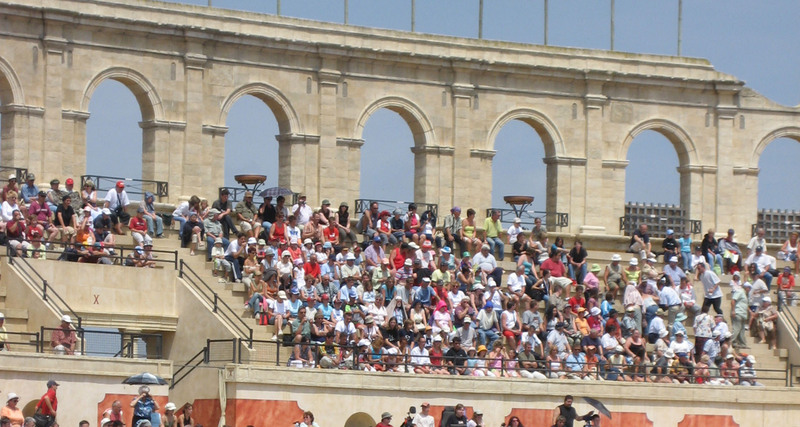 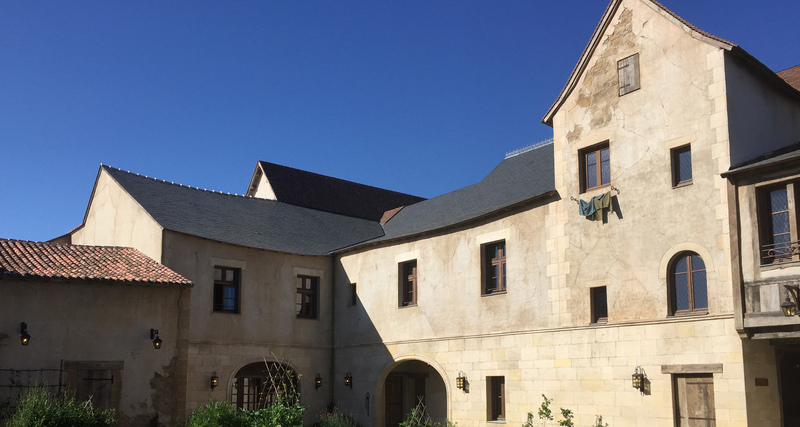 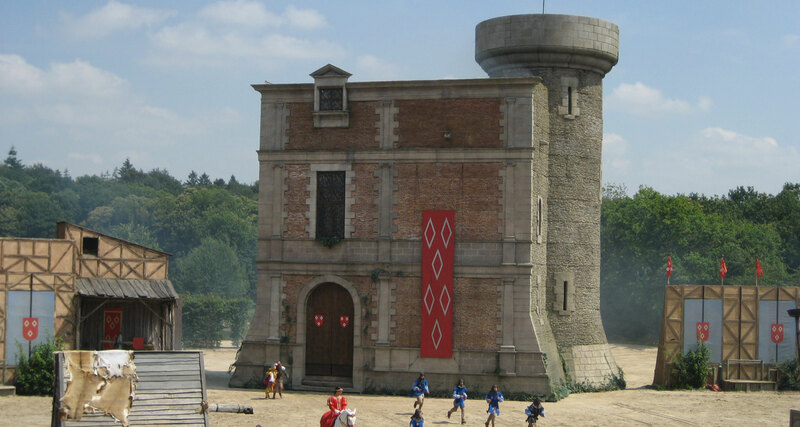 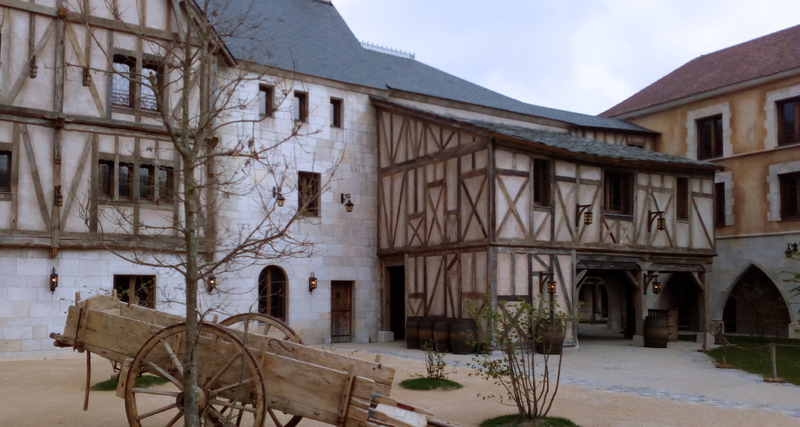 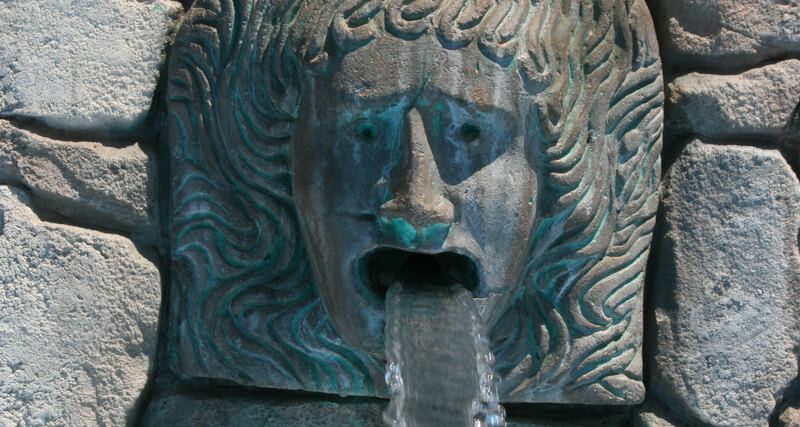 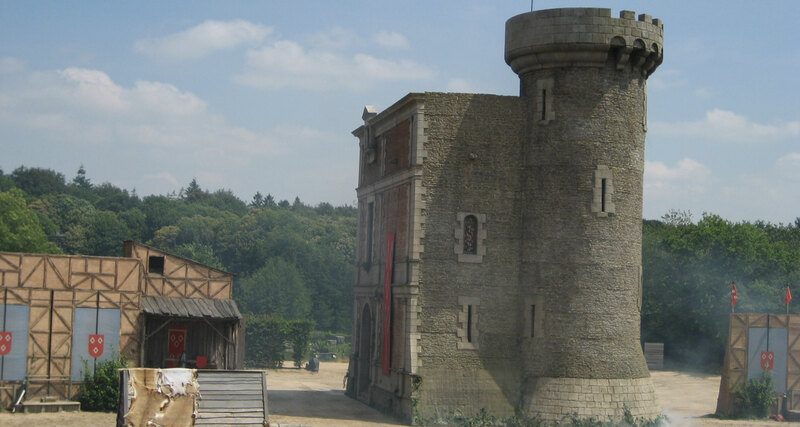 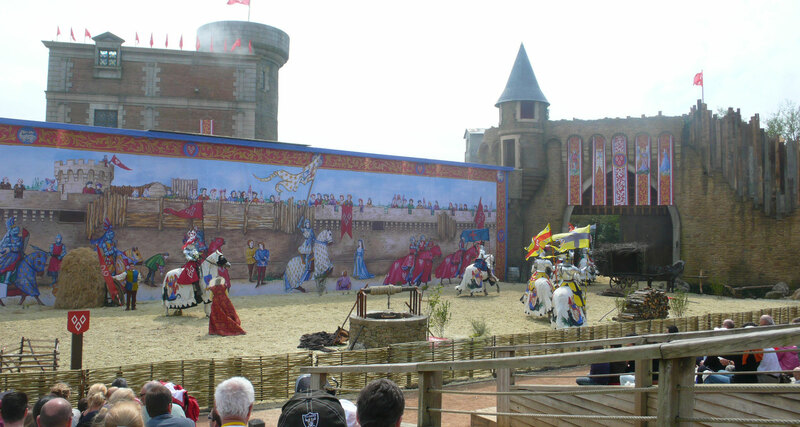 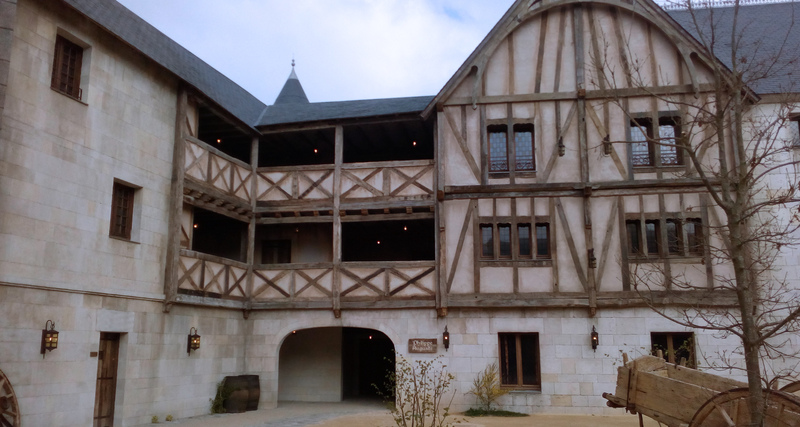 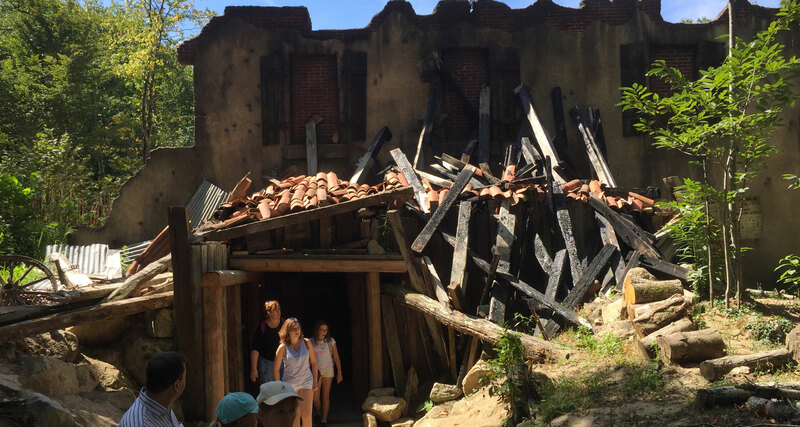 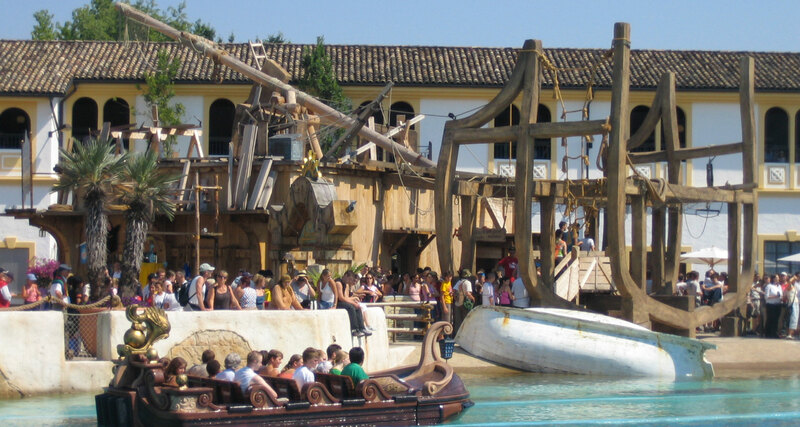 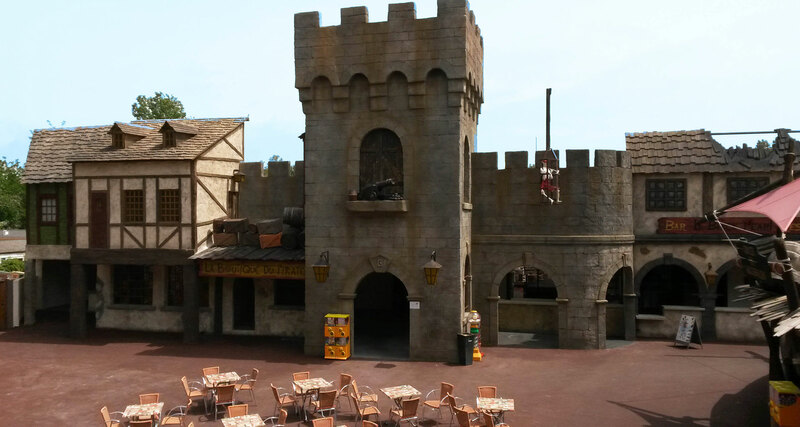 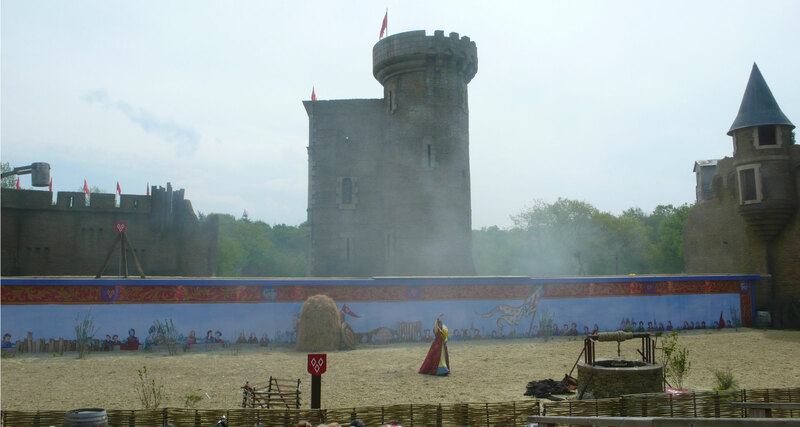 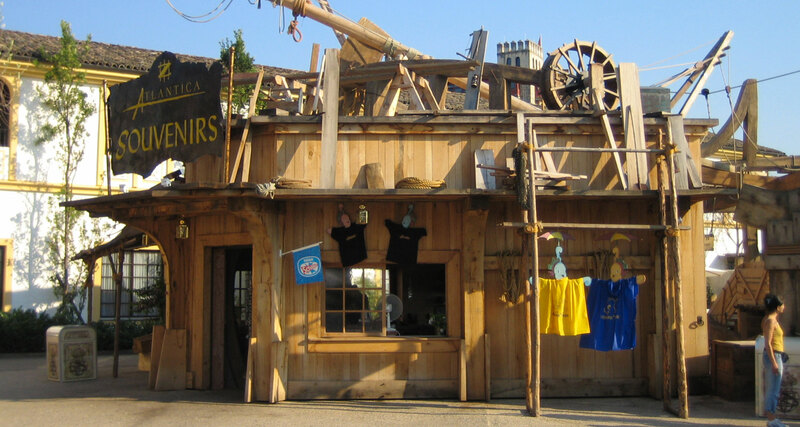 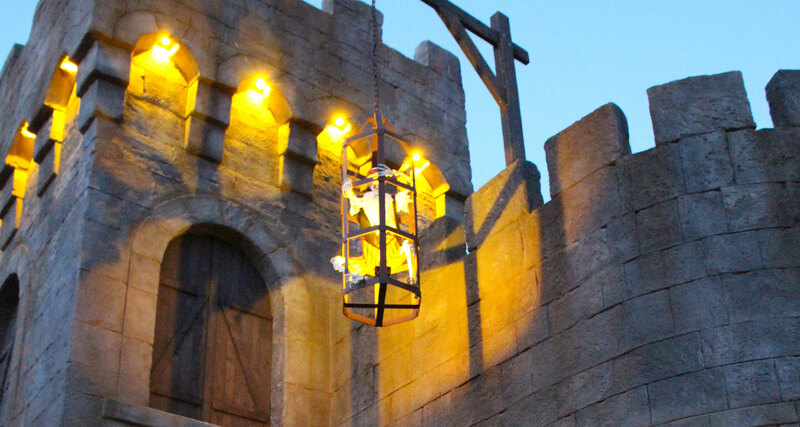 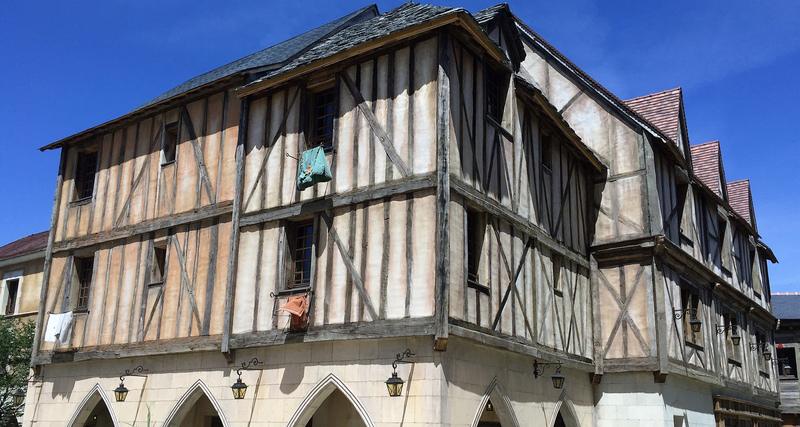 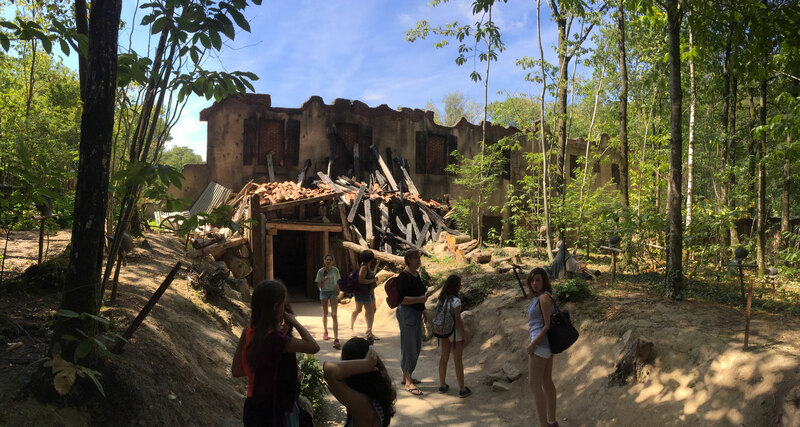 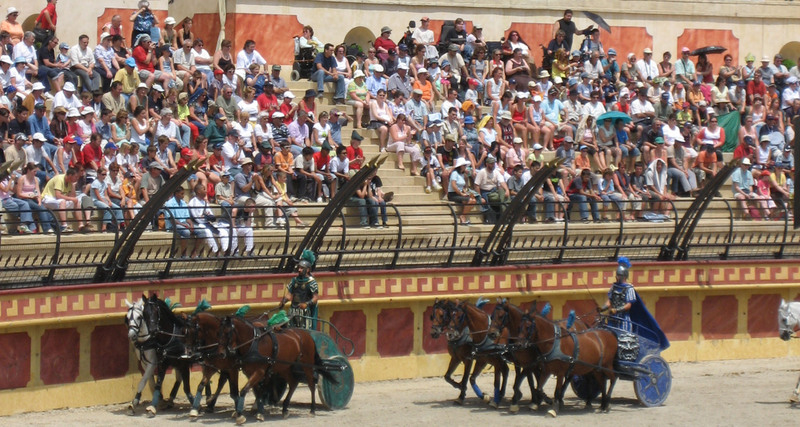 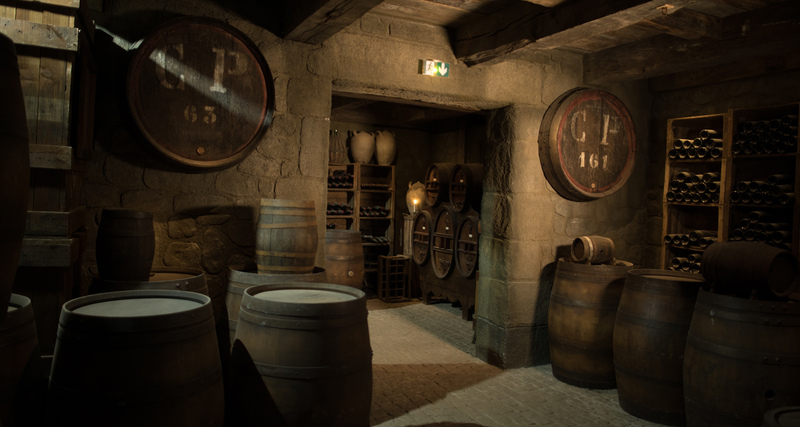 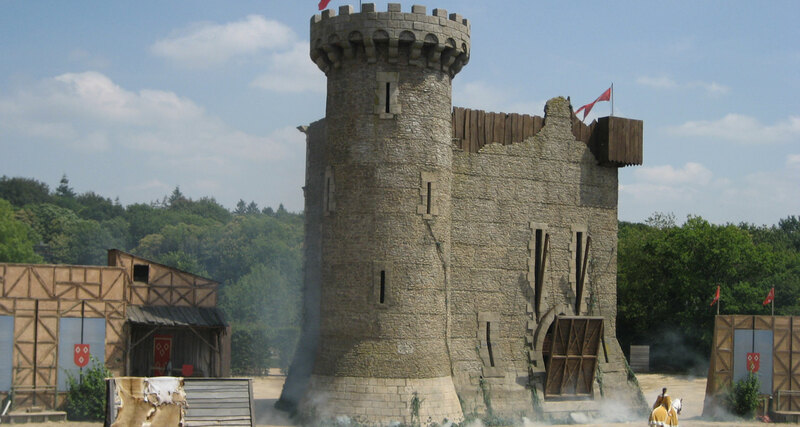 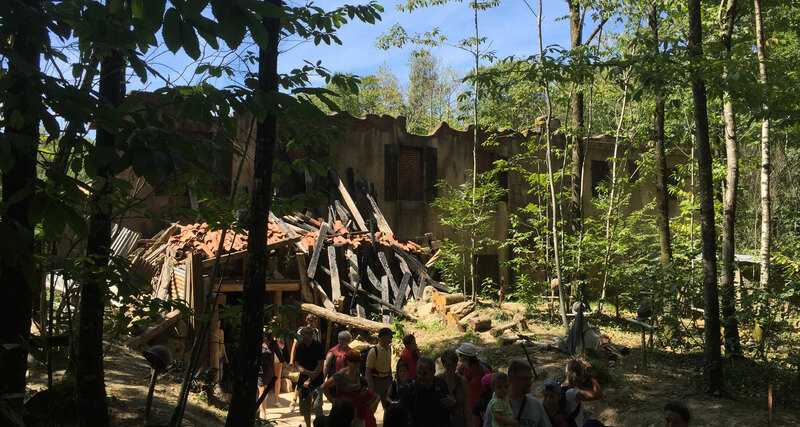 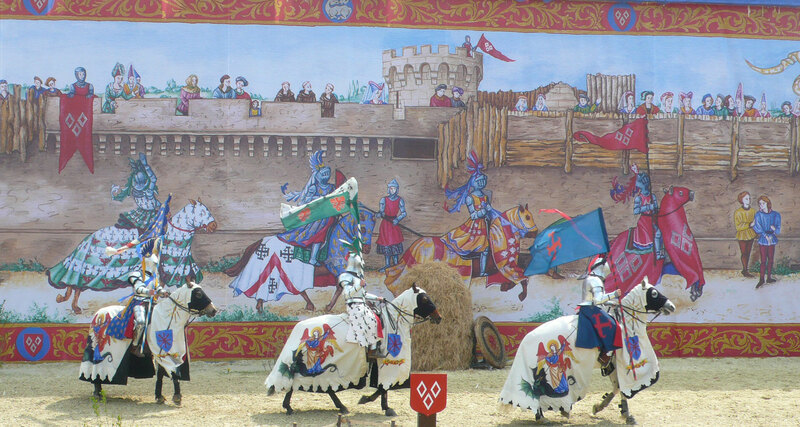 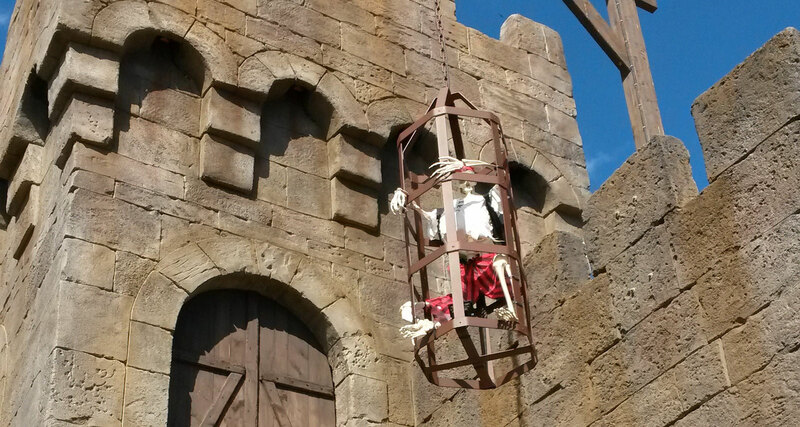 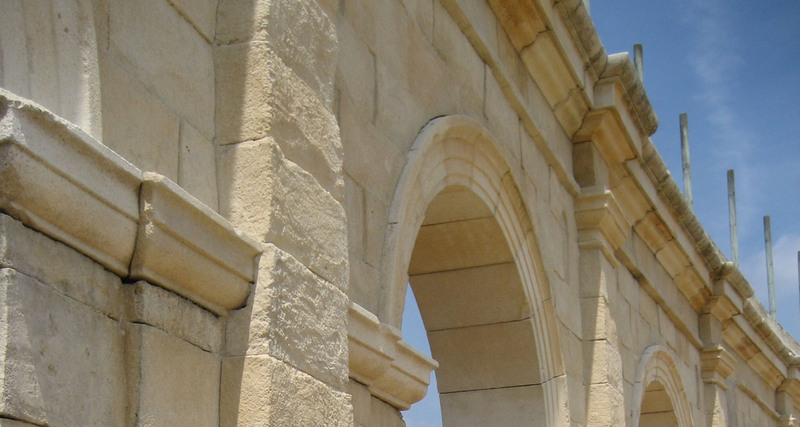 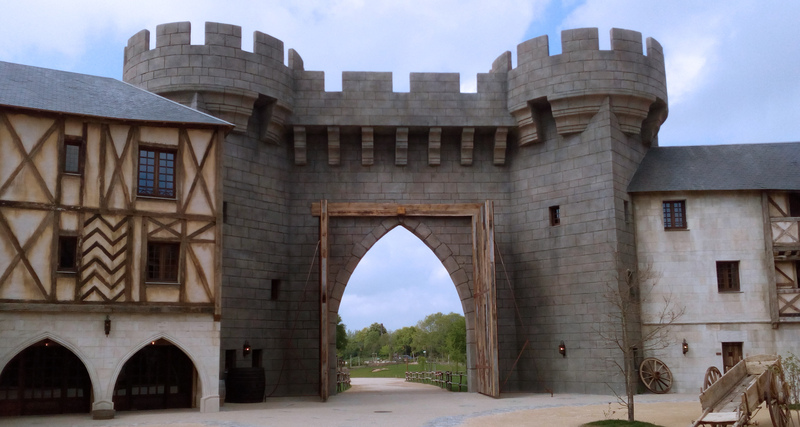 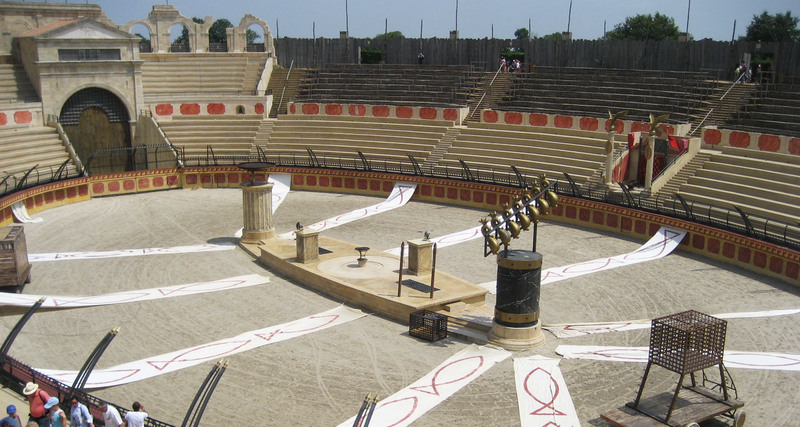 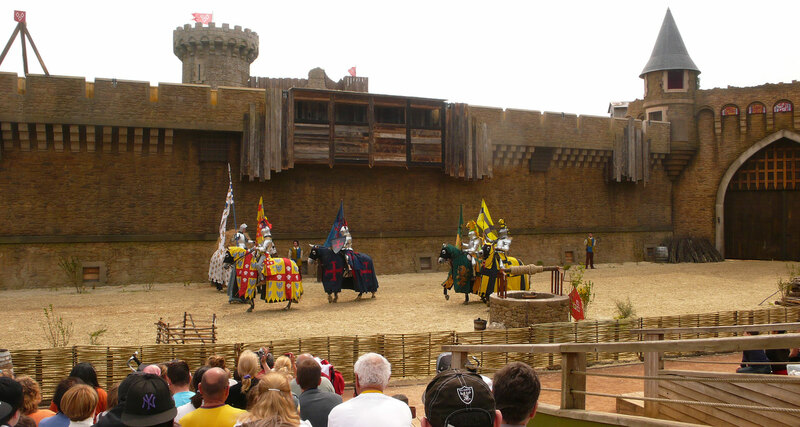 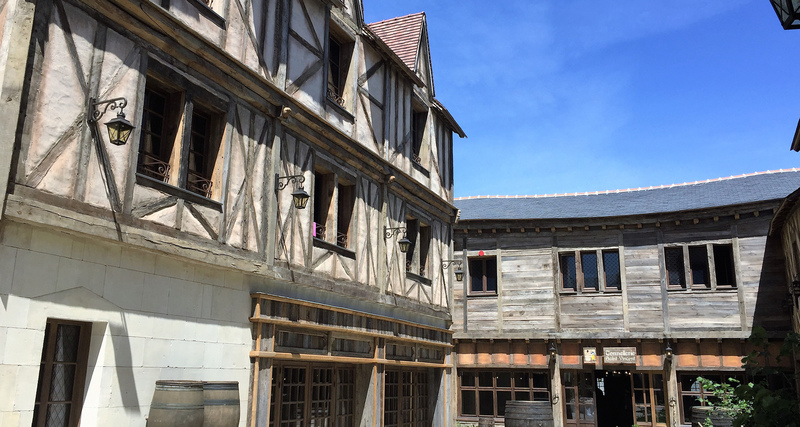 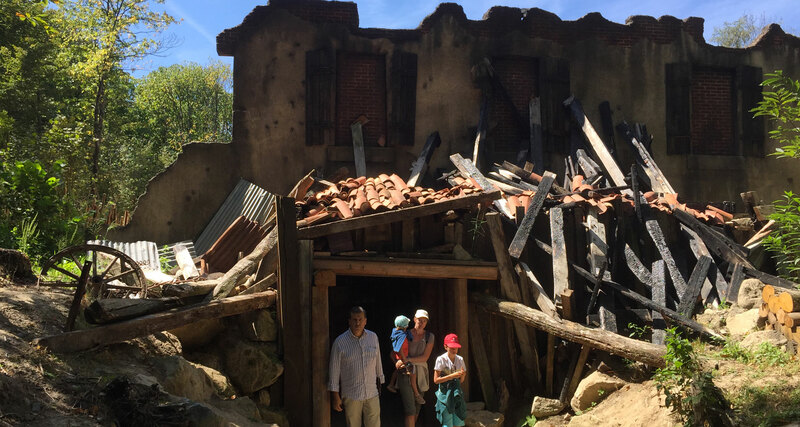 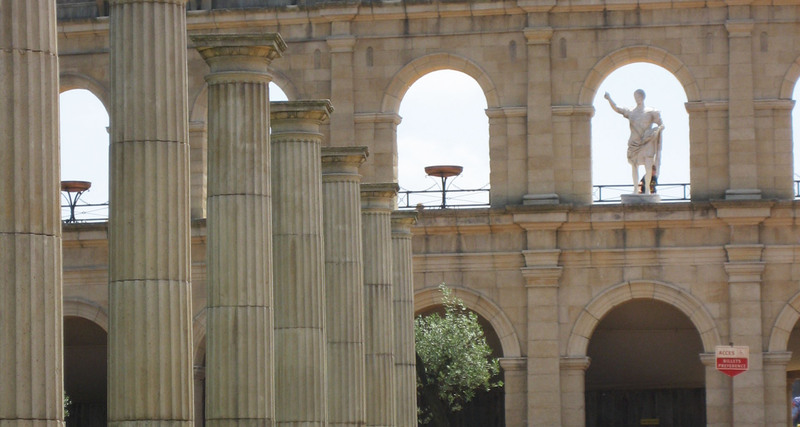 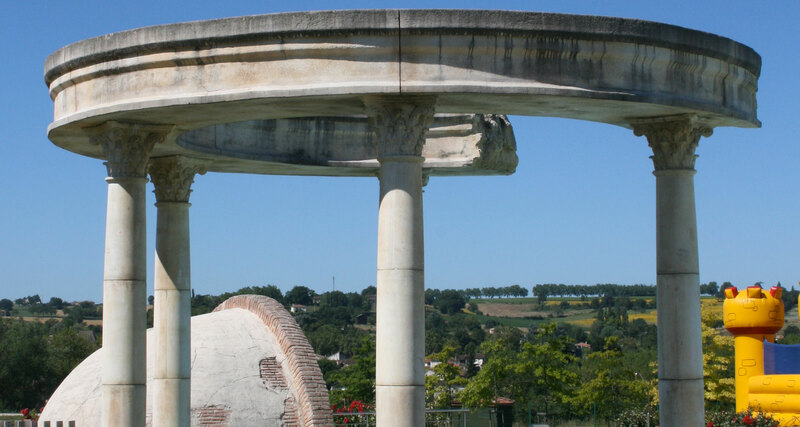 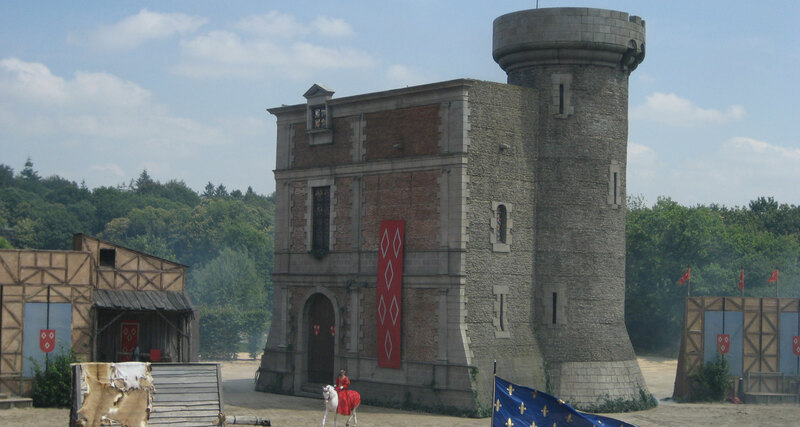 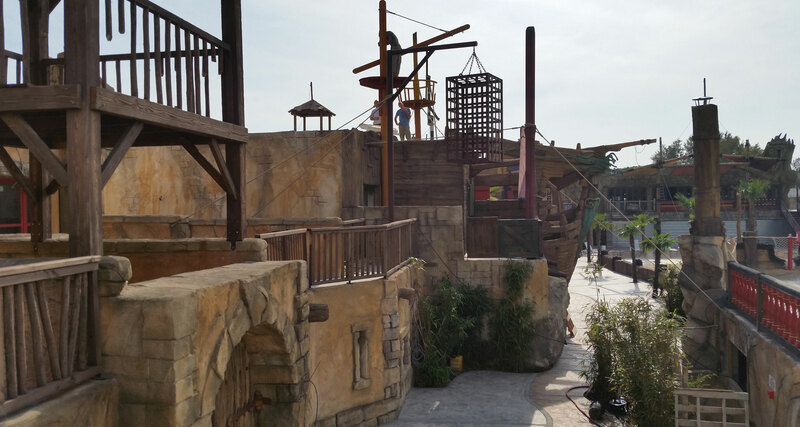 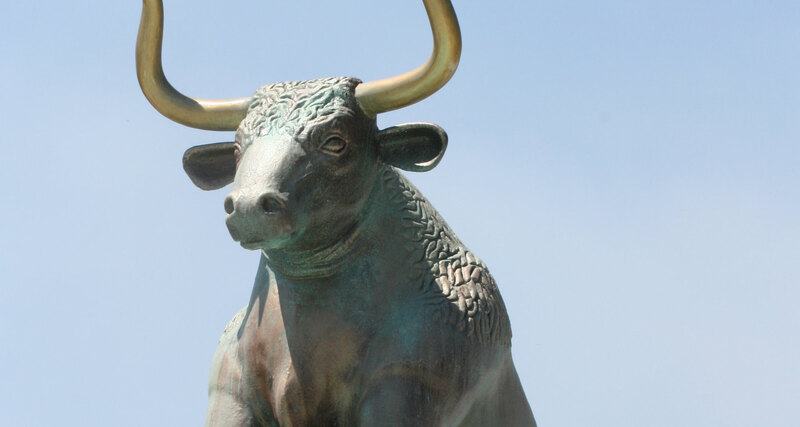 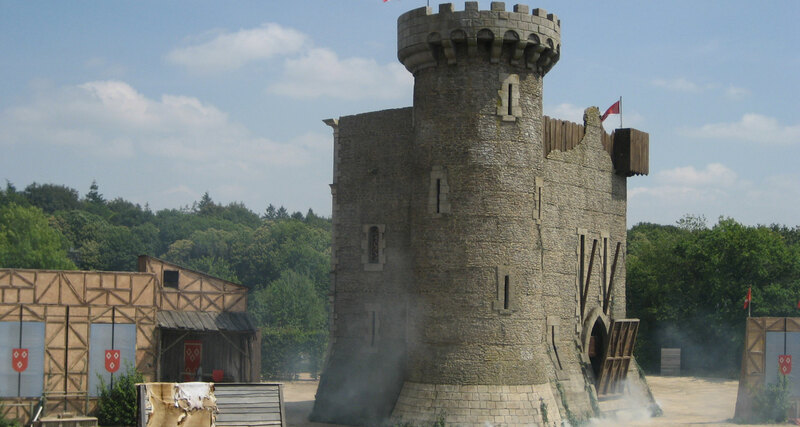 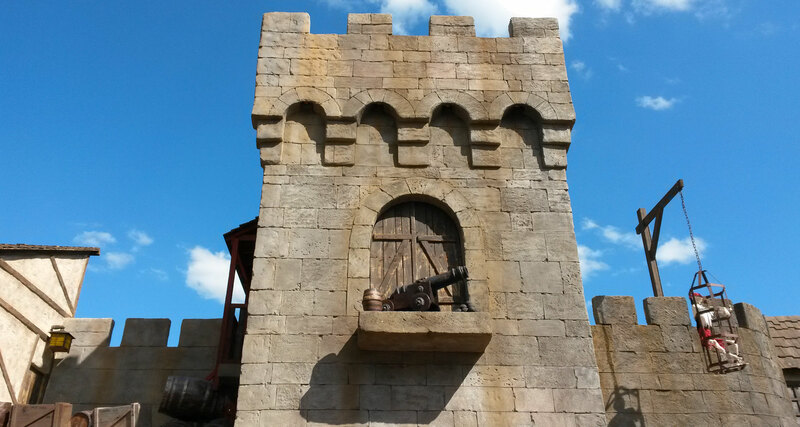 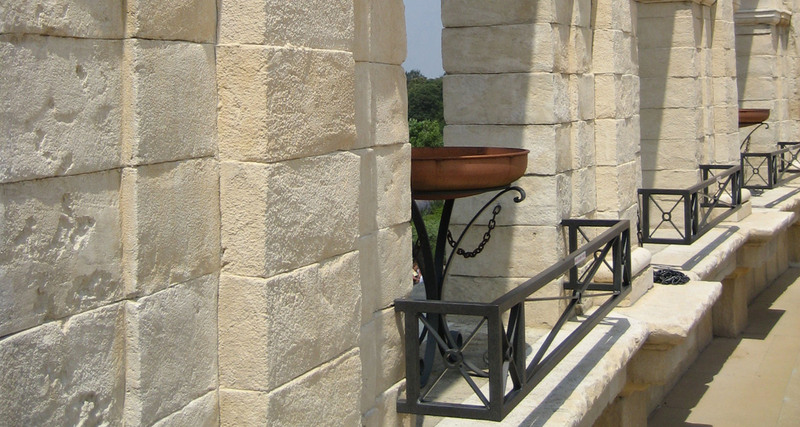 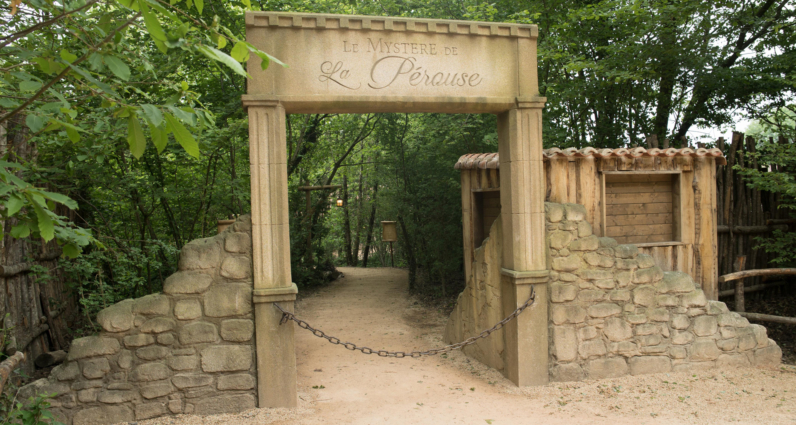 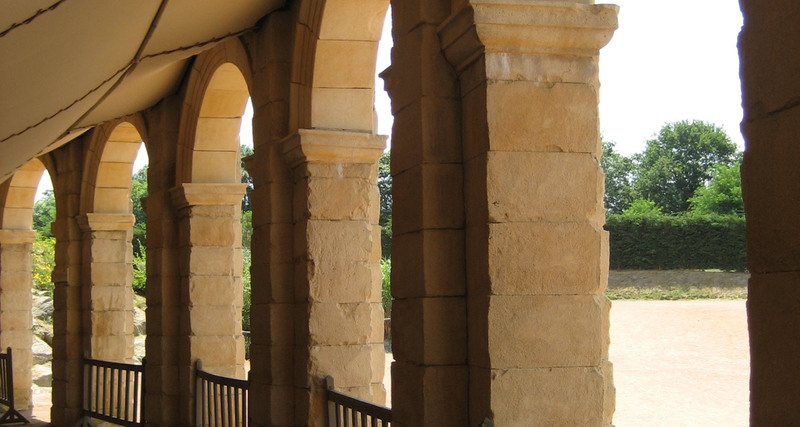 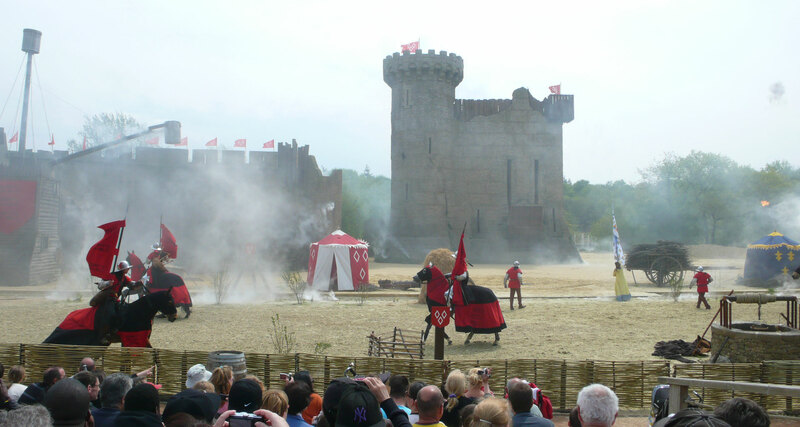 Le Puy du Fou is a leisure park with an historical theme. 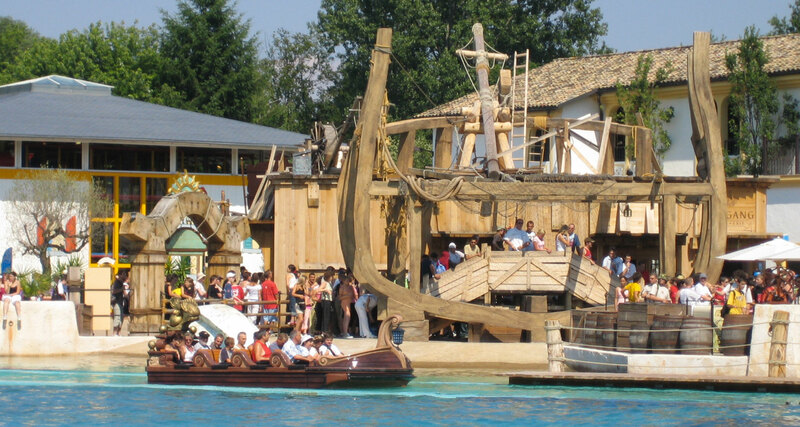 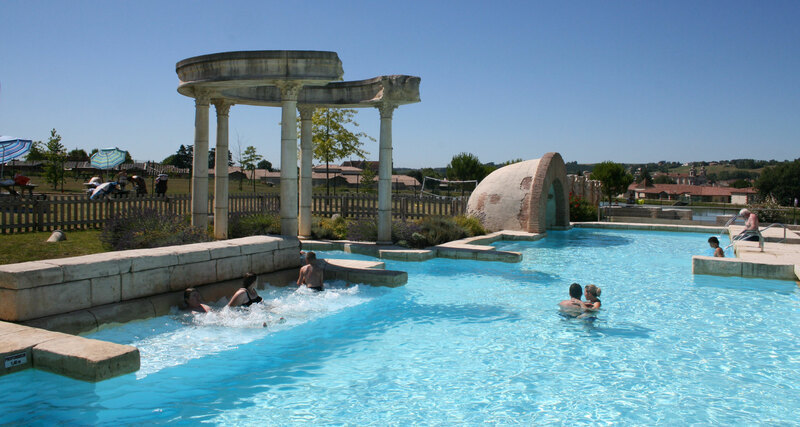 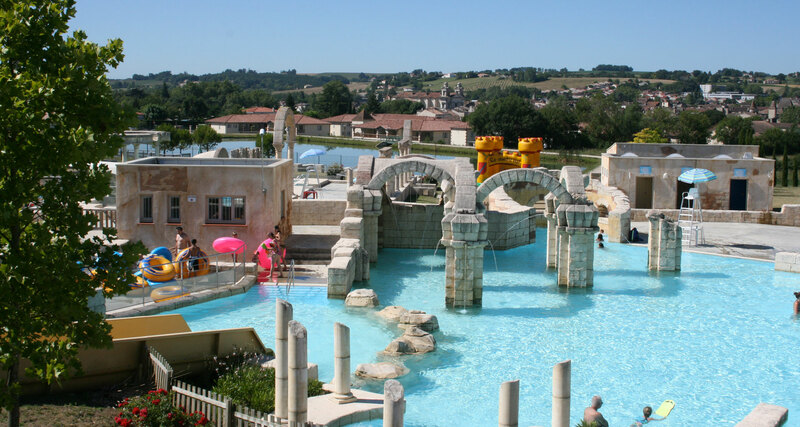 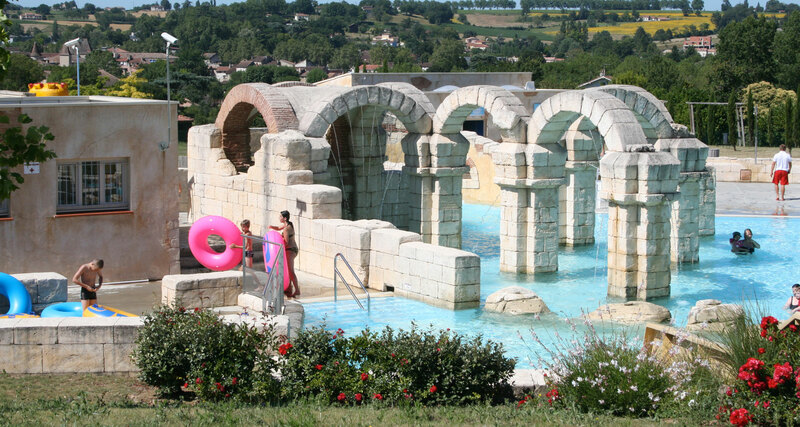 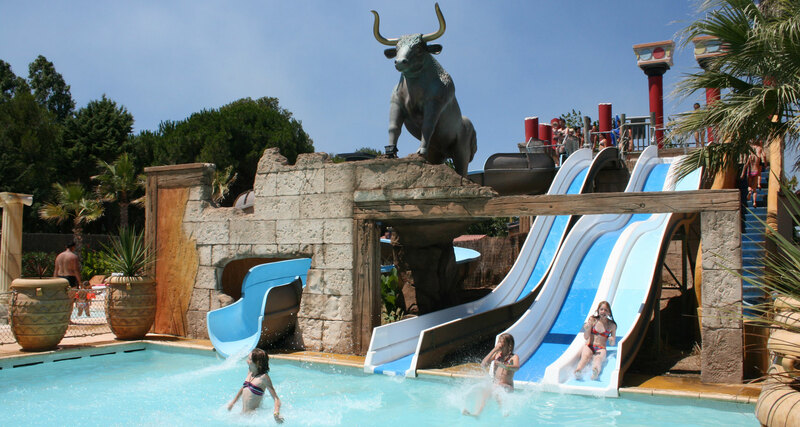 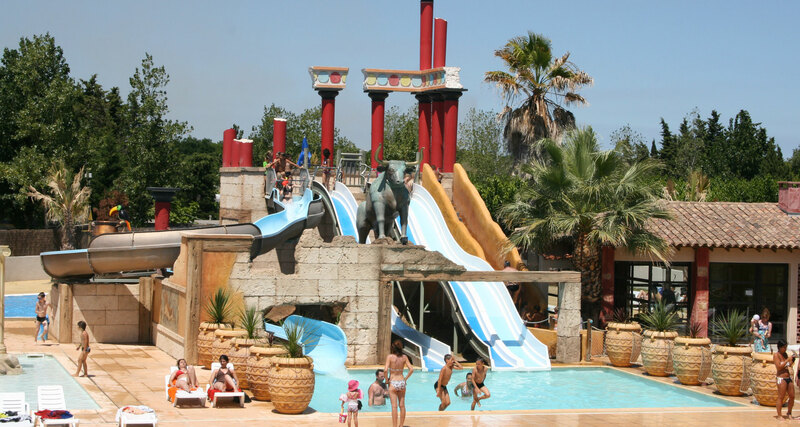 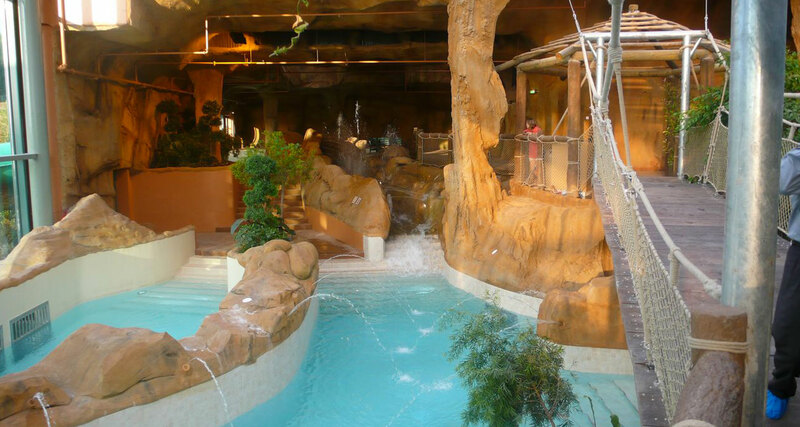 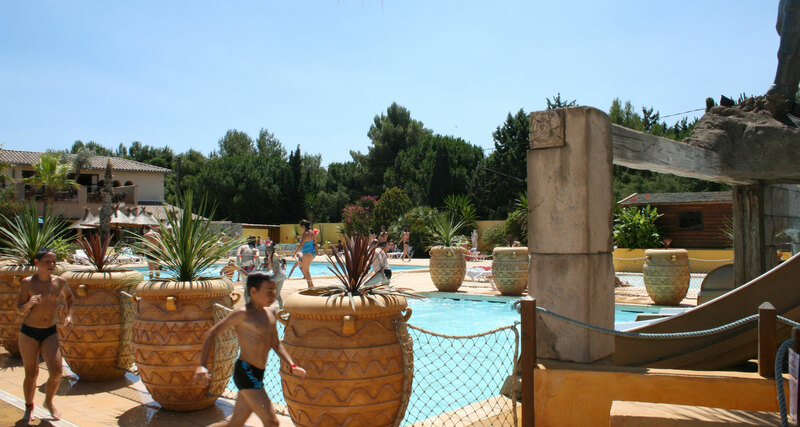 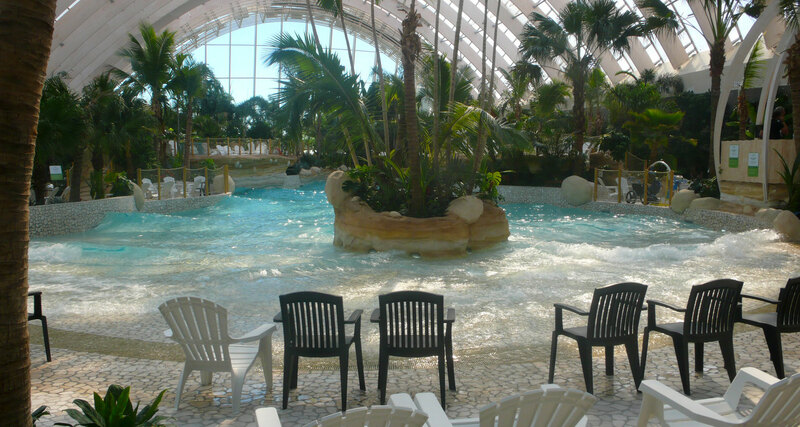 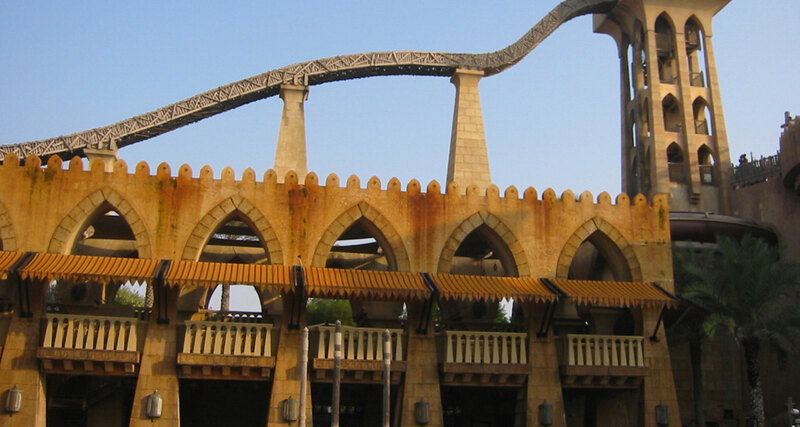 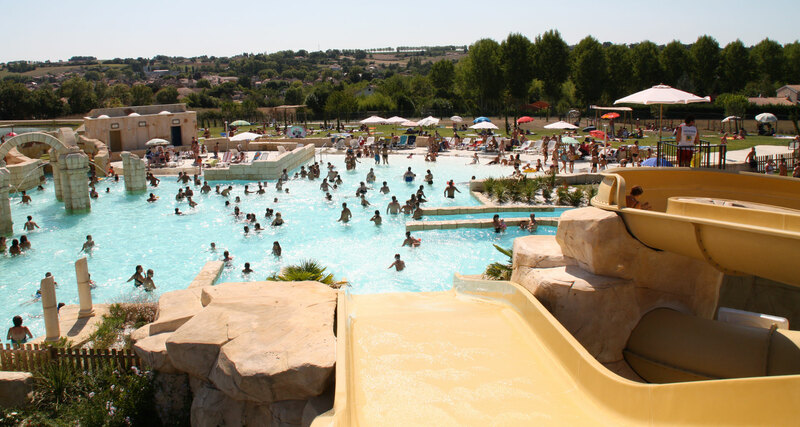 Located in the Vendée region, it is the fourth largest theme park in France. 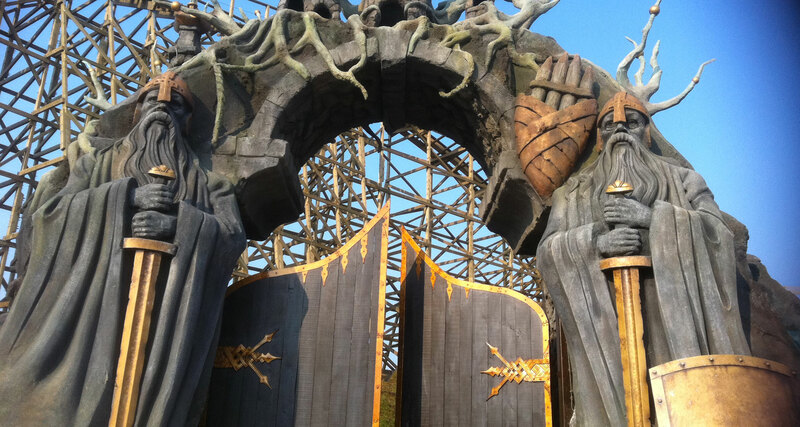 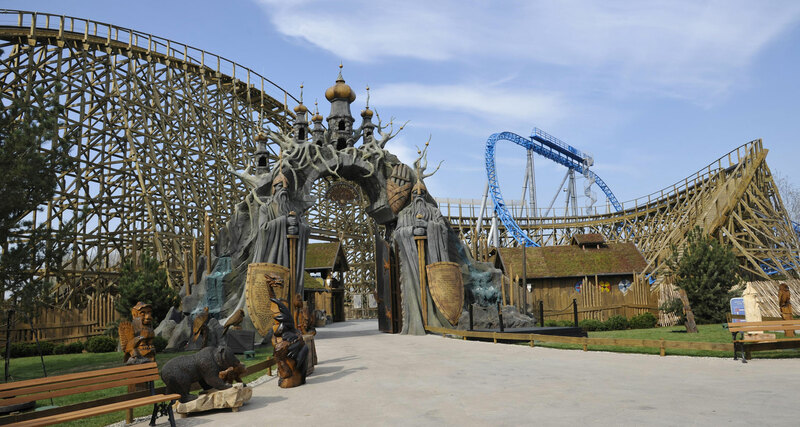 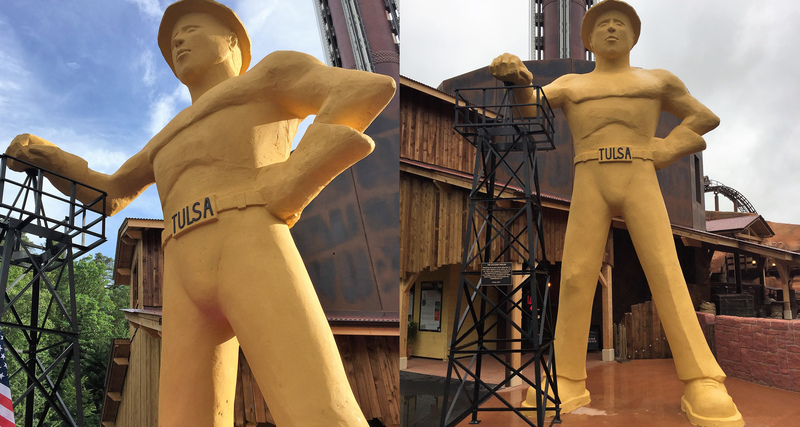 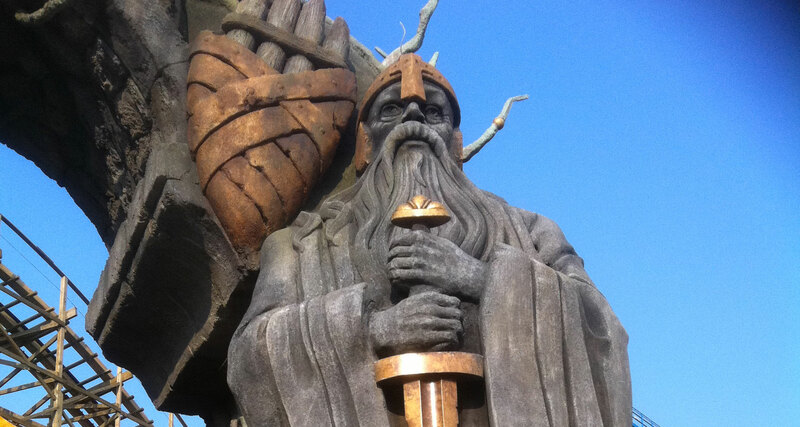 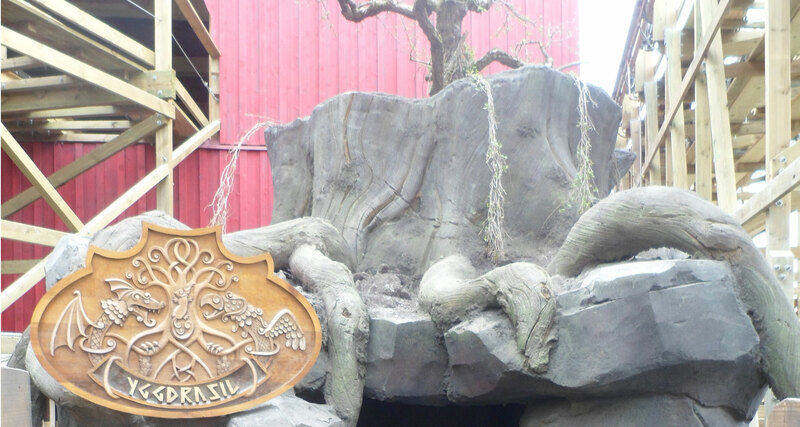 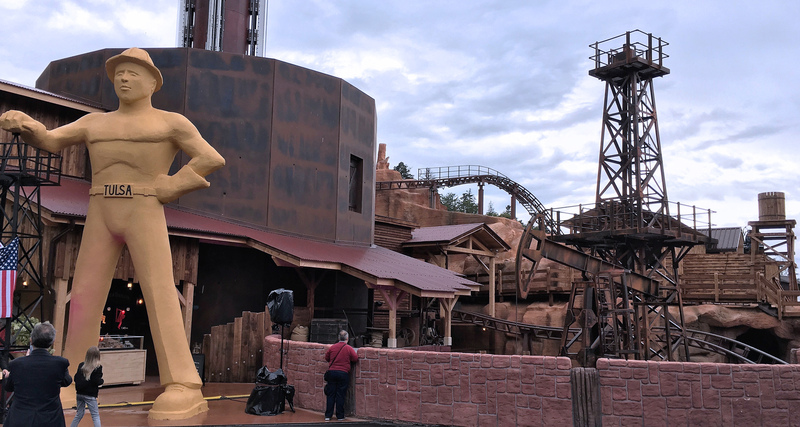 AAB produced all the rock decors for the latest “Wodan” roller coaster, the structure of which was made completely of wood. 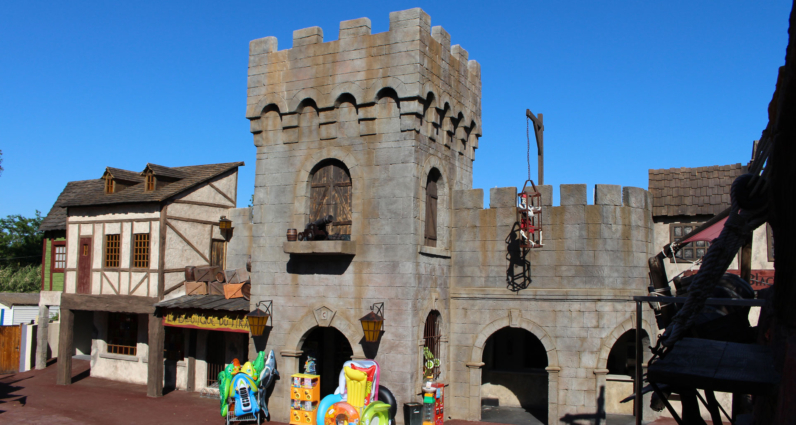 Arthur In The Minimoys Kingdom is an inverted roller coaster from Mack Rides. 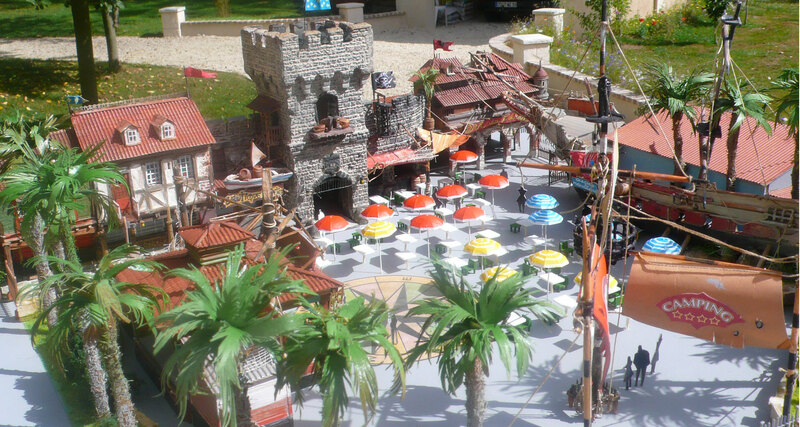 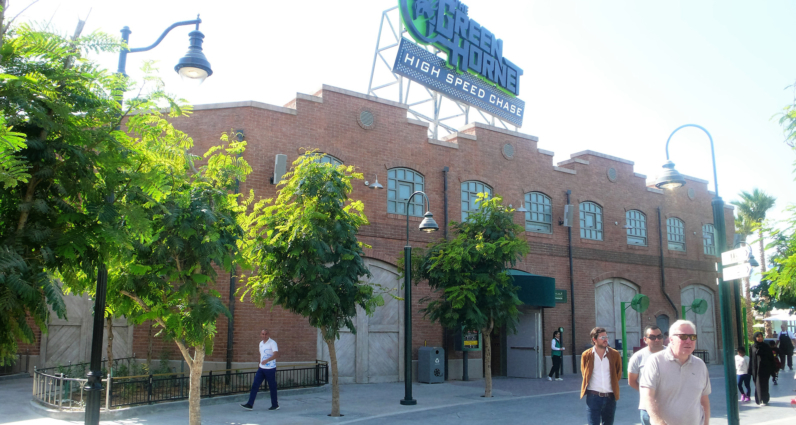 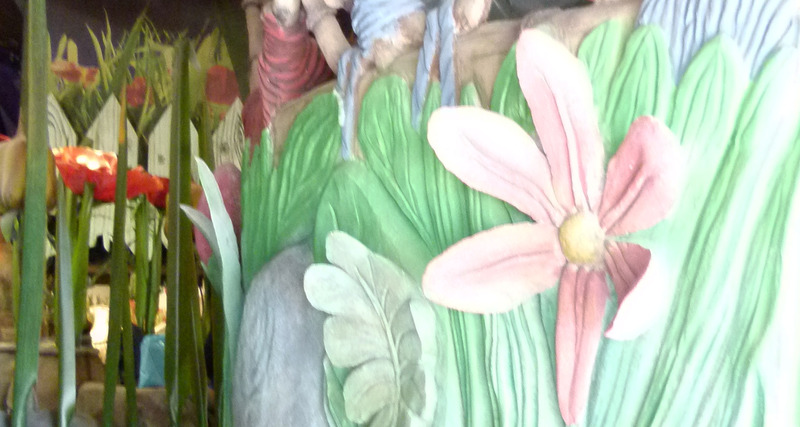 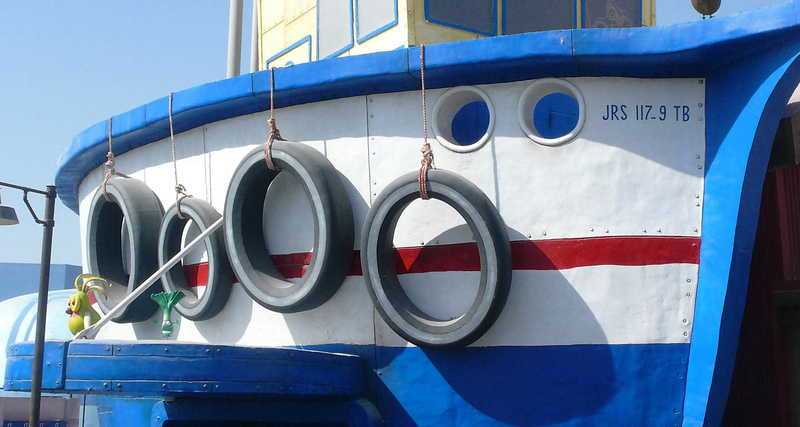 AAB produced the decors for the amusement ride. 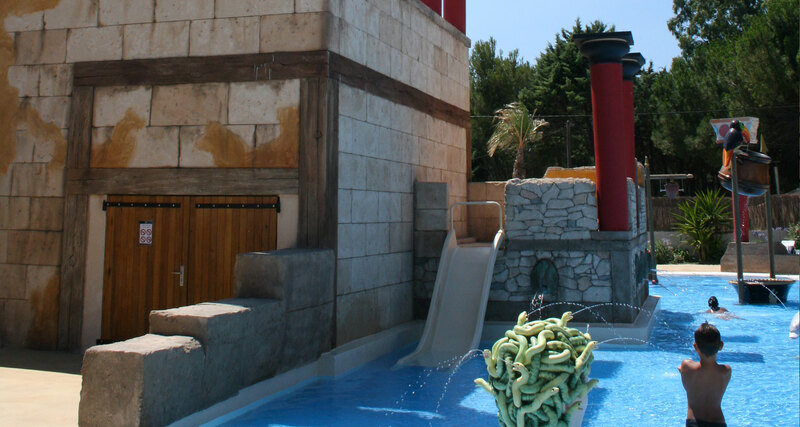 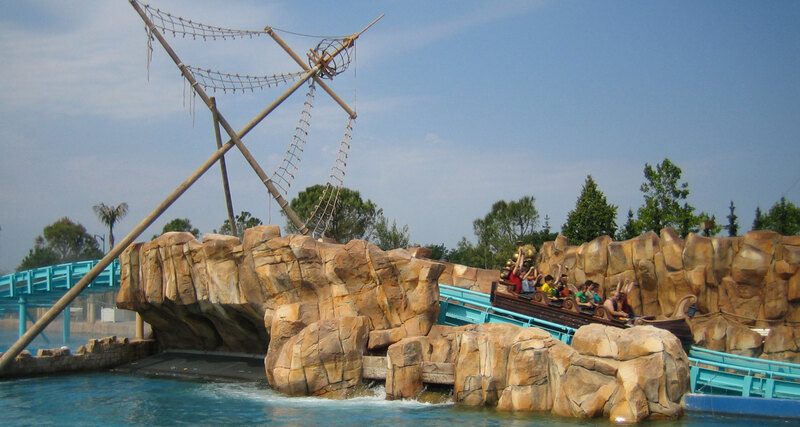 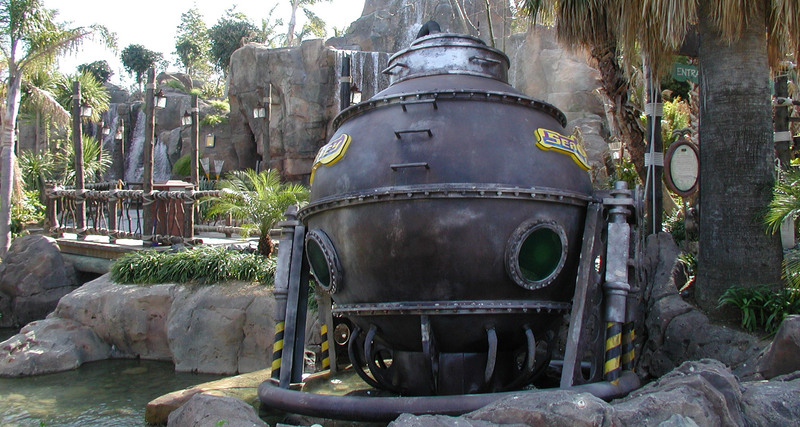 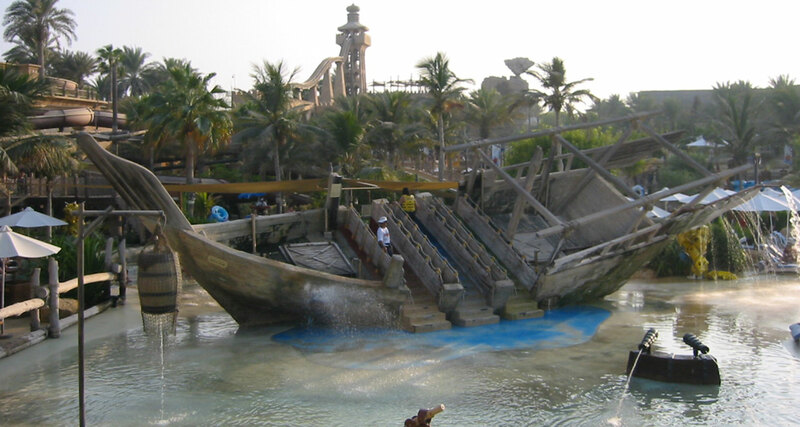 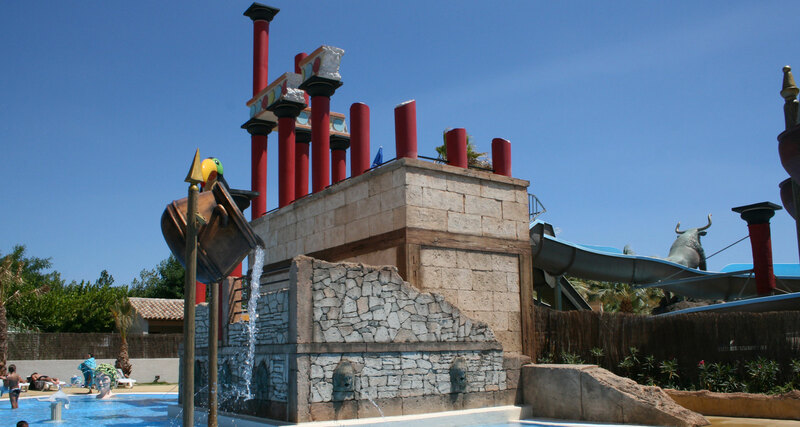 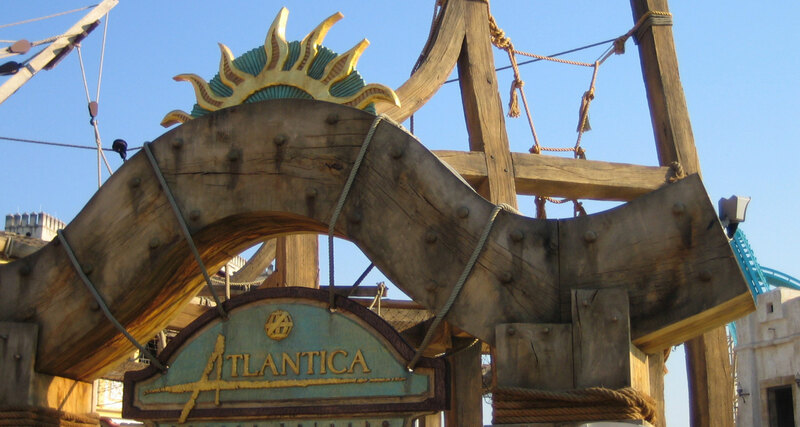 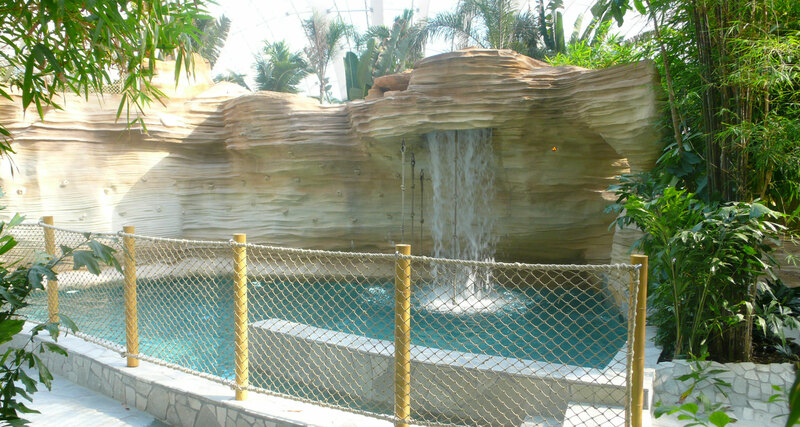 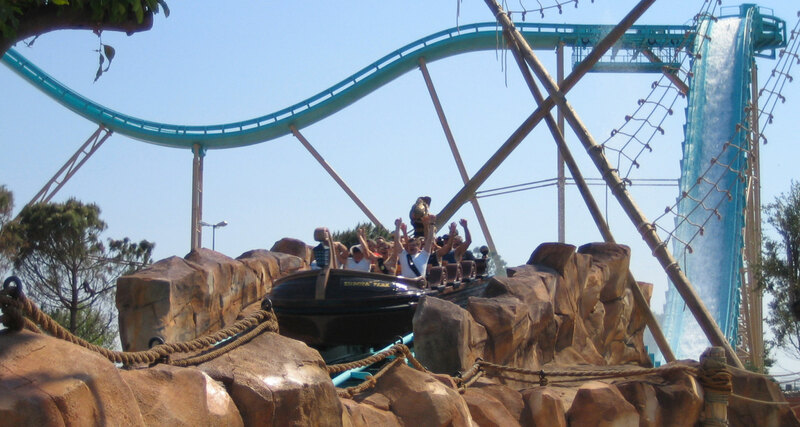 Atlantica Supersplash : this is a super splash built by Mack Rides, which was inaugurated for the 30 years of the park. 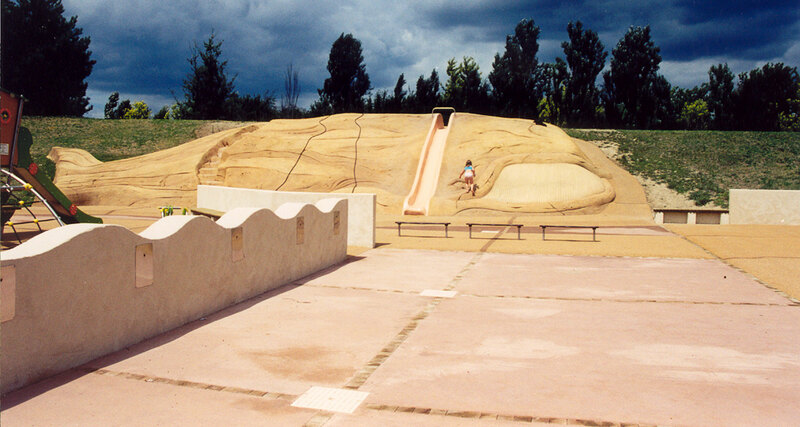 It offers the particularity of having two descents, one behind. 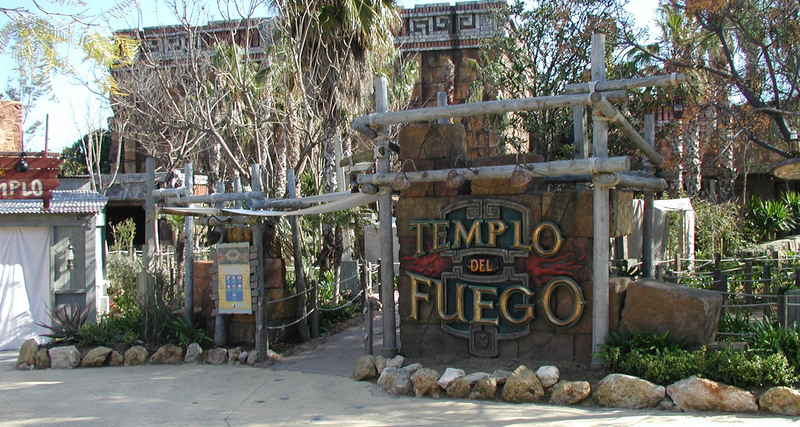 This attraction is located in the Portugal area of the park. 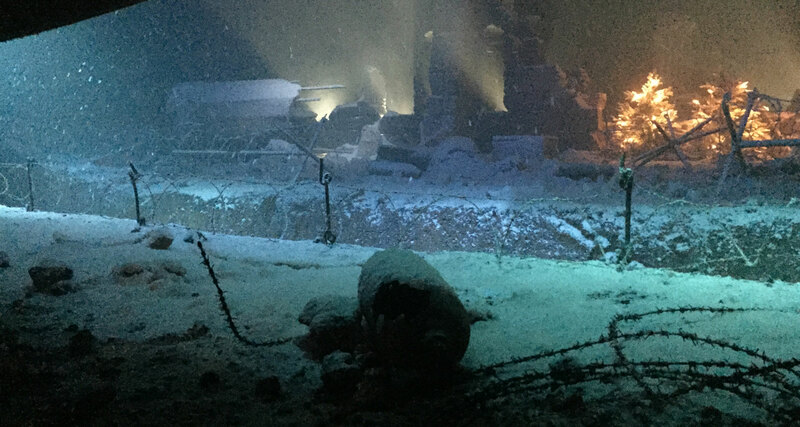 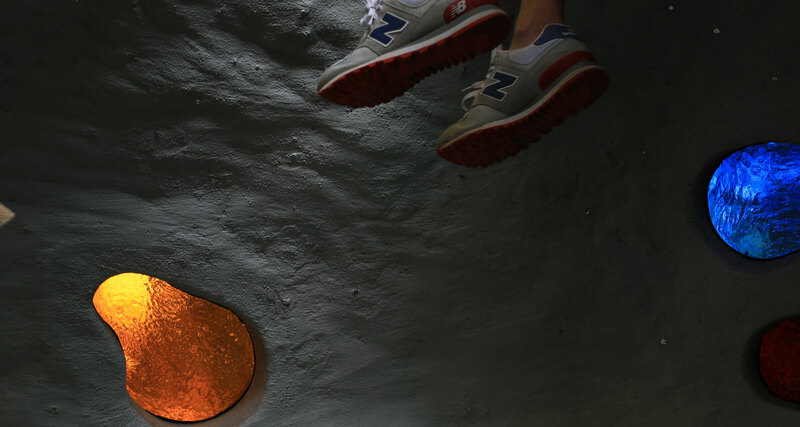 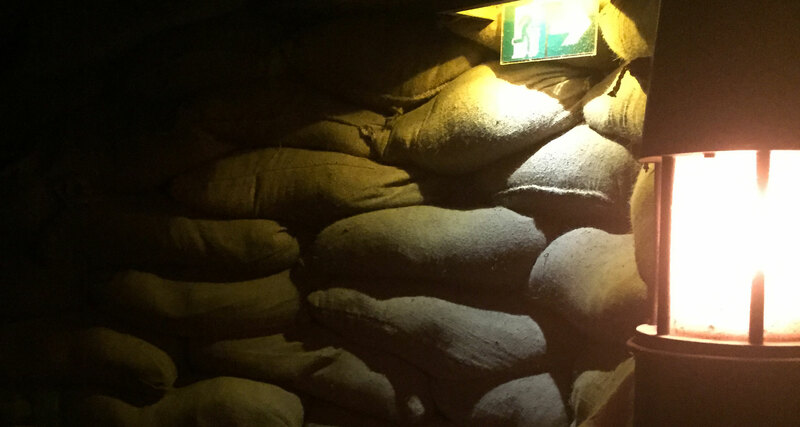 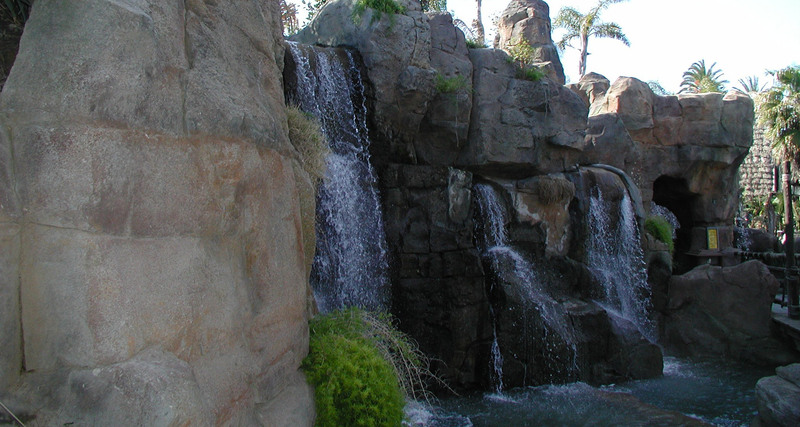 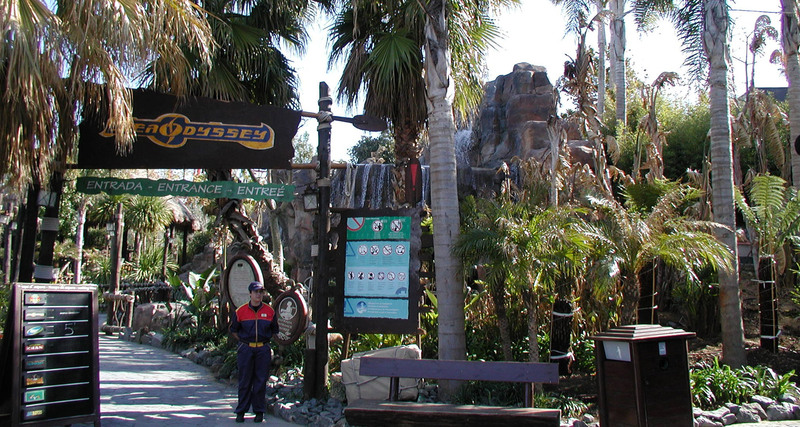 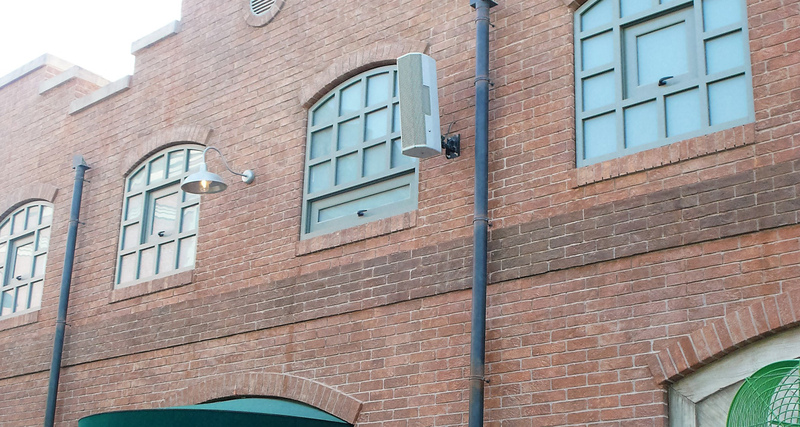 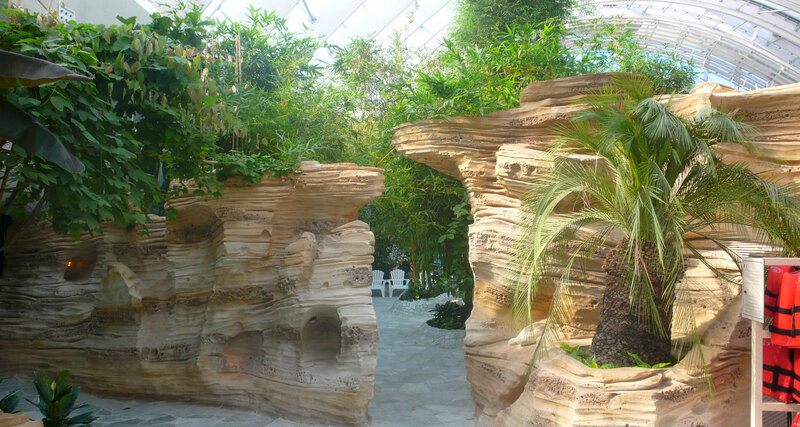 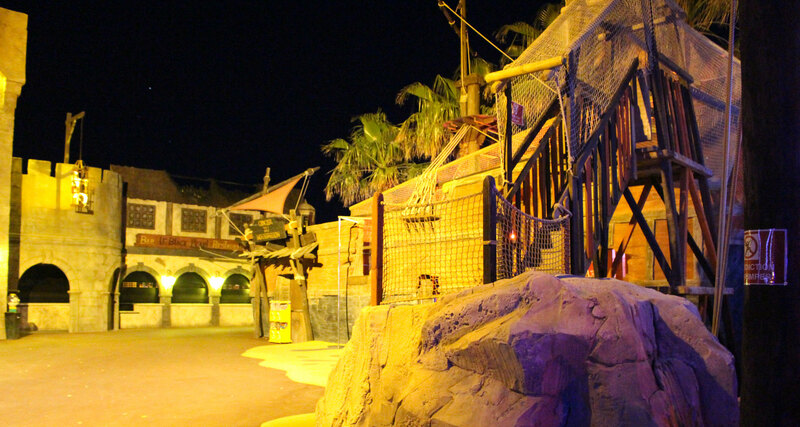 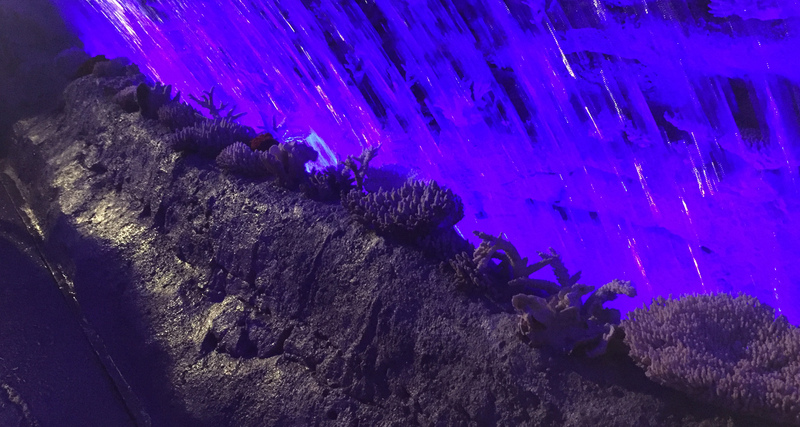 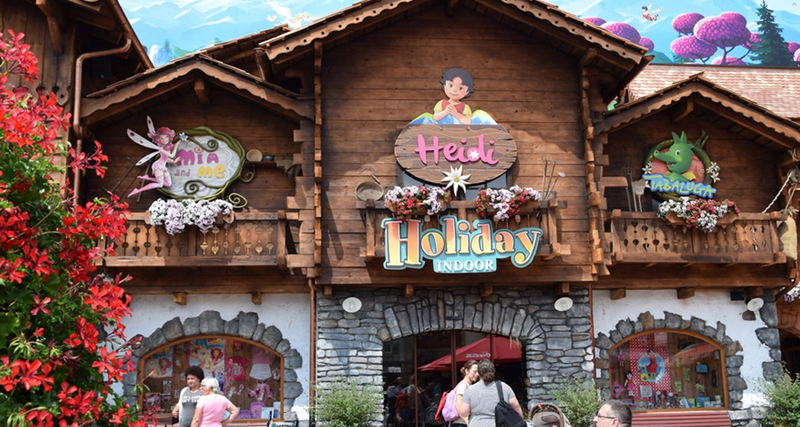 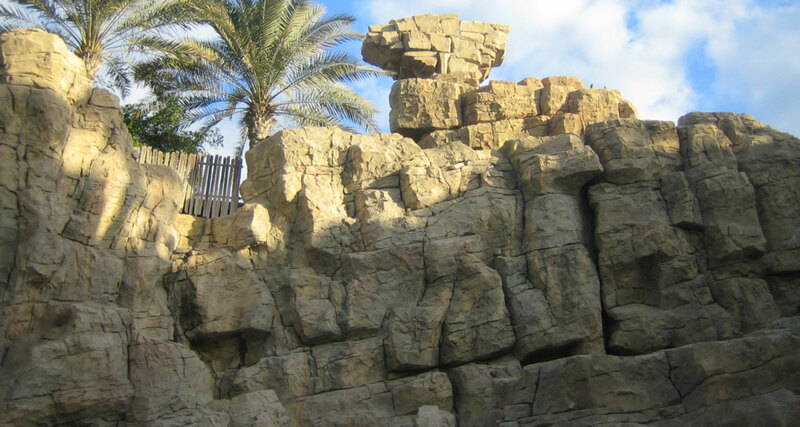 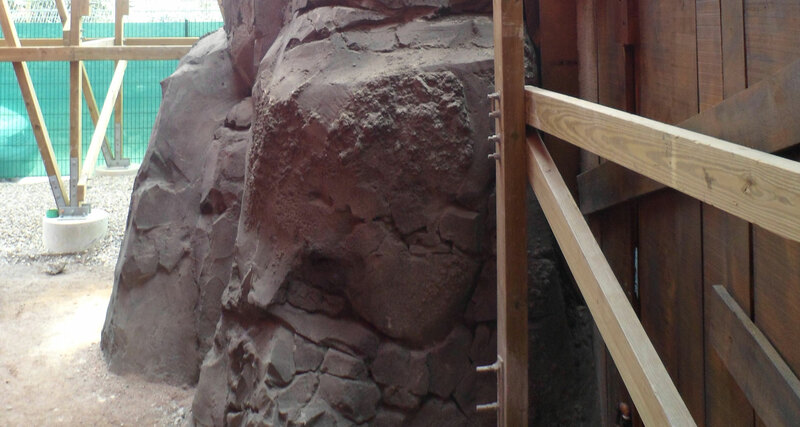 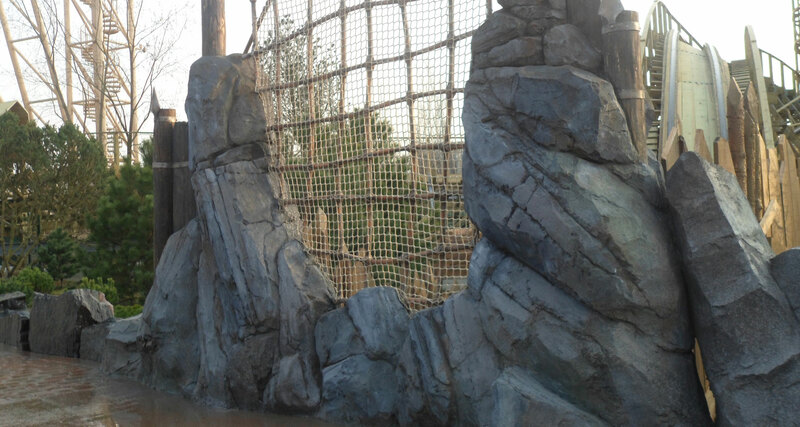 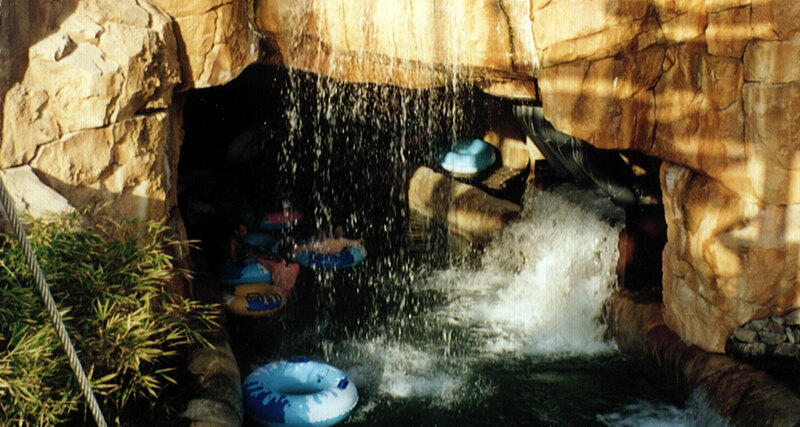 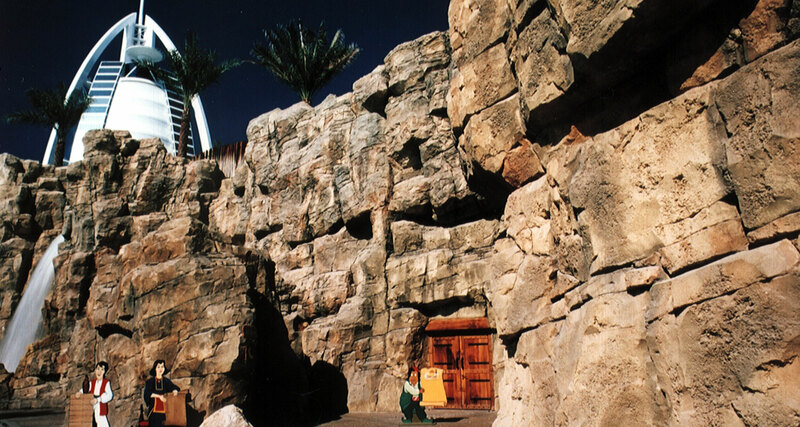 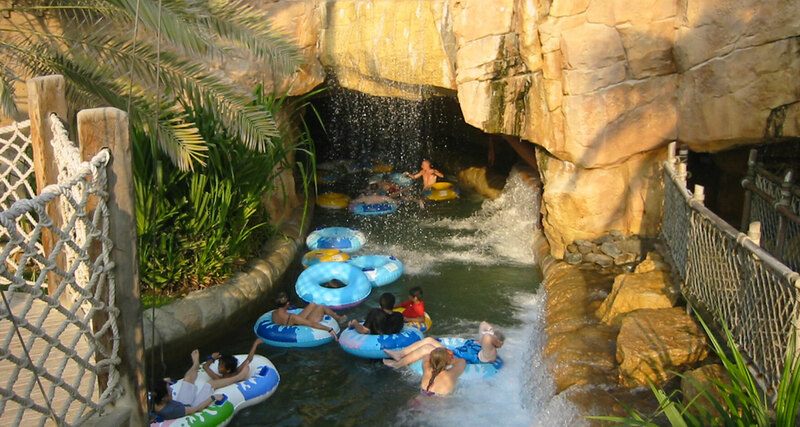 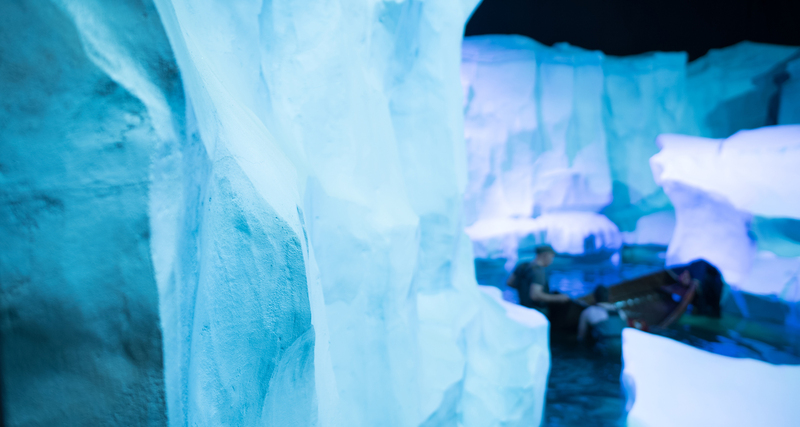 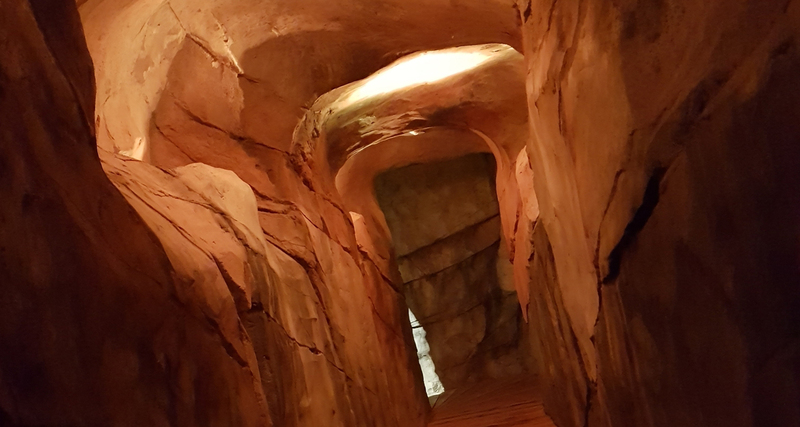 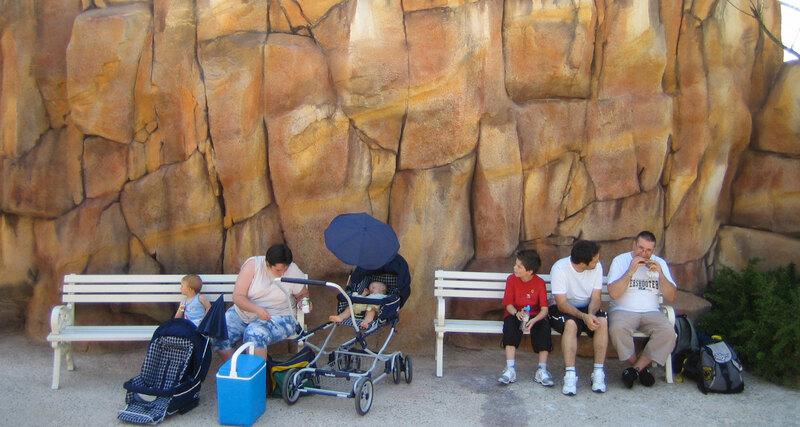 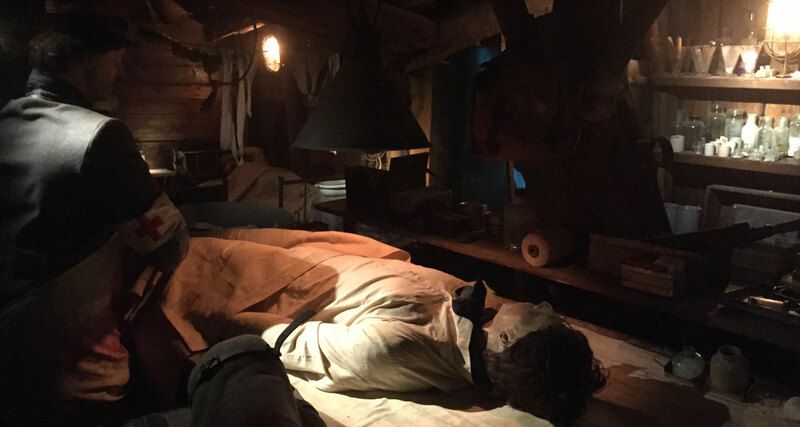 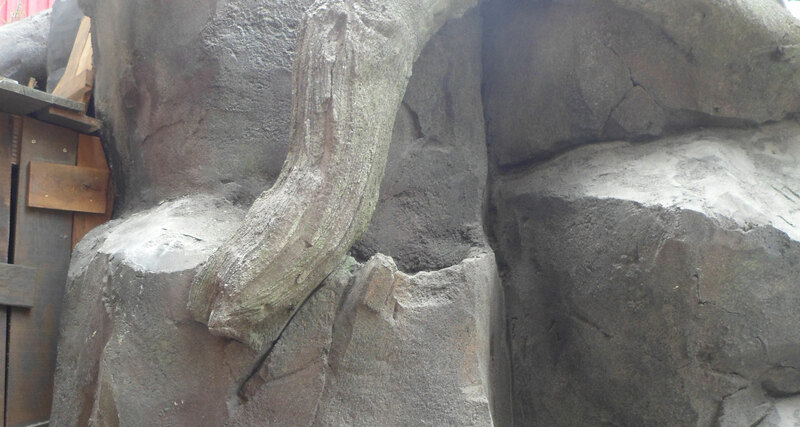 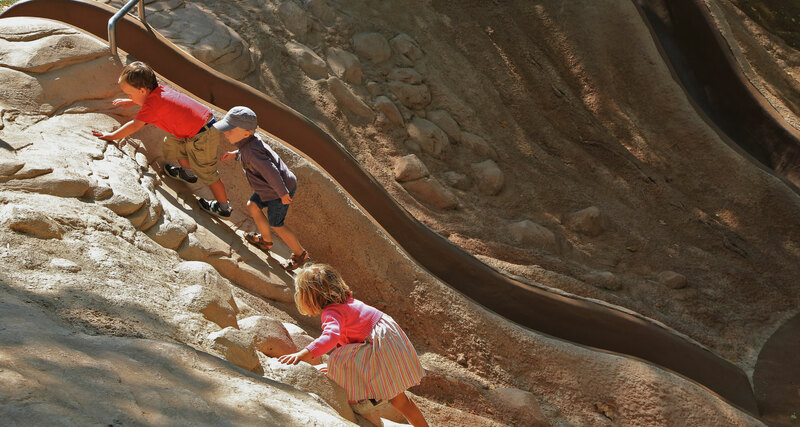 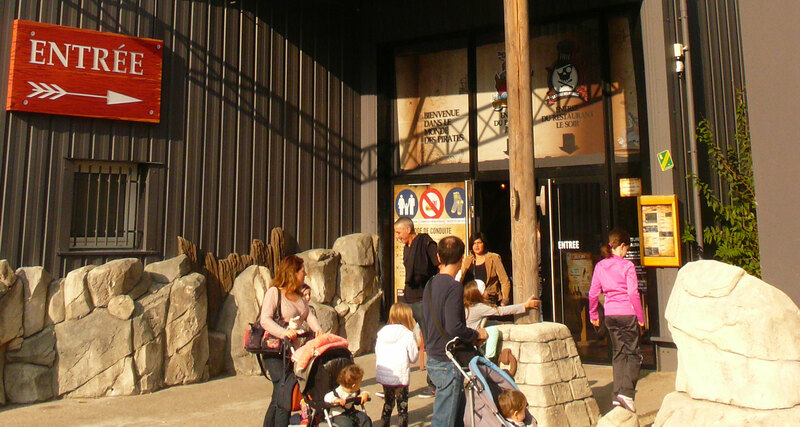 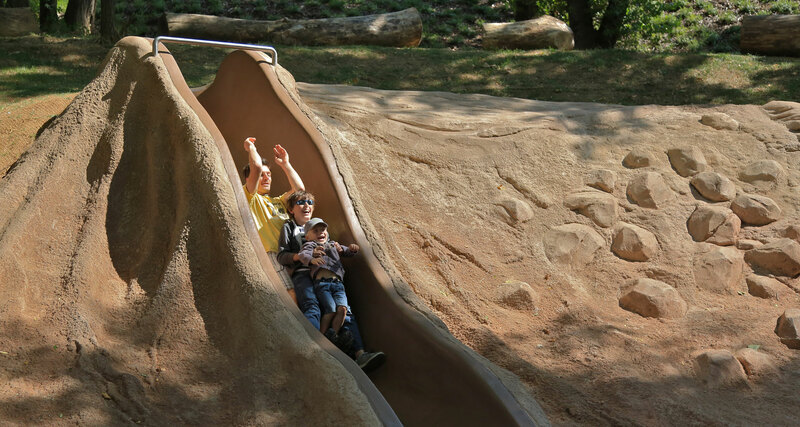 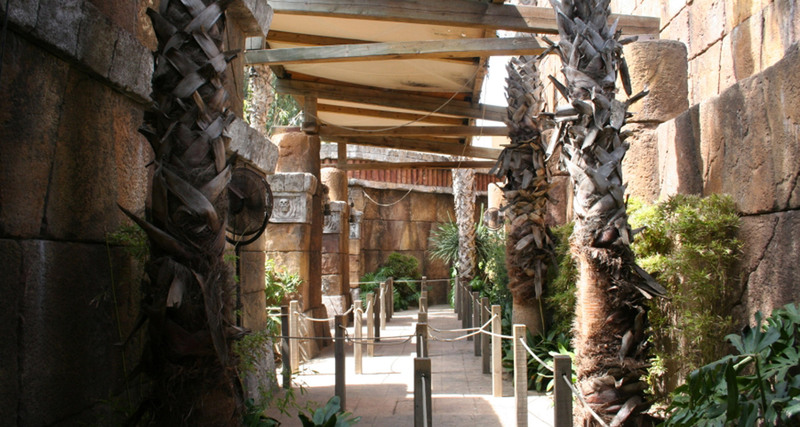 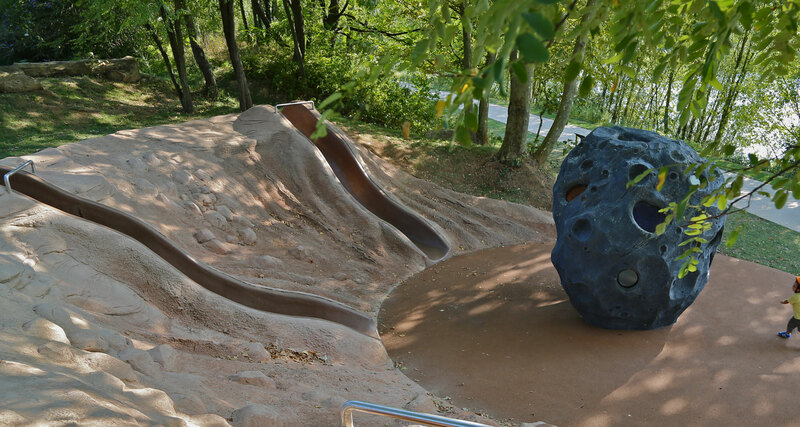 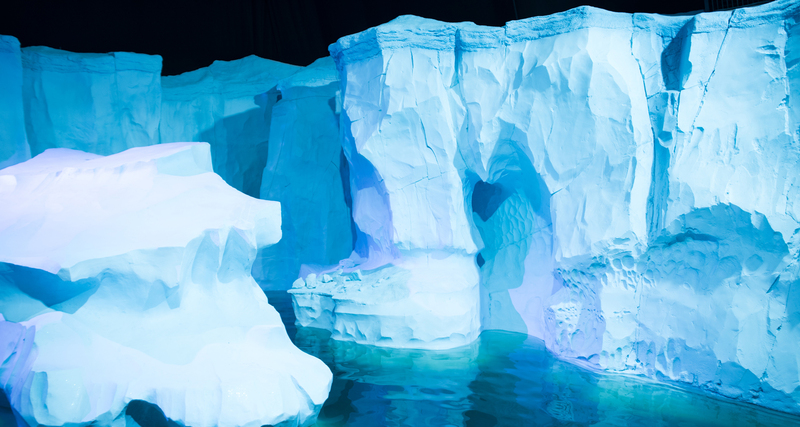 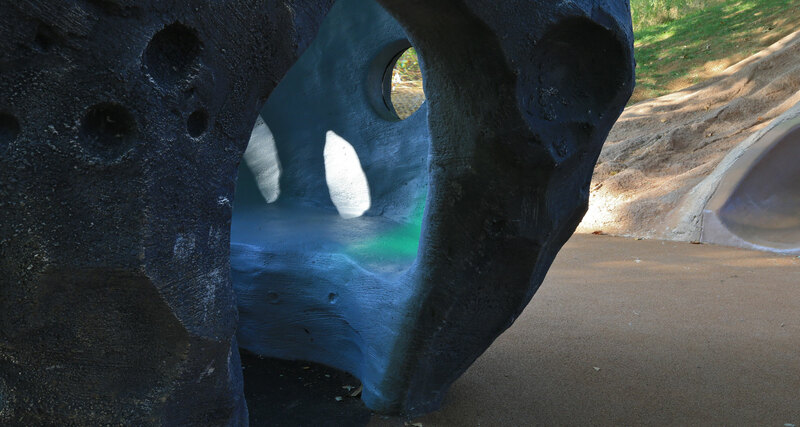 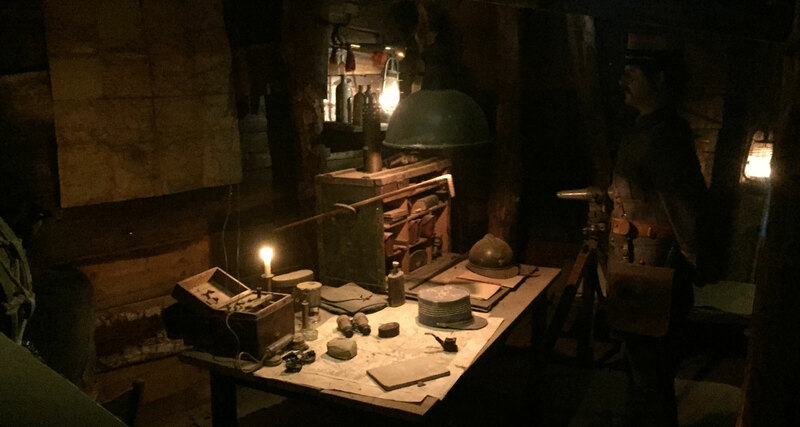 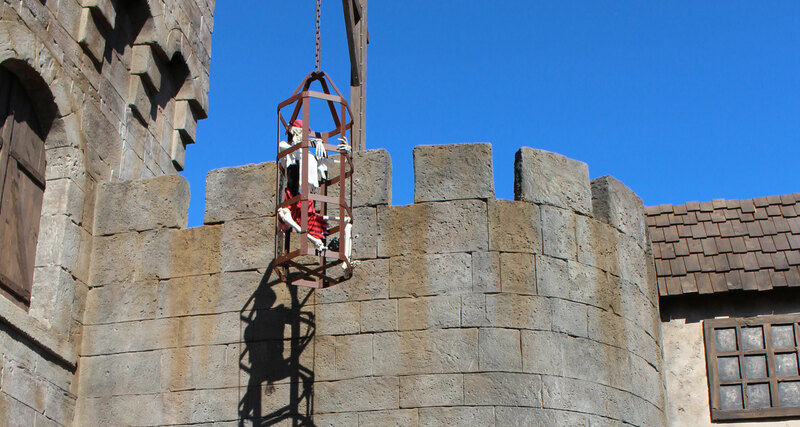 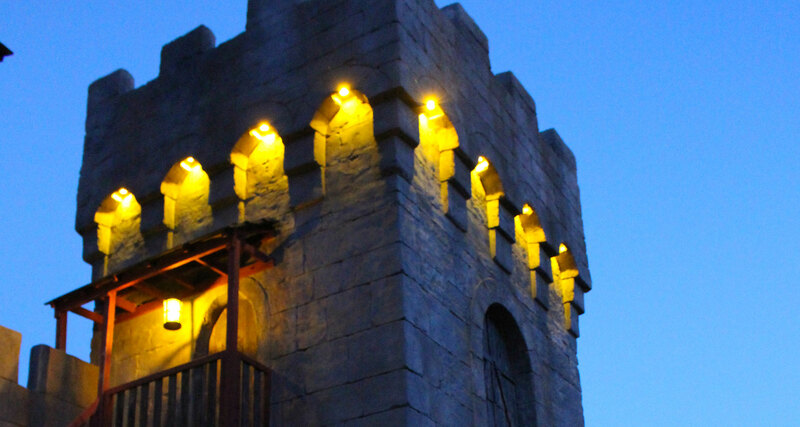 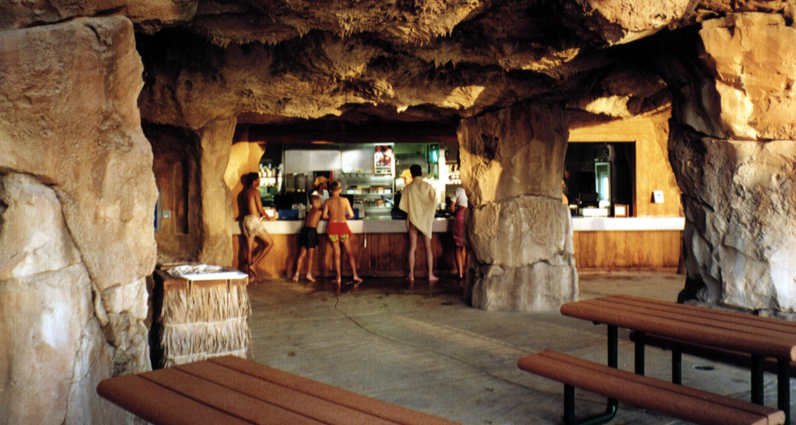 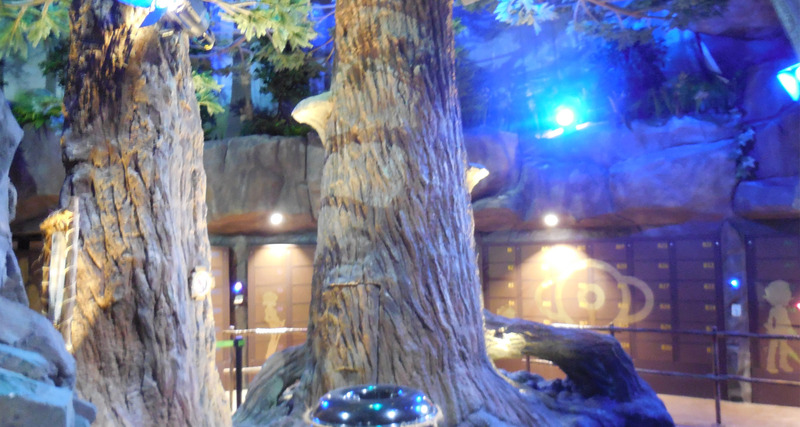 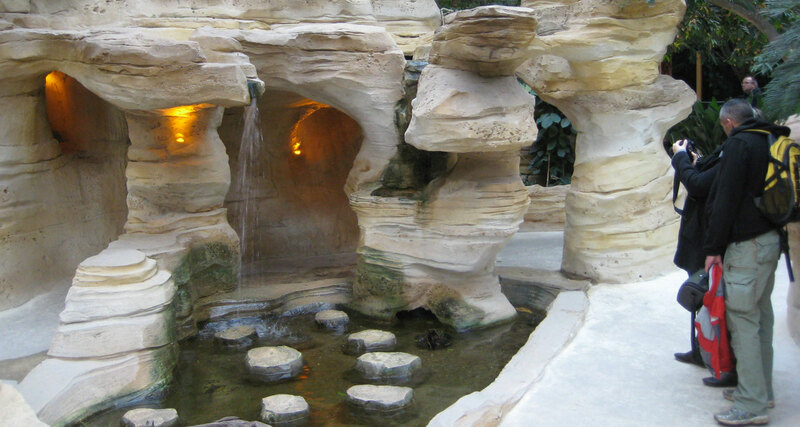 The company AAB realized all the rocky scenery of the attraction as well as artificial rocks in the area around the attraction. 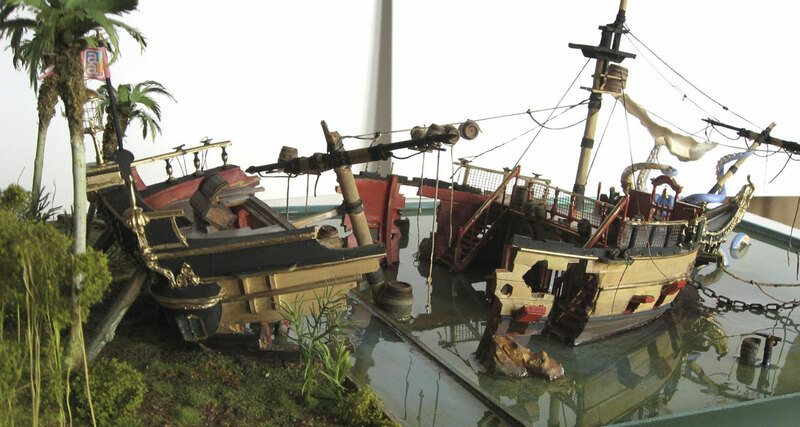 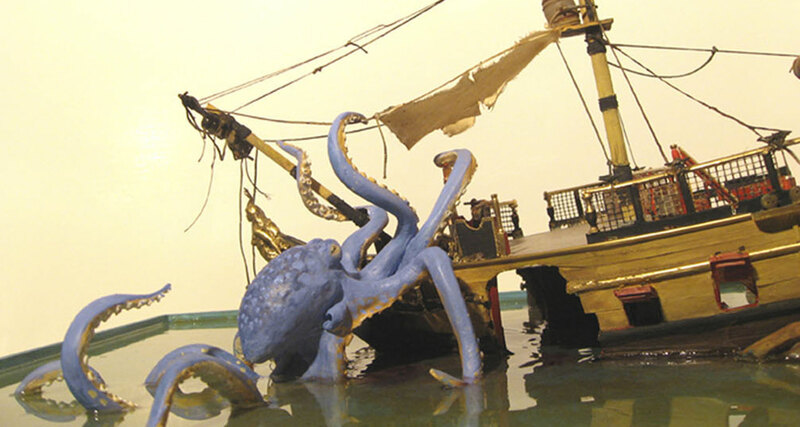 The AAB company has also reconstructed a real sized 14th century Portuguese galleon called the Santa Marian. 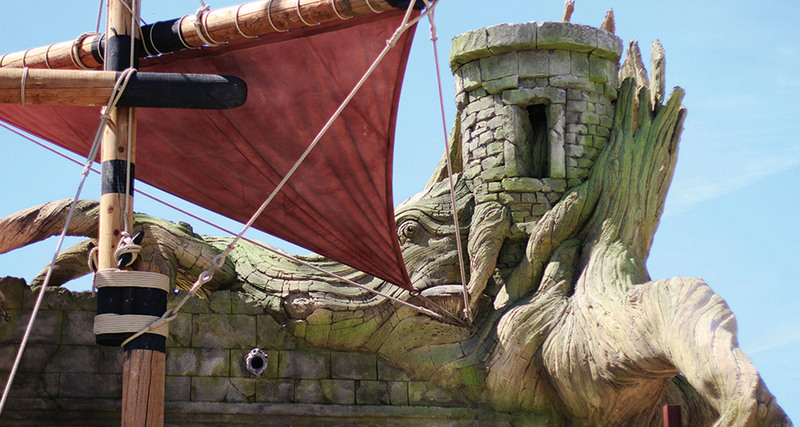 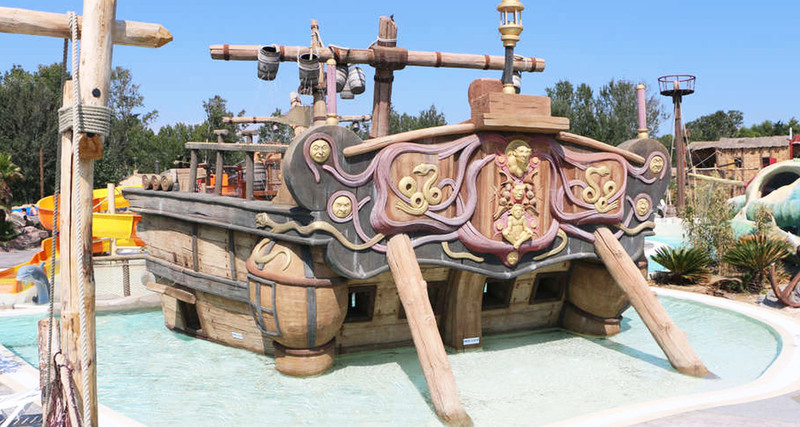 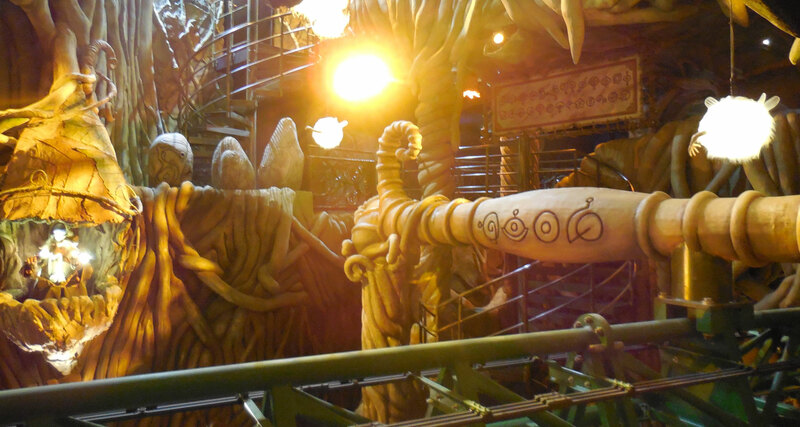 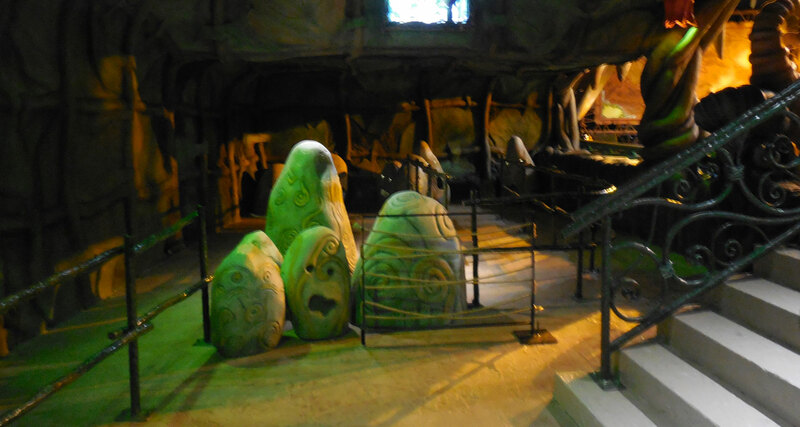 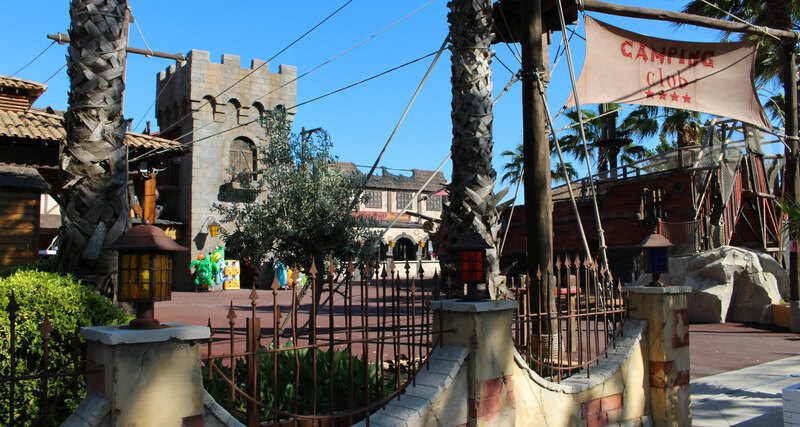 This galleon that represents the queue to access the attraction was made of carved concrete wood look. 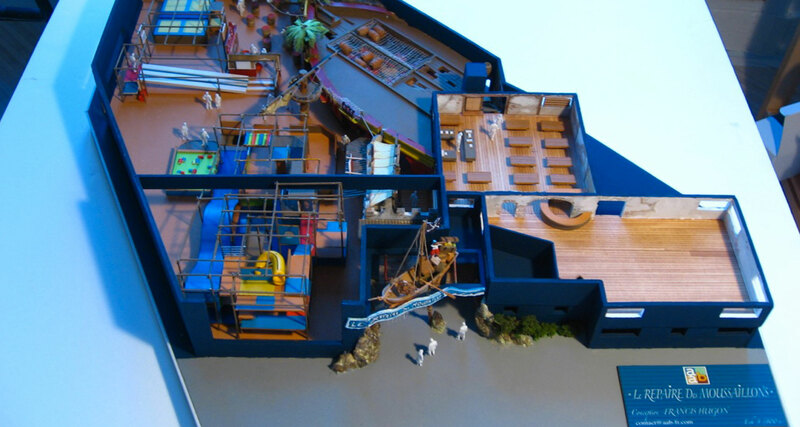 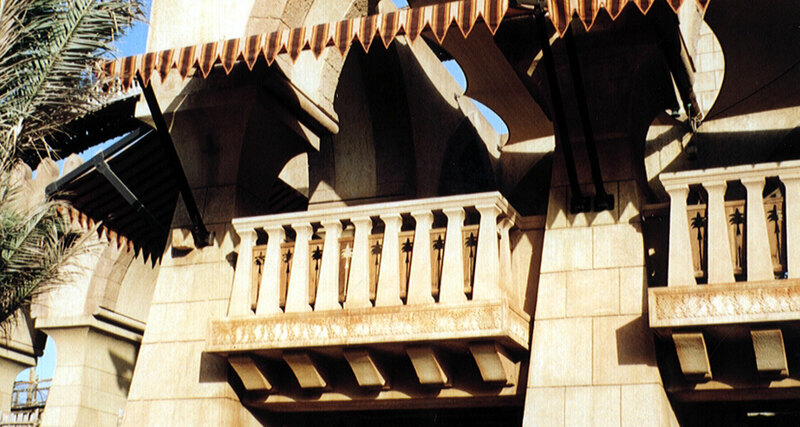 To materialize this approach, AAB produced rough 3D models which were used as a guide on site. 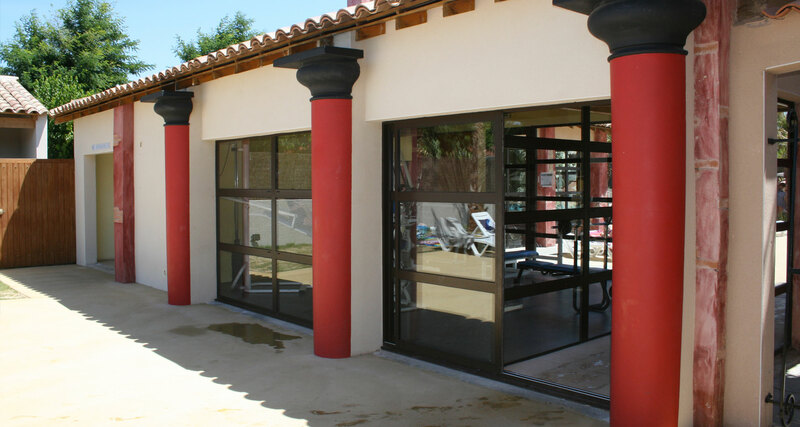 To define the project with the client, AAB produced various perspective views to obtain an initial approach. 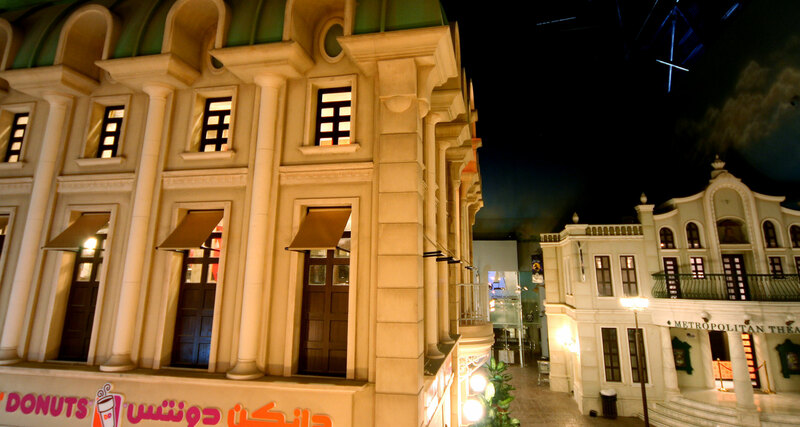 Facades Execution of the building facades. 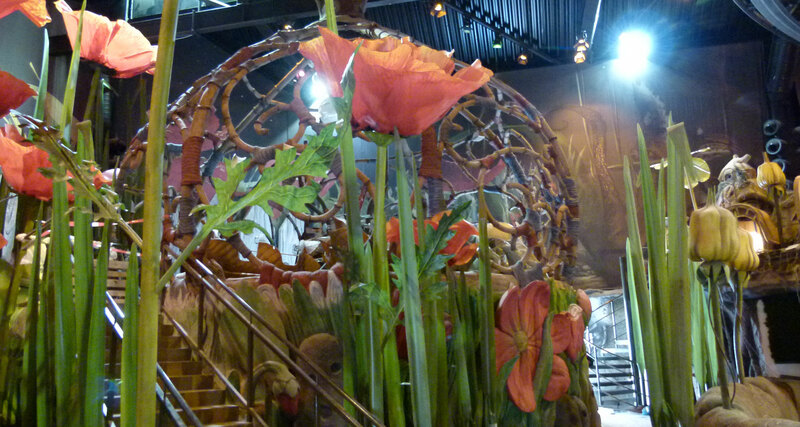 Production of decors for the entertainment area. 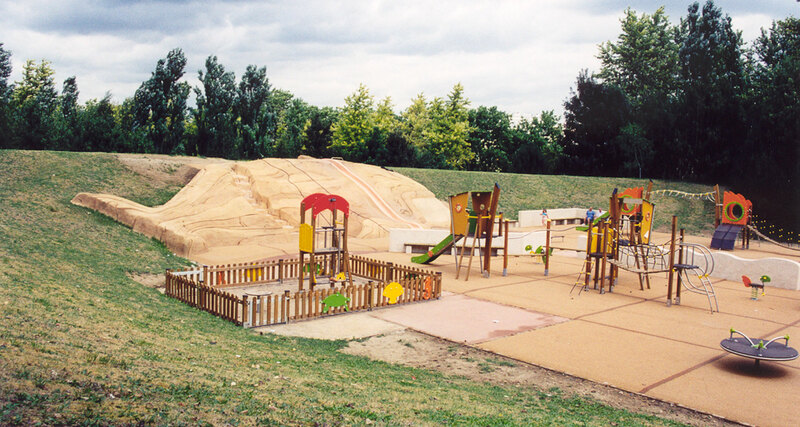 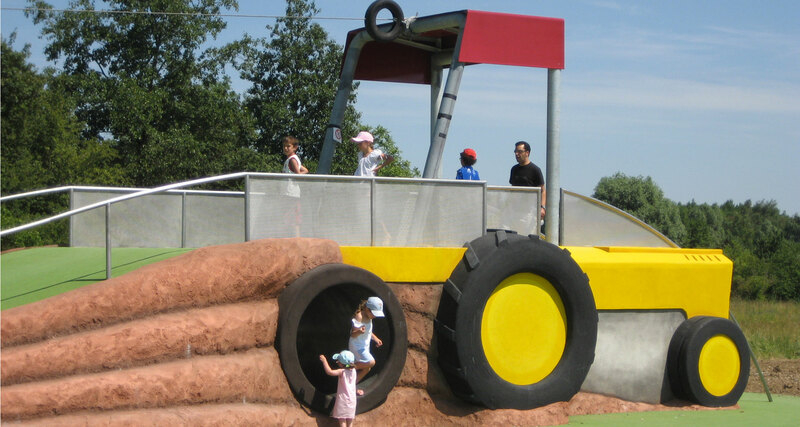 Development of a play area for children. 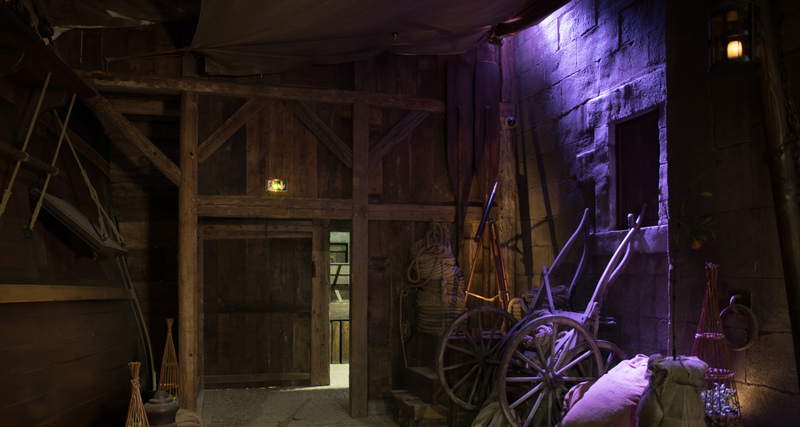 – Ploughed earth and tractor decoration. 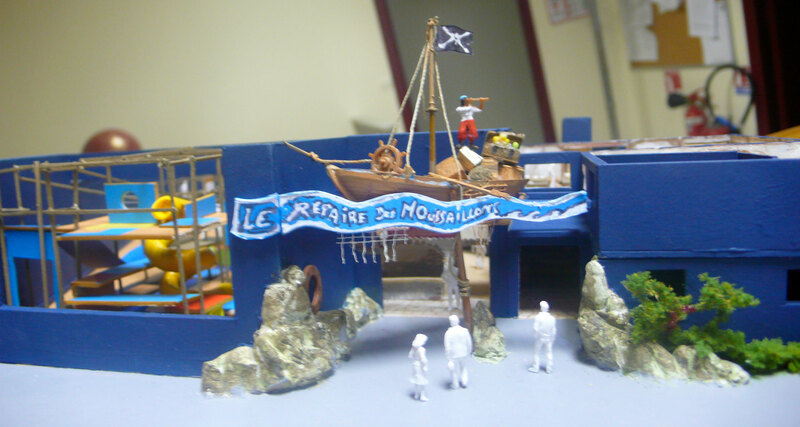 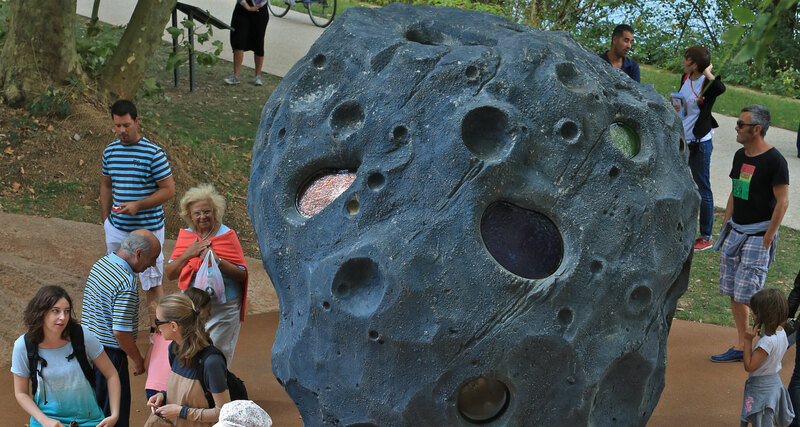 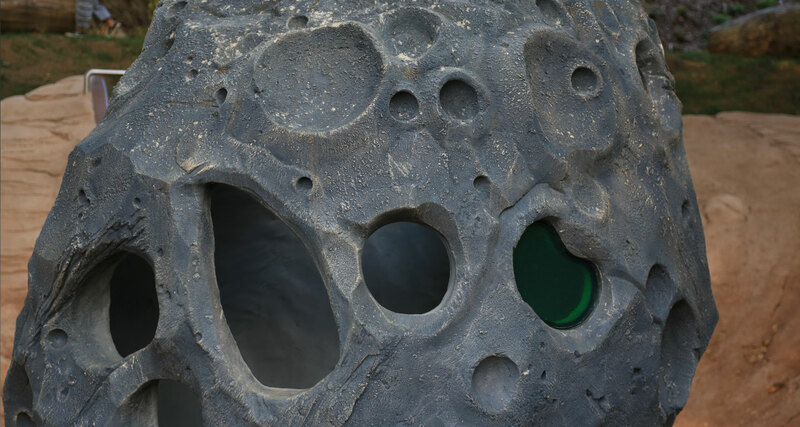 Production of a work called “LE GENIALITHE” by the artist Le Gentil Garçon, Reproduction in shotcrete of Le Gentil Garçon’s work “La Météorite”. 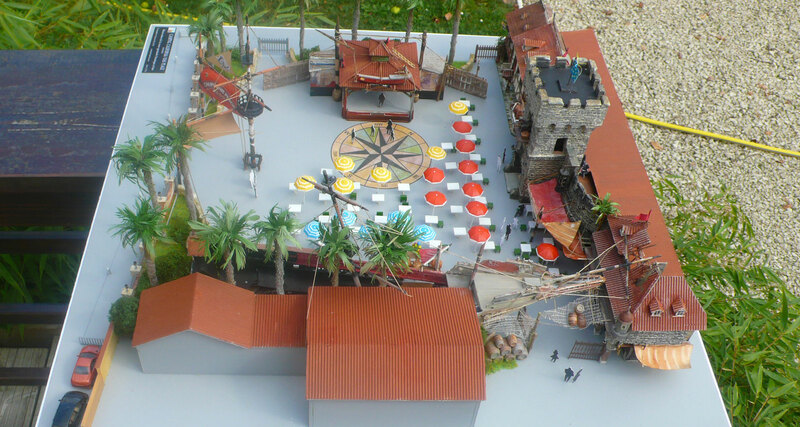 To define the project with the client, AAB produced a rough 3D model which was used as a guide.